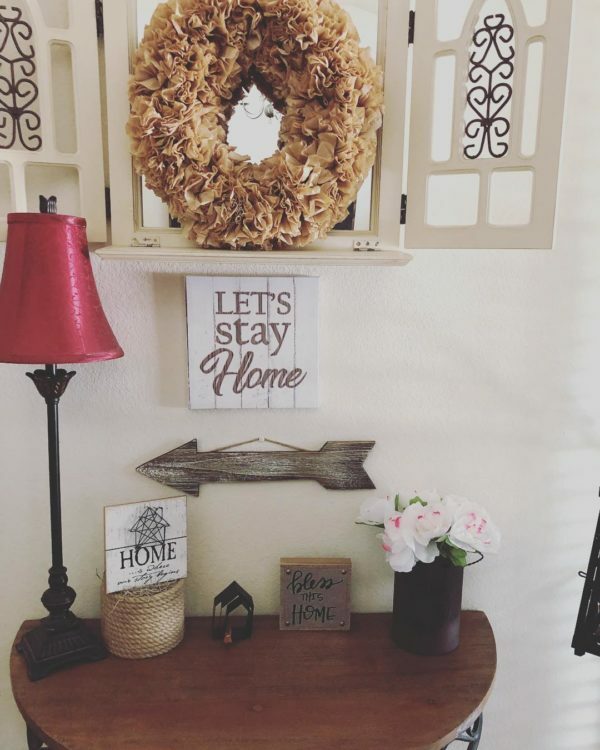 DIY farmhouse home decor is all the hype these days and you can create it at home really easily. 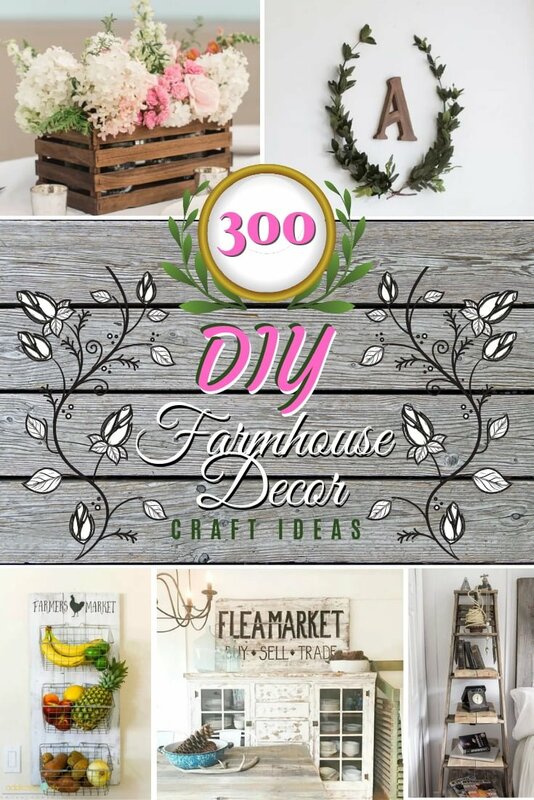 This guide will give you 300 easy craft ideas – most of them with tutorials – that you can readily apply in your own home. Updated for 2019. Even if not fully embracing this style, some accents here and there add a lot of charm. That can be especially said about DIY farmhouse decor. I don’t know what that is – sentimental memories from childhood or new hipster ways to decorate – but it certainly has a lot of appeal. 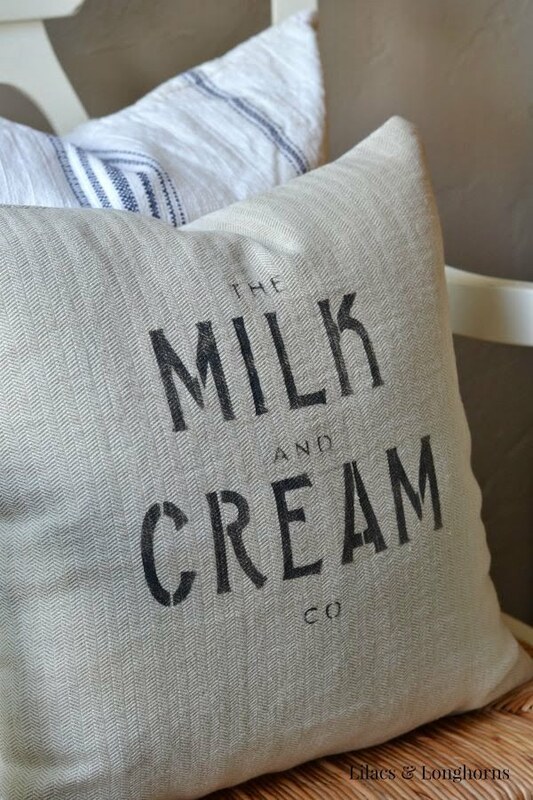 So we’ve made this epic guide on how to decorate your home in farmhouse style yourself. 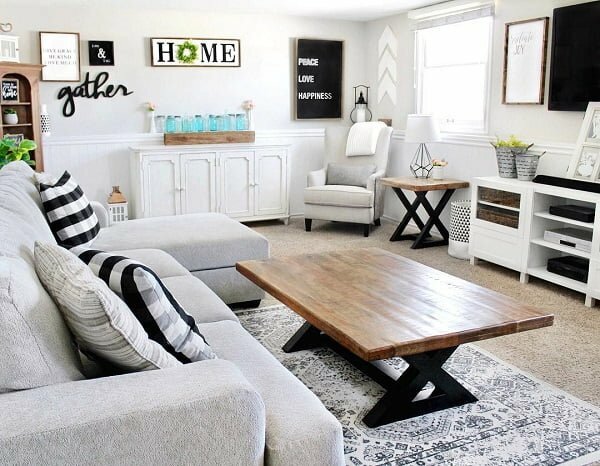 Below you’ll find over 100 DIY tutorials and 200 inspirational ideas for a real DIY farmhouse decor style. This is really one of a kind guide on the internet, so we encourage you to dissect it and peruse it for tons of ideas. Have fun! Heard It Through the Vines! 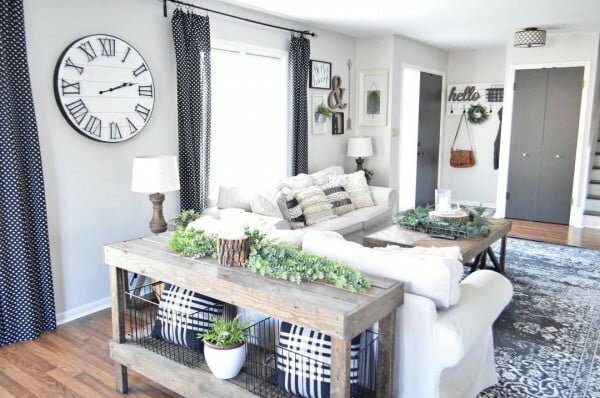 What makes farmhouse decor so attractive as compared to similar shabby chic or rustic styles in general is the absence of rules. 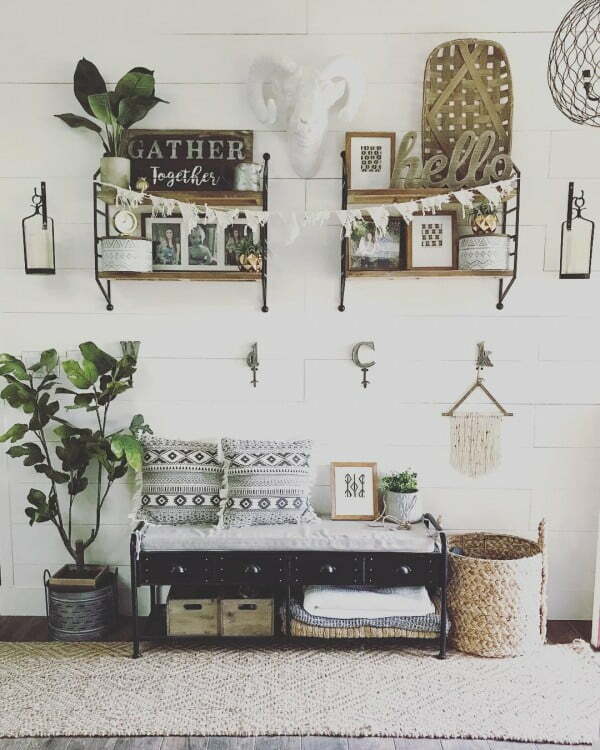 You can have simple rustic accents, mix them with worn down vintage or modern clean pieces and have an aesthetic look. 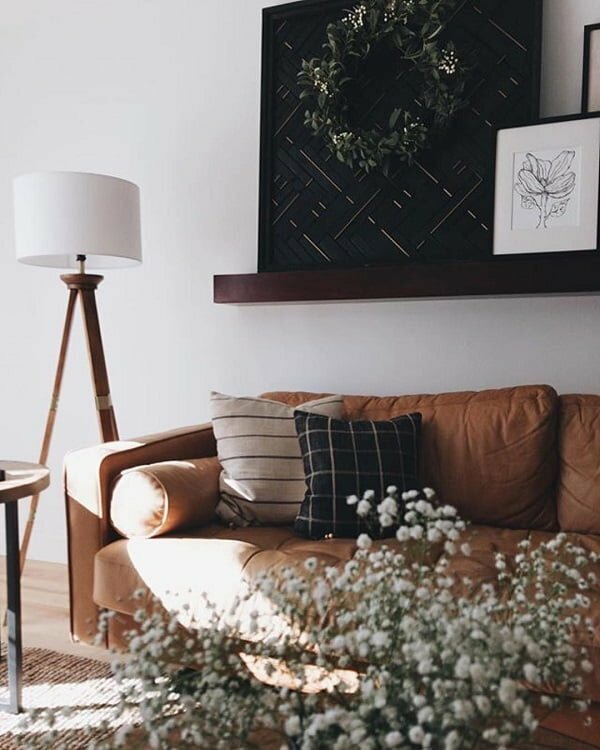 This simplicity with the ability to make a home feel like home is really captivating and we love it. Barn doors can make a great accent decoration for the walls or mantels and as part of decor displays. 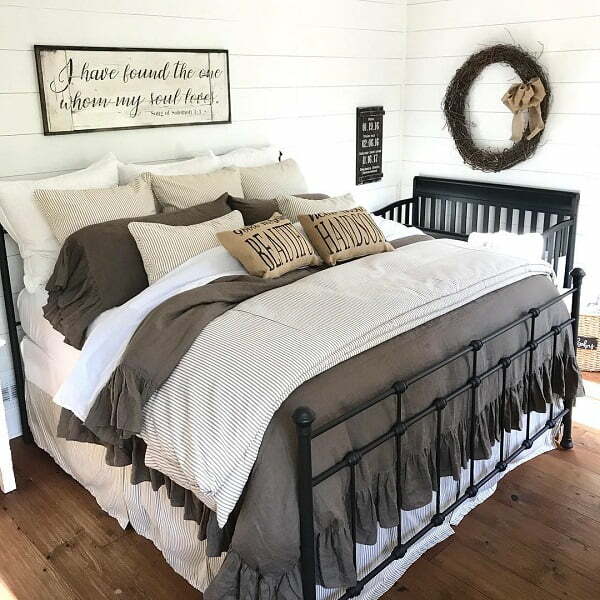 It immediately brings out the farmhouse style and the coziness that comes with it. 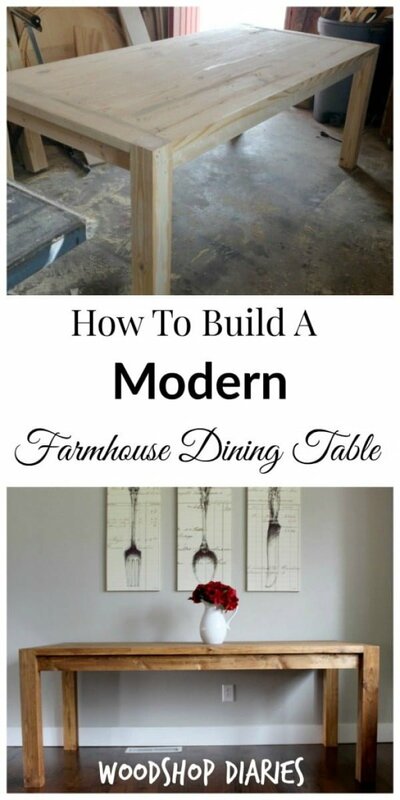 As a more elaborate project, those of you who like wood-crafting will love this DIY farmhouse table. 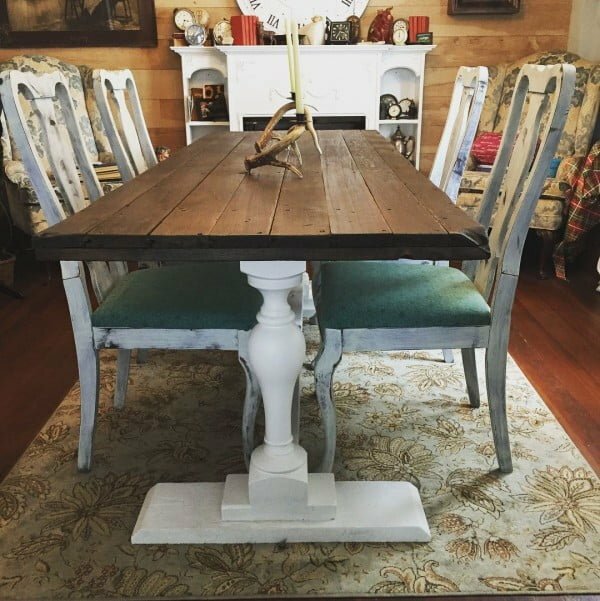 It will transform any dining area into a real farmhouse style marvel. 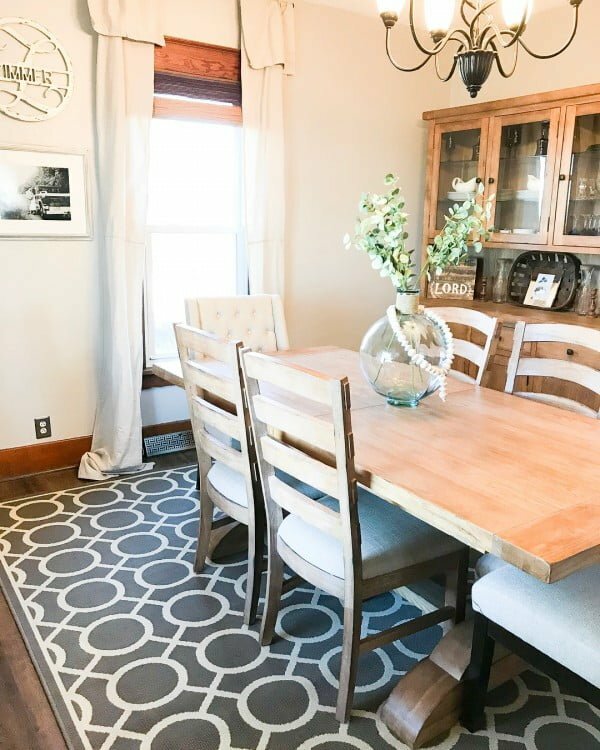 Small accents like a placemat are always welcome to infuse some farmhouse style to your decor in a subtle way. You don’t always have to go all in to embrace the style and enjoy just small parts of it. 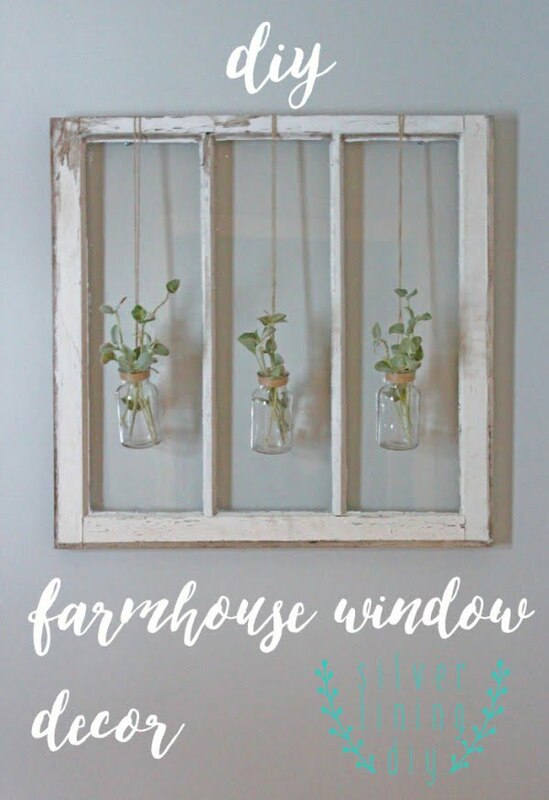 An old window frame has always been one of the icons of farmhouse style decor. 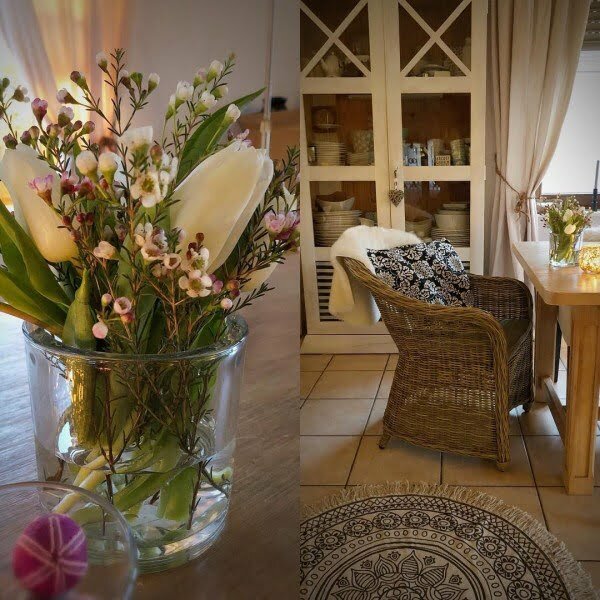 It’s rustic simplicity is always attractive and we love having an extra virtual window that we can embellish with flowers. Looking for an interesting but cheap way to make your decor interesting? 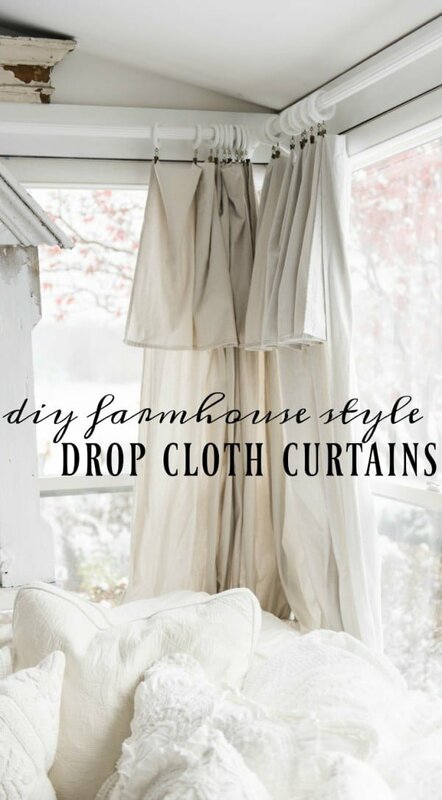 Create drop cloth curtains for a touch of farmhouse decor. 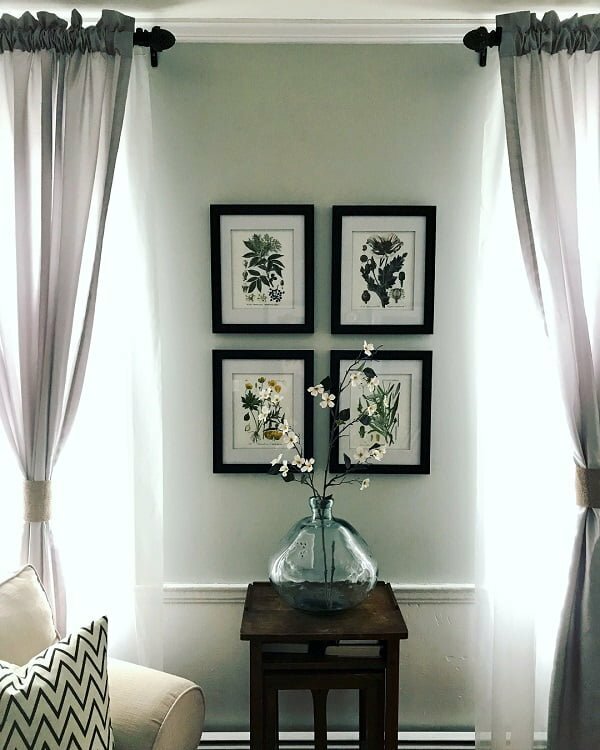 Look down the list to find an attractive curtain rod idea to go with it. 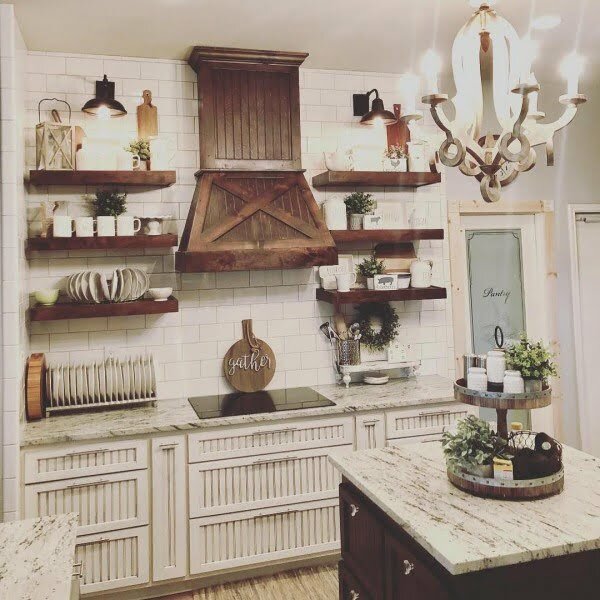 Make your shelves more attractive with rustic corbels which create lovely farmhouse style accents. For such a simple addition to your decor it has quite a big visual impact. 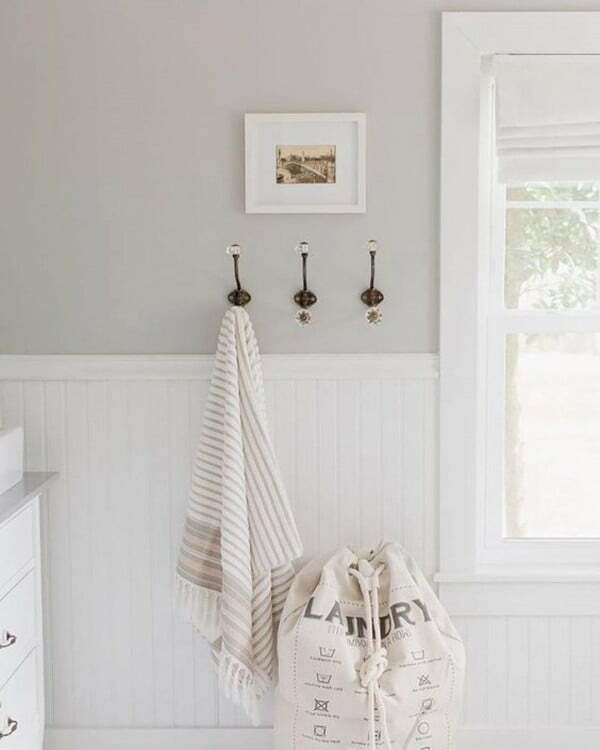 While there are many decor ideas for the farmhouse bathroom, one of the easiest and quickest is to add bathroom hooks for towels. 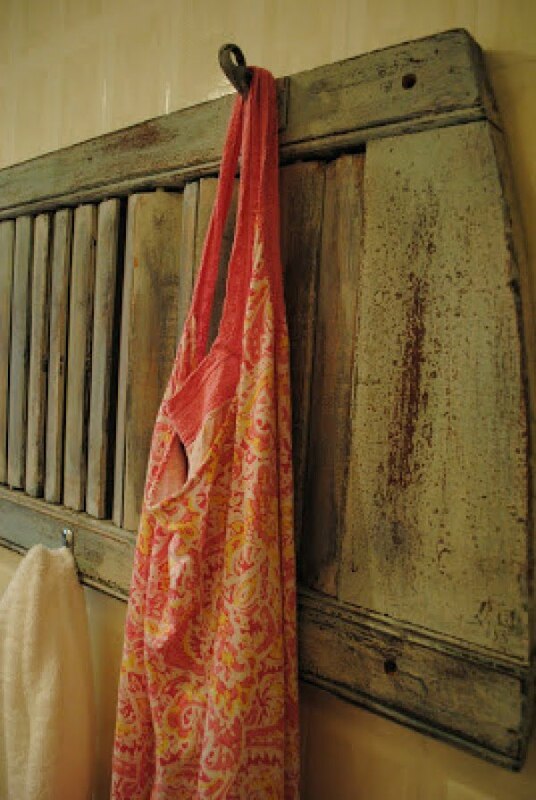 We’ve had the drop cloth curtains on the list, here’s the farmhouse style curtain rod to complete the look. Even if you’re not a fan of drop cloth curtains, this rod will add a nice accent for any style of drapery. 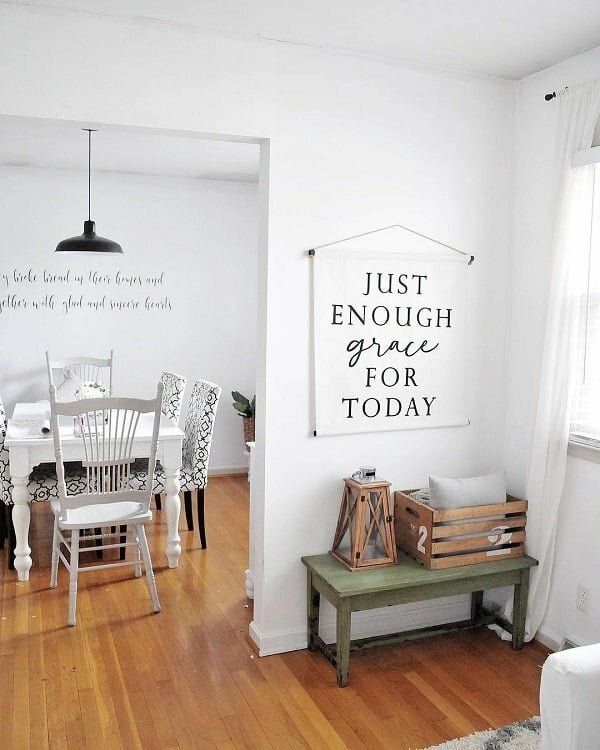 It seems that a farmhouse sign is a must if you want to go with the style in your home decor. It’s easy to make so here’s a tutorial for you to follow. 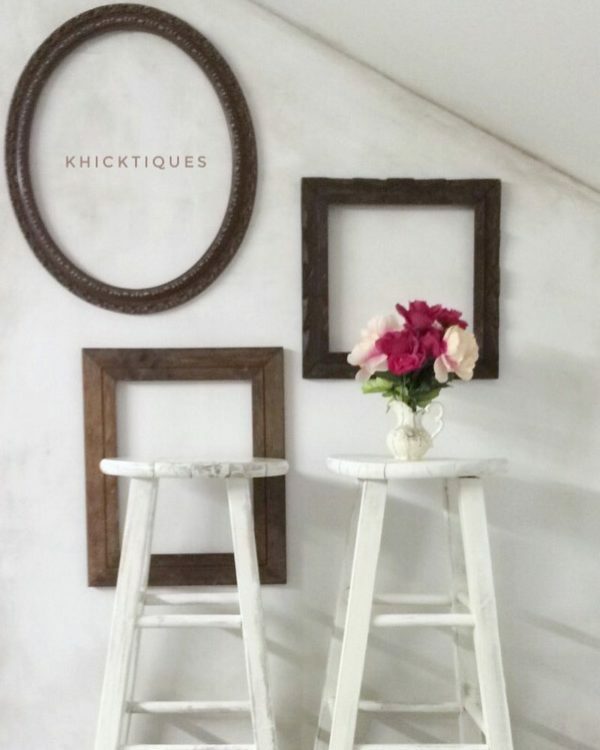 This rustic stepladder side table is truly gorgeous and we love it. 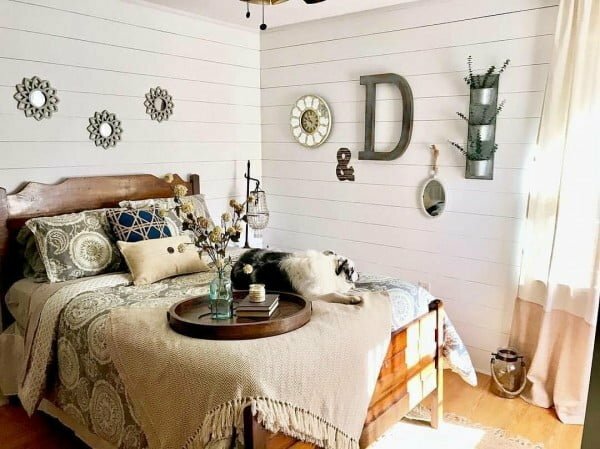 Build it for your complete farmhouse bedroom look. 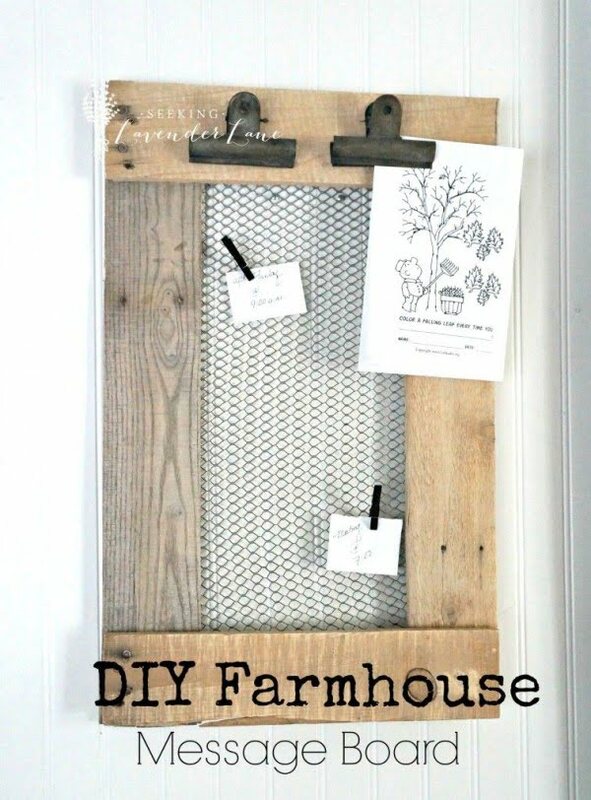 Here’s another idea to decorate your walls in farmhouse style. A rustic frame with a mason jar of white spring flowers. It gives an illusion of a shadow box which adds depth to this wonderful decor accent. 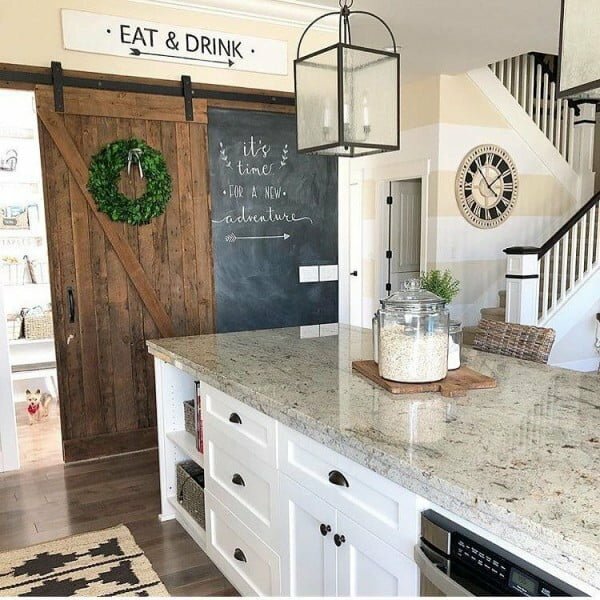 Sliding barn door has to be the staple of farmhouse style decor, so if you’re going after this style you have to have it at home. Here’s a tutorial how to do it. 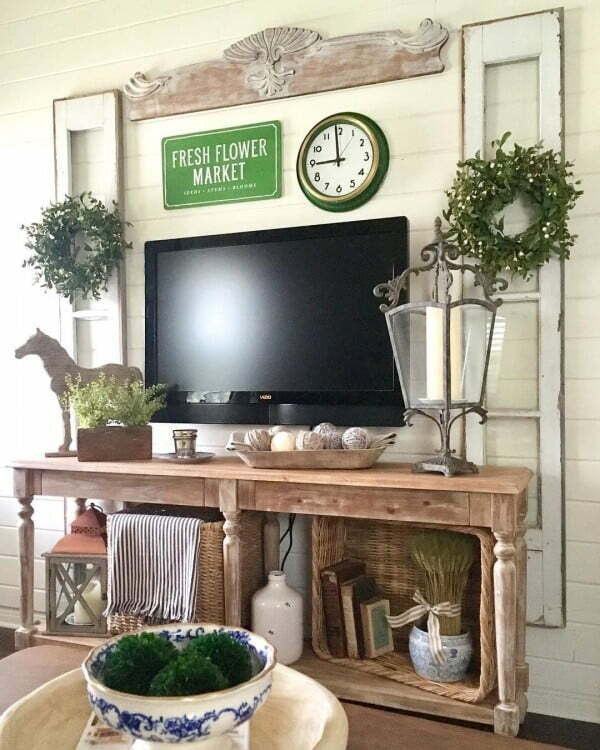 Wood plays a major role in farmhouse decor so we have a lot of elements of it. That means not only pieces of furniture but decorative accents as well. 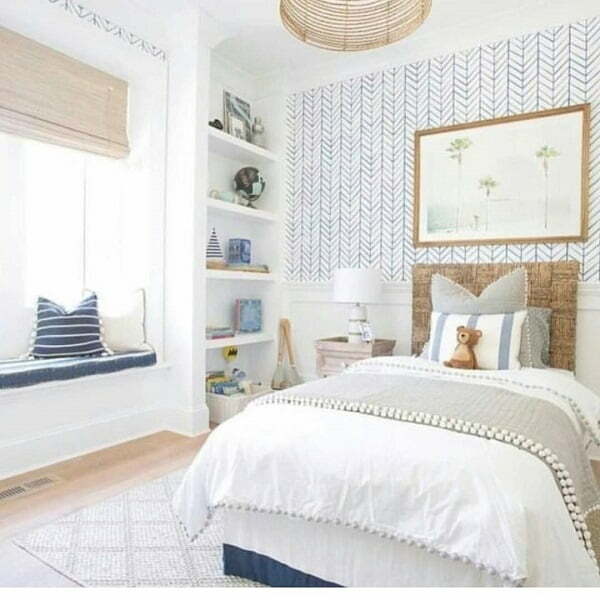 This simple wall stripe idea adds a lot of depth to room decor. 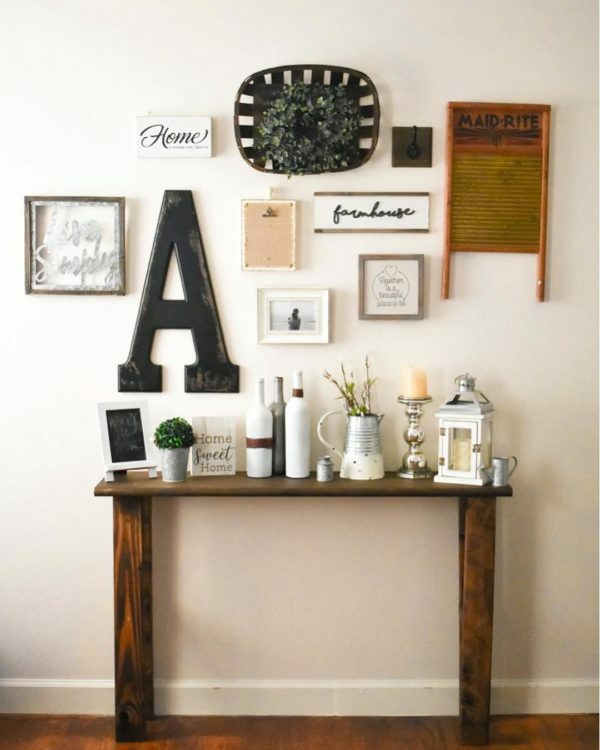 As usual, we love adding repurposing and upcycling to any list of DIY decor ideas. Here’s one for a farmhouse style hanging flower pot made of an old paint can. Enjoy! To add a significant farmhouse decor accent to your farmhouse kitchen consider rustic window shutters. Whitewashed out paint will give the wood a shabby chic look and you will enjoy the extra privacy the shutters provide. They are pretty easy to DIY too. 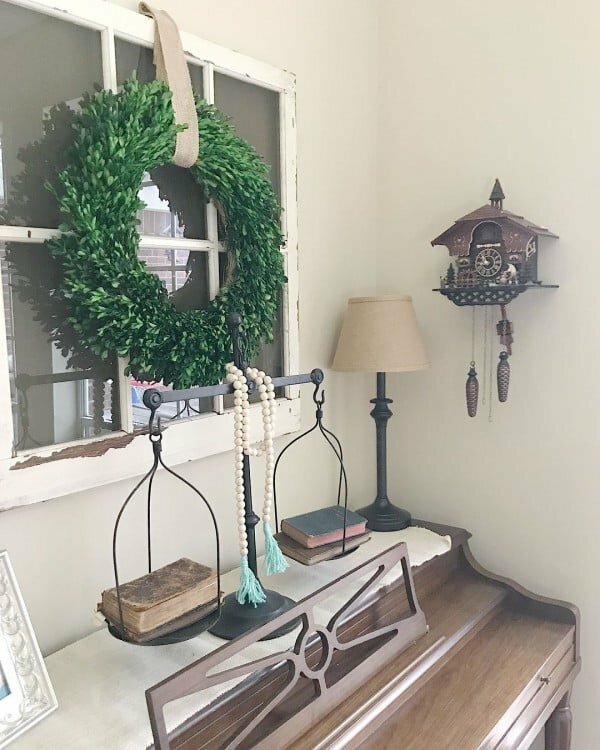 Want some farmhouse feel to your wreath? Then check out this tutorial to find how to make a wonderful looking monogrammed polka-dot burlap wreath. We find this one particularly inspiring since it neither treads the novelty path nor that of the more conventional floral fall wreaths. 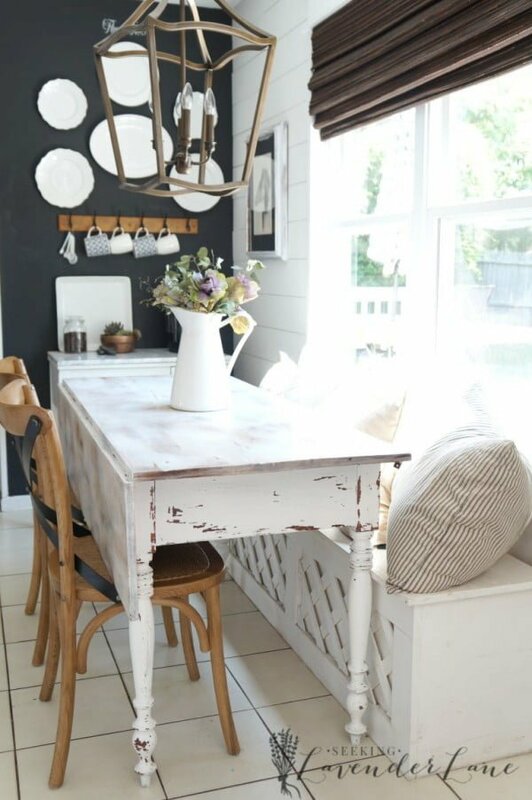 If you have an old table lying around, you can turn it into a beautiful-looking farmhouse table on a budget. All you have to do is sand off the finish on the table, use chemicals to re-weather the wood, and attach a few planks to the bottom to make the end-result sturdier. Refer to the full tutorial for more information. The L-Shaped farmhouse wood desk is absolutely stunning. It not only looks rustic and chic but it also gives your office a complete look. The desk speaks of wonderful craftsmanship, and is a real stunner. With a good stain, you have a desk with a lovely finish. If you want the DIY instructions, follow this link. 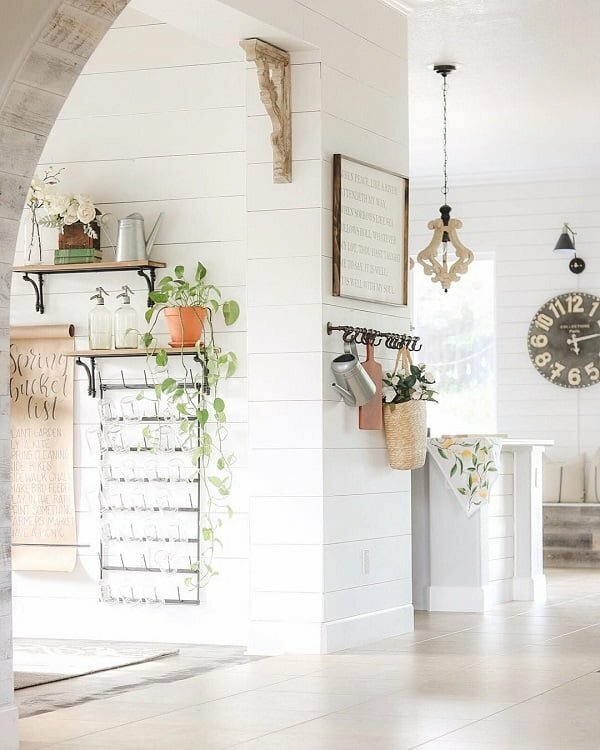 Farmhouse wall decor can be very simple with old shutters but if you add extra rustic vases you can get the complete look. It’s simple but adds a lot of decor interest to your home. Check out the tutorial for more details. One simple to make, and always welcome addition to your home, is the country styled bench. 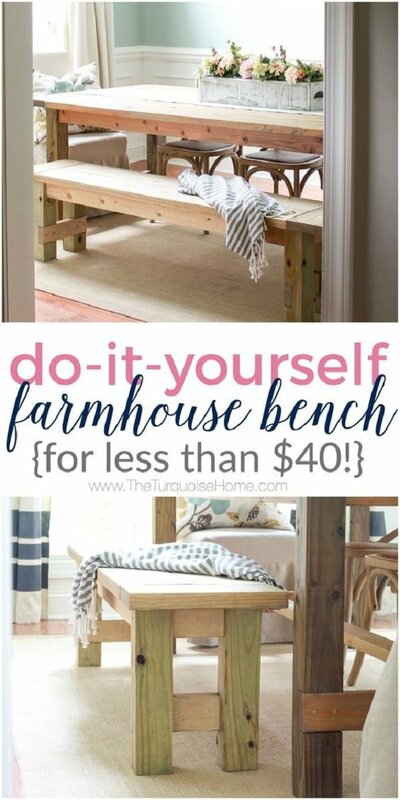 This DIY project will teach you how to make this classically country styled Farmhouse bench with a minimum amount of fuss and labor. Plus it’s an amazingly affordable way to add some country flair. 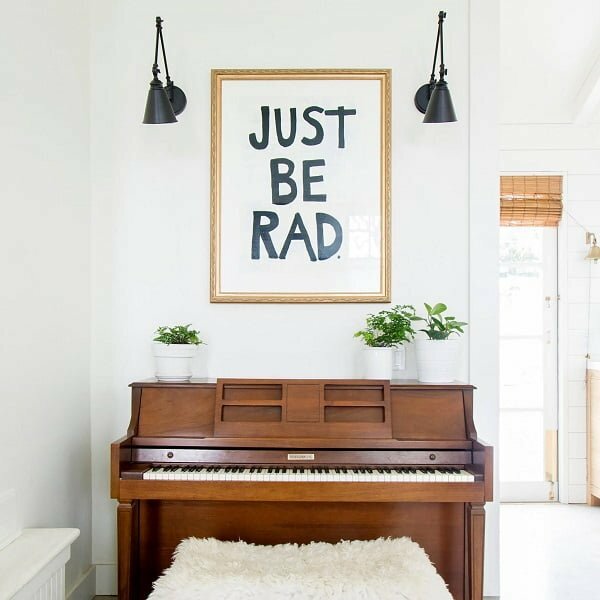 Sign wall art doesn’t have to include only words and letters. This idea of arrow signs has just as powerful an effect as any other farmhouse sign has. It is important to be unique, and you can use today’s look on your next project. 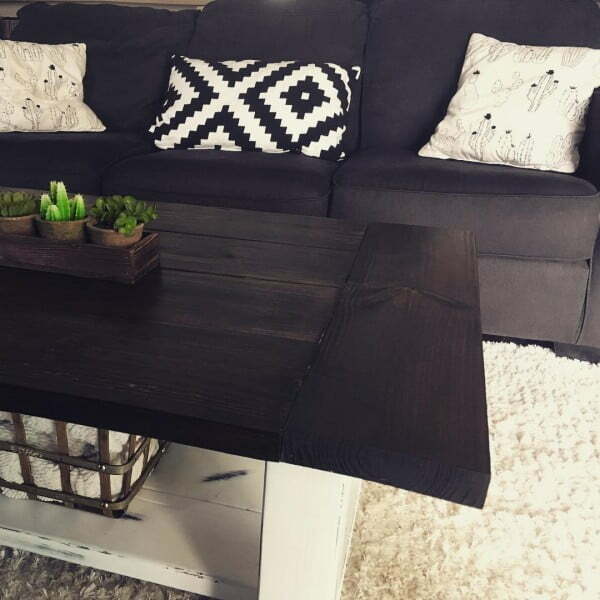 Using a few 2x4s, you can make a beautiful whitewash farmhouse coffee table. You are going to need a piece of glass to fit the table and complete the look. Make this easy decorative wood crate that combined with painted mason jars makes a lovely farmhouse style centerpiece. Check out the tutorial to see how it’s done. Windows are sources of natural light. Their prominence makes it easy to spot to their flaws, especially around the edges. 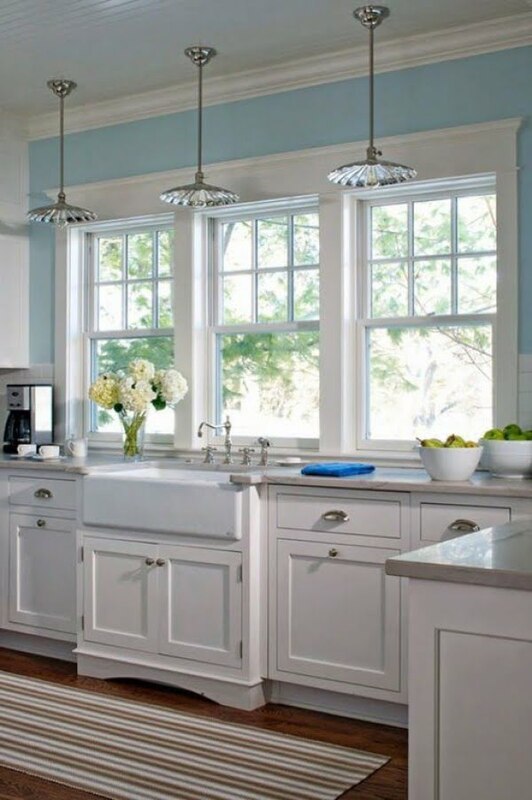 Hide these blemishes while improving the way they look by adding farmhouse-style window trims. The project is so simple yet the result is so profound. Candles can set a nice relaxing mood in a living room. Sometimes they are placed on top of candlesticks to increase their height and enhance their appearance. Instead of buying a few, you can create nice ones in a snap using spindles and blocks of wood. Every bathroom should have a mirror. It will be handy as a DIY vanity when putting on makeup, shaving with a blade, styling hair, using skincare products, and so on. 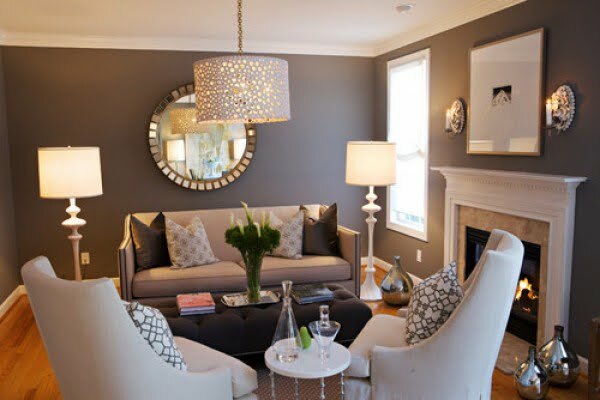 Mirrors also bounce off the light and make the small room seem larger. Most are rectangular but you can get them in any shape. 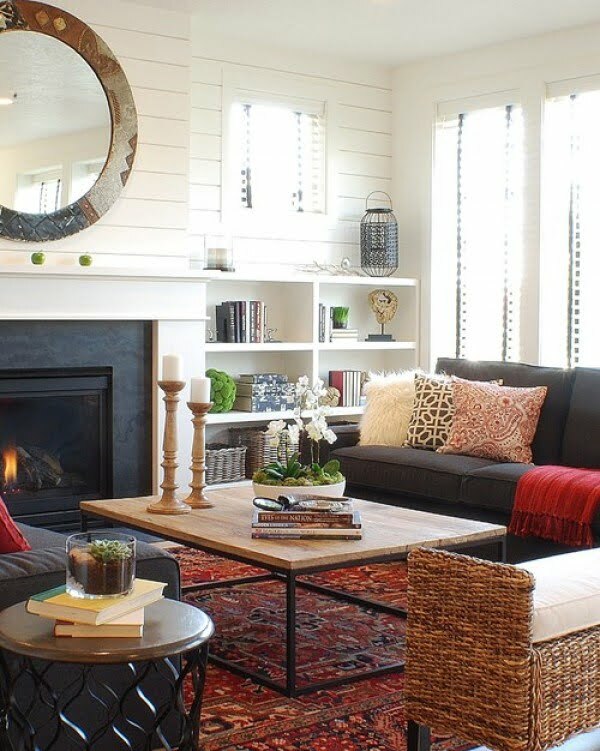 This one uses a round mirror and dresses it up with wood DIY mirror frame. Make bare walls come alive with wall art. This doesn’t have to entail the purchase of expensive paintings from well-known artists. You can create your own art and hang it on top of your bed, the sofa, or elsewhere in the house. This project features a graphic pattern that you can modify according to your preferences. 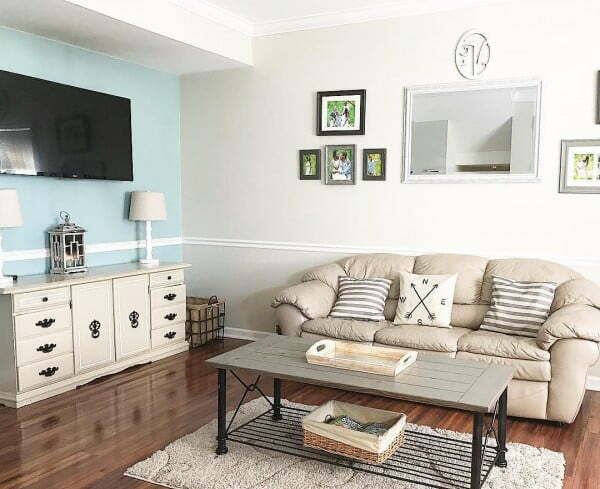 A nice way to renovate a room without spending so much is to get second-hand furniture and upcycling them with a new coat of paint, fresh fixtures, and clever effects. 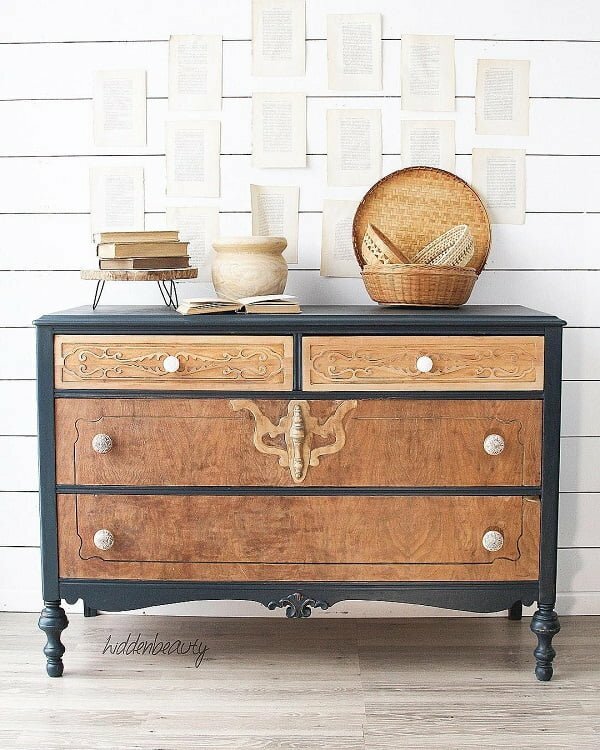 Here is one that started with an antique dresser. A weathered wood effect was achieved using mineral paints, brown wax, stain block, and paint brushes. There are different ways to infuse character into furniture. The majority of table designs focus on the top surface since it is the most visible part of the unit. Others turn their attention to the legs, including this project that features massive curved columns that make it stand out. Don’t build a farmhouse table without making matching benches for it. These should always go together as they look great as a system. They also cost so much less than the items you would normally see at furniture shops and have the perfect size for your dining area. Benches are particularly easy to build as you will see from this page. Every home needs a desk where the children can use their computer and do their assignments. The grown-ups may also want one for their home office. There are plenty of ready-made pieces that you can buy but it can be hard to find one that perfectly fits your needs and your room’s dimensions. This tutorial teaches you how to make your own. Arranging furniture around a room can be tricky. There tends be loose ends that need fixing, often by a putting small accent table on awkward spots. This can serve as storage for magazines and other reading materials underneath. The top, on the other hand, can hold drinks and snacks while watching TV. 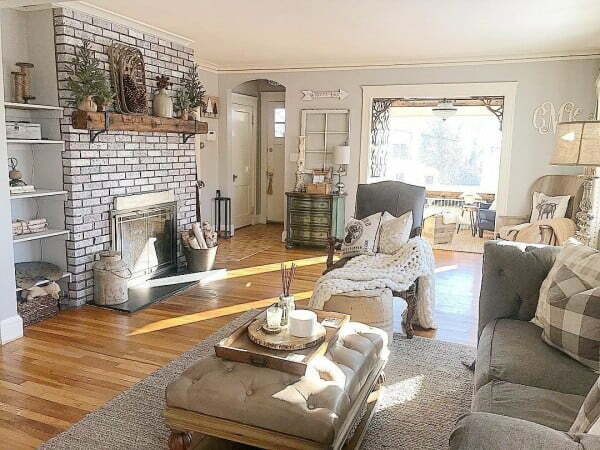 Here’s an industrial farmhouse version that is full of personality. 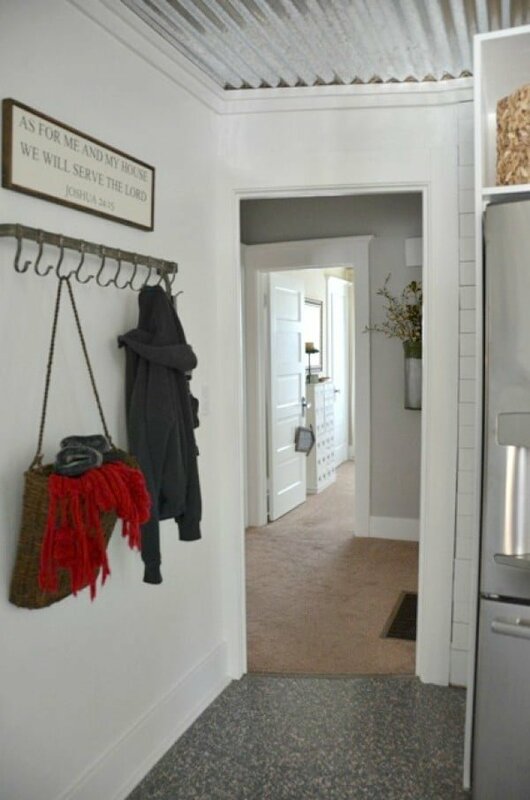 Entryways can be problematic as people are not always sure what to put in the space. Giving guests a place to sit is a good idea. This doesn’t have to be anything grand like a costly sofa. 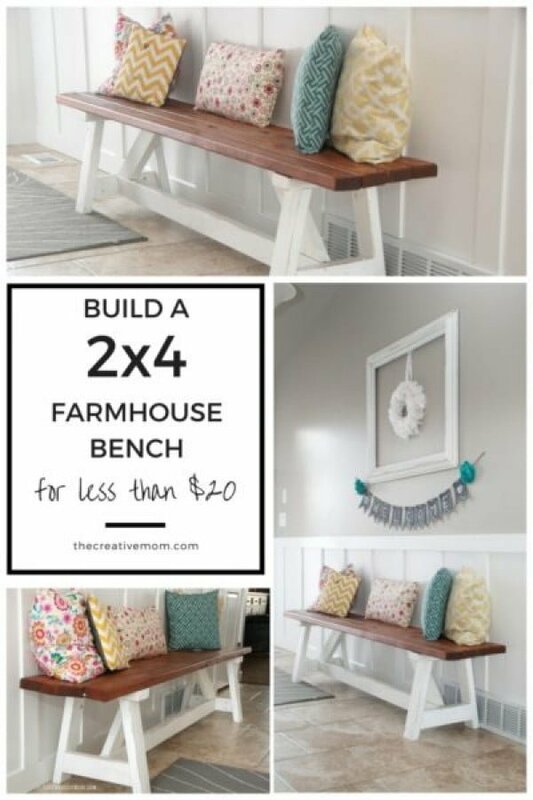 You can build a charming and sturdy bench using nothing but 2x4s, glue, and screws. This one is a perfect mix of the modern and the tradition. 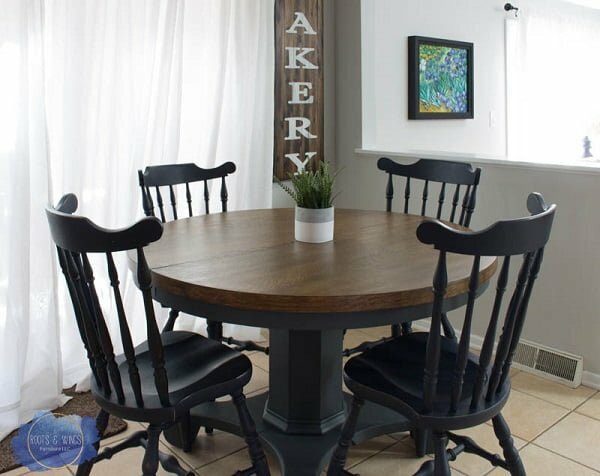 It takes the typical farmhouse table design and straightens up the lines for a cleaner look. The screws have been hidden using pocket holes. The result is a stunning piece of furniture that looks like it might have come from an upscale shop. It is a fantastic addition to any dining room. The French certainly have style, from the catwalks all the way to the farmhouses. 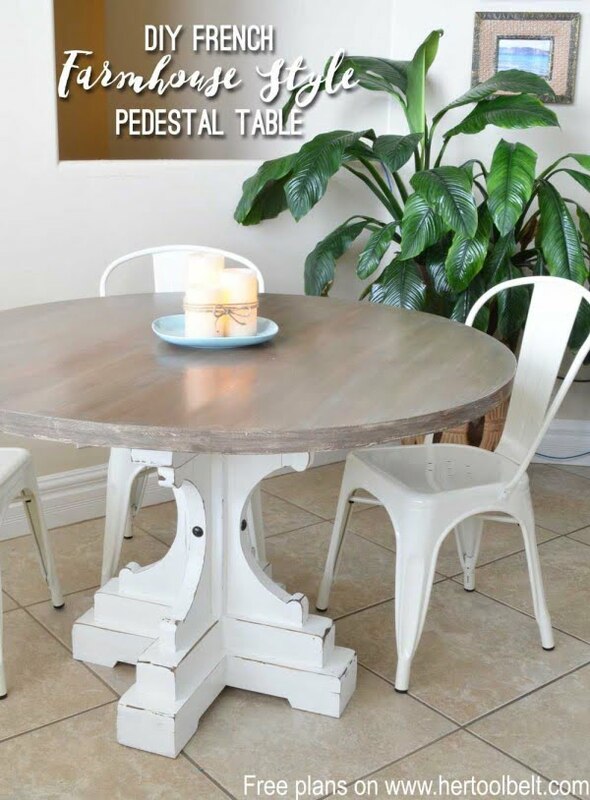 Their round pedestal table design is a classic. The base is really what makes this stand out from the rest with multiple levels, strong construction, and a bit of flair. This tutorial shows you how you can create your own version for less. The walls of modern homes tend to be covered in plain white paint in an effort to make the tiny spaces look bigger than they really are. Adding wooden furnishings can turn stark rooms into homey sanctuaries with their warmth. Shelves are not only beautiful additions. They are also highly practical as they optimize vertical space for storage. A new dining table can be pretty expensive, so why not just build your own? 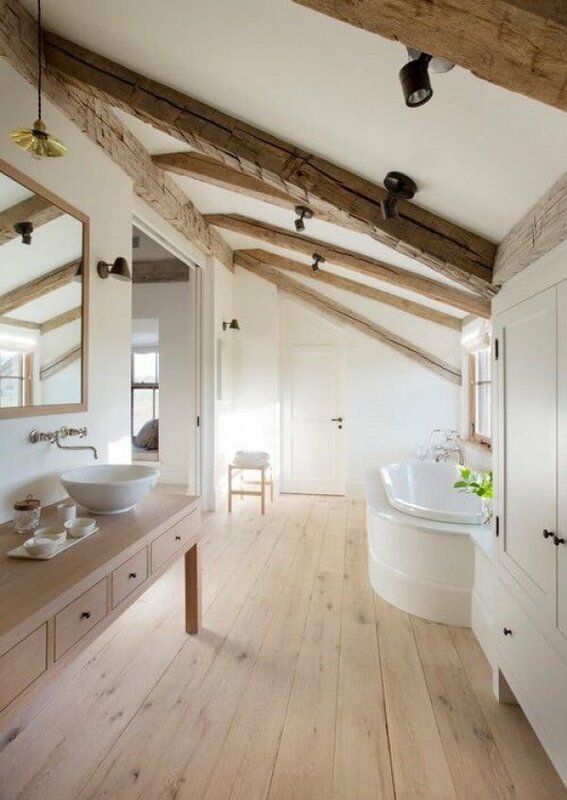 Get inspired by how simple they do it out in the farms where wood is abundant and simplicity is the norm. This can be paired with any old set of chairs. 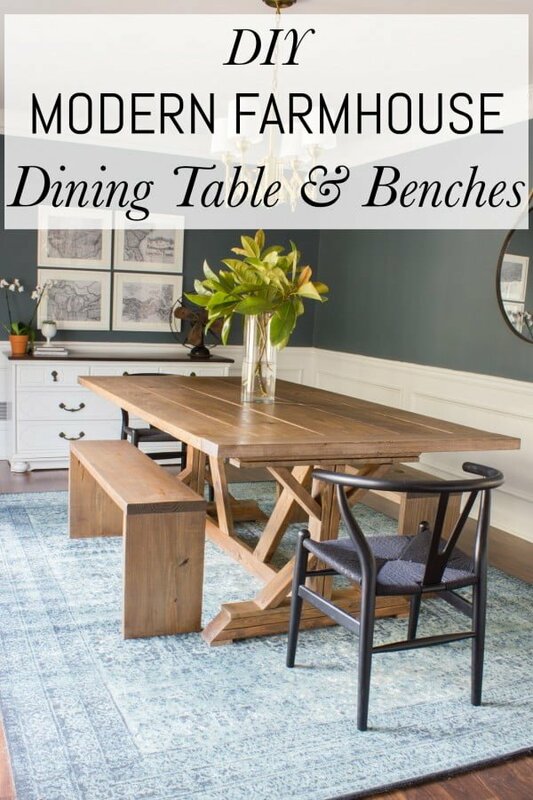 Better yet, make matching benches that are perfect for hearty family meals. Mirrors naturally attract attention so they can have a big impact on any room. Their frame has the greatest influence on their appearance so focus on this if you want to achieve a certain look. An old wooden window frame will be perfect for this type of project. 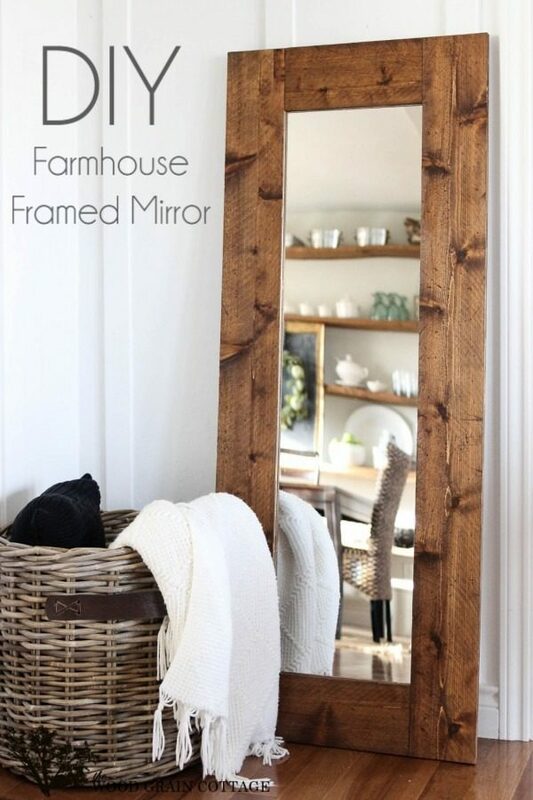 Read how quickly you can build a farmhouse mirror. For those who need to get organized, a message board is a great way to control the clutter. Instead of having lose papers floating around, this message board allows you to pin up important papers and notes in a central area that is easy for everyone to see. 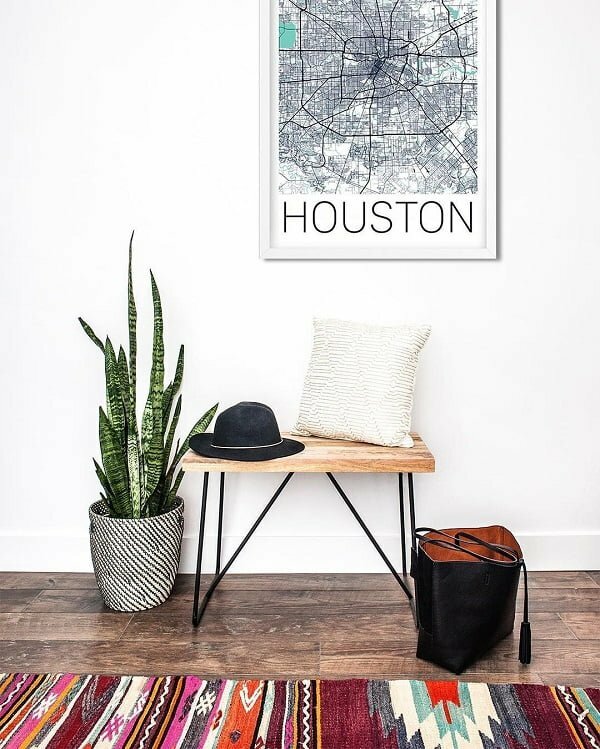 Arrow art is an up and coming trend being used in many different homes, from the industrial to the farmhouse. This Native American symbol is appreciated for its simplicity and strength, making it a meaningful addition to any home’s decor. 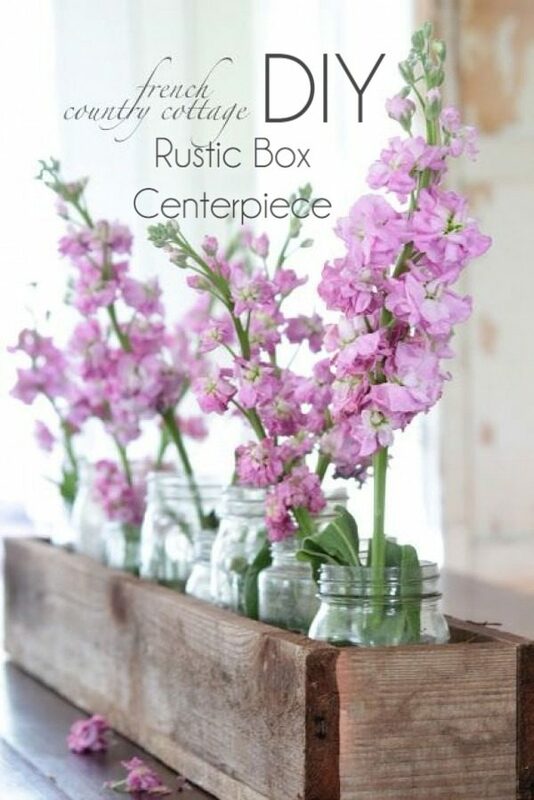 For a unique way to display flowers or just about anything else in your home, the rustic crate is a simple way to do this. Using just leftover wood, you can add some natural flair to your home. 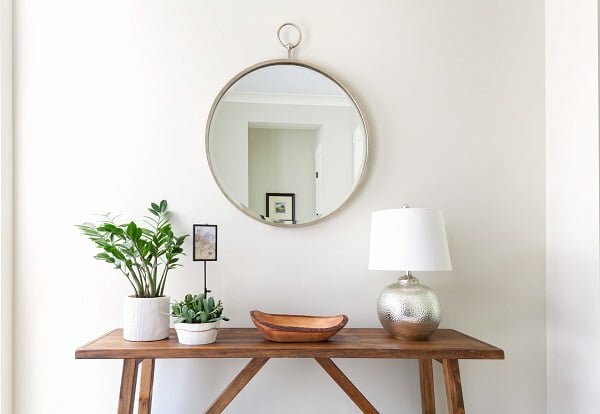 Whether you have a full-length mirror in your bedroom, or a small mirror above your bathroom sink, you can instantly transform it with a wood frame. 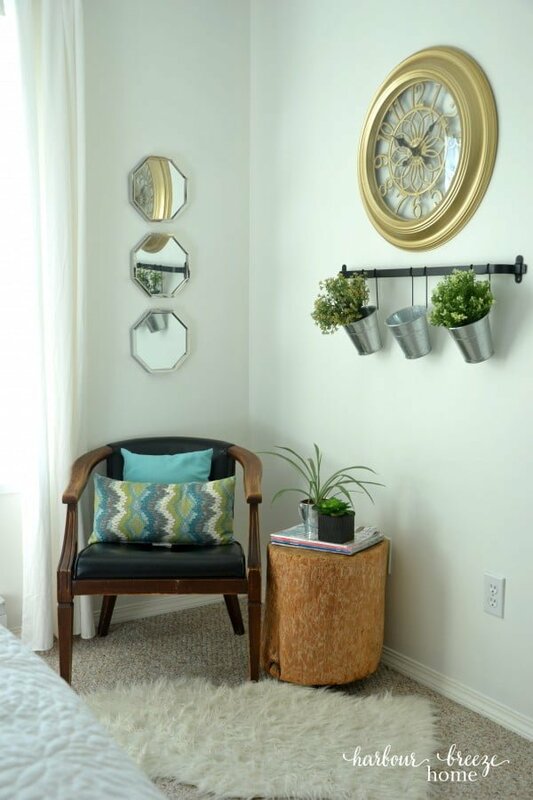 The DIY Wood Framed Mirror is a great way to add an outdoor feel into your home at little expense. If you’re looking for a way to dress-up the lights around your home, using plug-in sconces with pendant lights is a great way to do this. 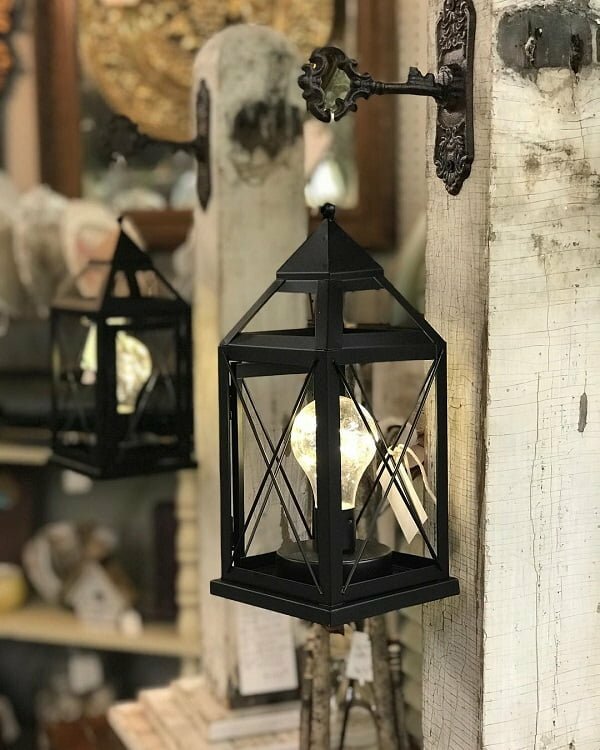 These scones can be applied both inside and outside the home and will also provide extra farmhouse lighting where you need it, thanks to the basket frames. It can also free up space on your nightstand and tables if you have traditional lamps sitting there. 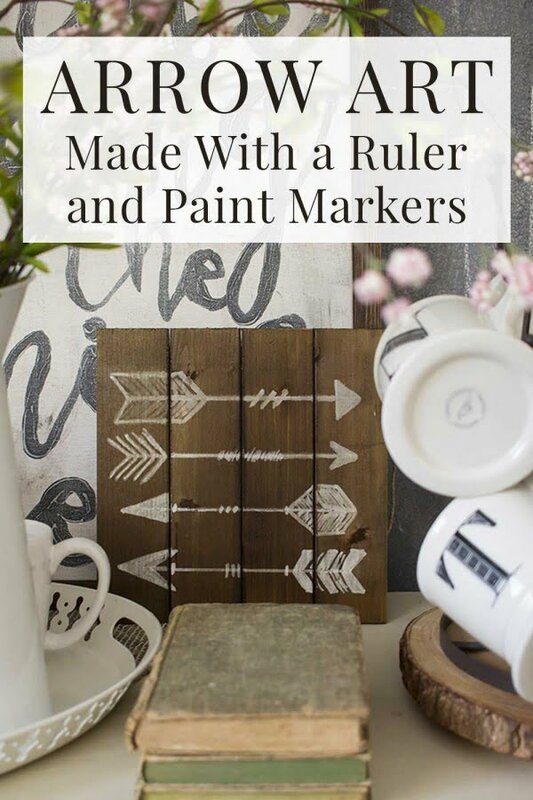 If you’re looking for a fun DIY farmhouse decor project, try these stencil designs. They can be used on fabric, walls or just about anywhere in your home to create farmhouse charm while fueling your own creativity. Mason jars aren’t just for drinking out of or storing your preserves in. Now you can use them to create beautiful lanterns for your home. They are a great way to add light and Southern style to your home using the romantic soft glow of candles. 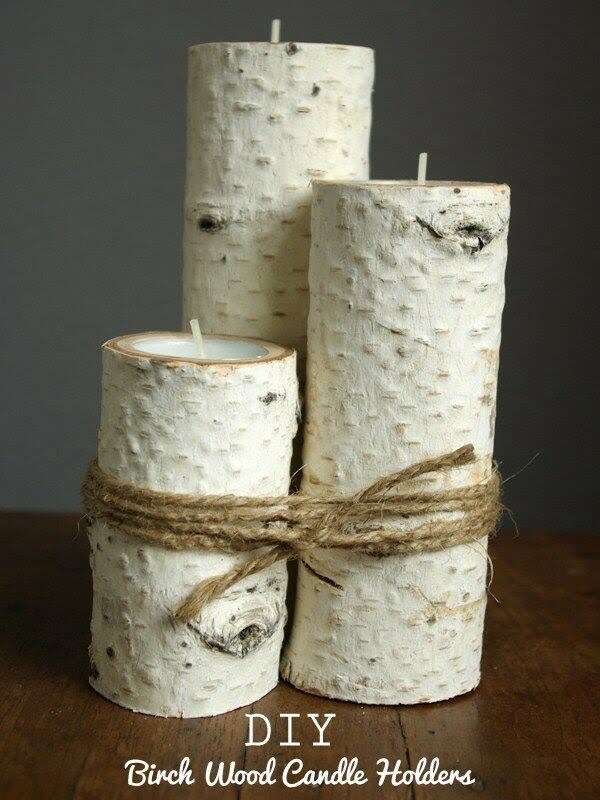 If you have a birch tree standing on your property, you can use a few branches to make these candle holders. With just a few tea lights, you can give your home a woodsey feel that is truly lovely and comforting. 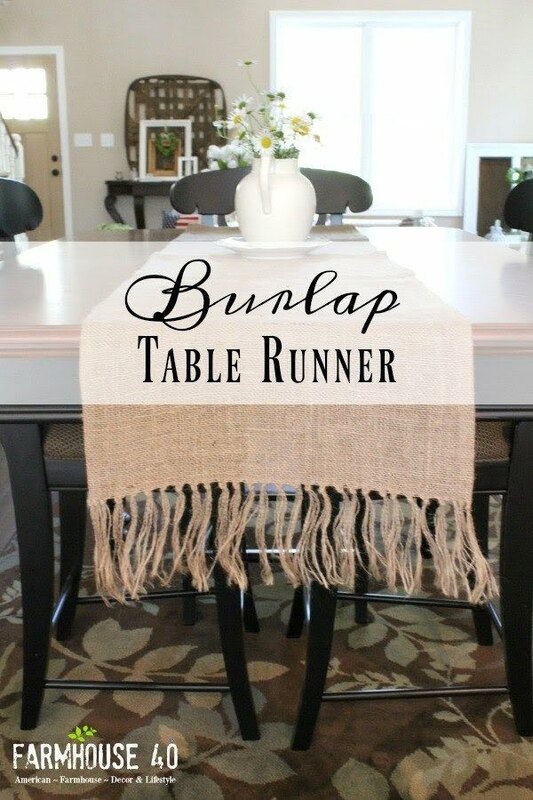 Dress up your table with a burlap table runner. Burlap is a remarkably versatile fabric which can be made elegant or simple depending on your preferences. It also comes in a variety of colors, such as cream and oatmeal, providing you will many options for color-coordinating your table decor. 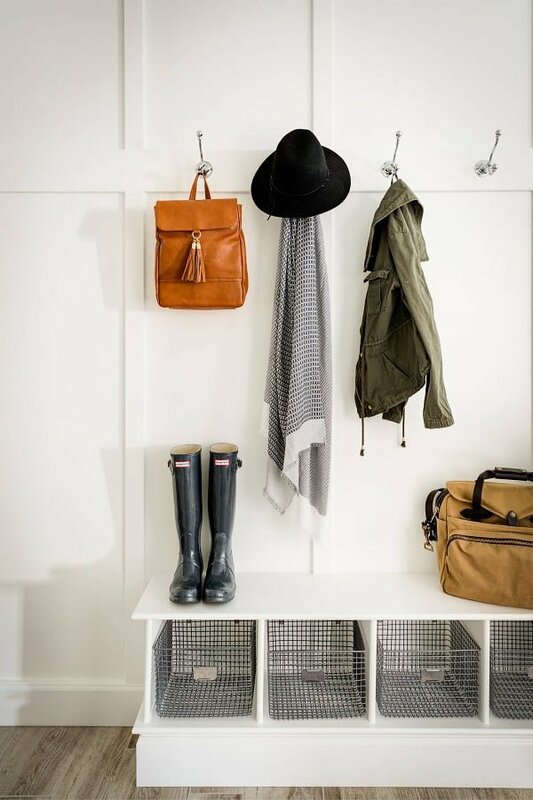 Every home has hooks for hanging up your coats and jackets, but they are often plain and boring. 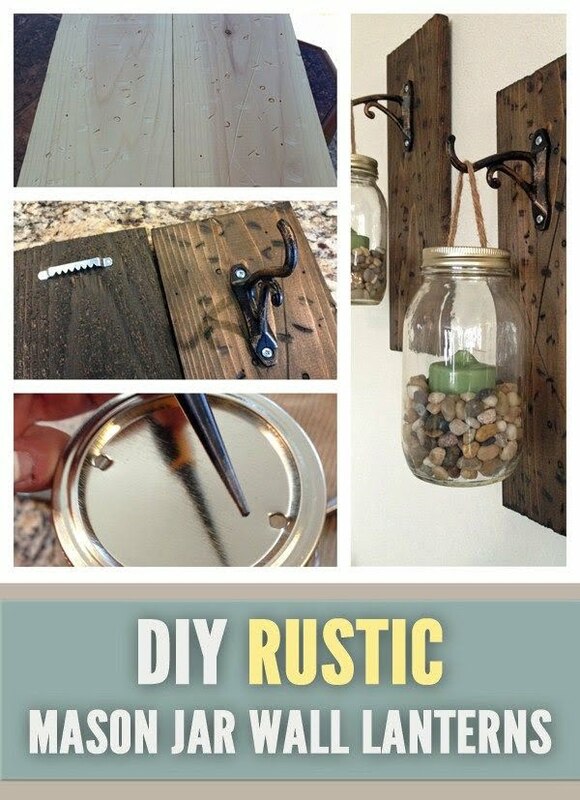 These DIY decorative hooks can help you to personalize your home by using rustic frames and pictures that add character to simple hooks. If you want to spruce up your bathroom mirror without having to replace it, learn this DIY for framing a bathroom mirror. The mirror is one of the first things you see when you enter a bathroom, so making it stand out can really transform the appearance of the room. In the midst of your DIY projects, don’t neglect your pantry. 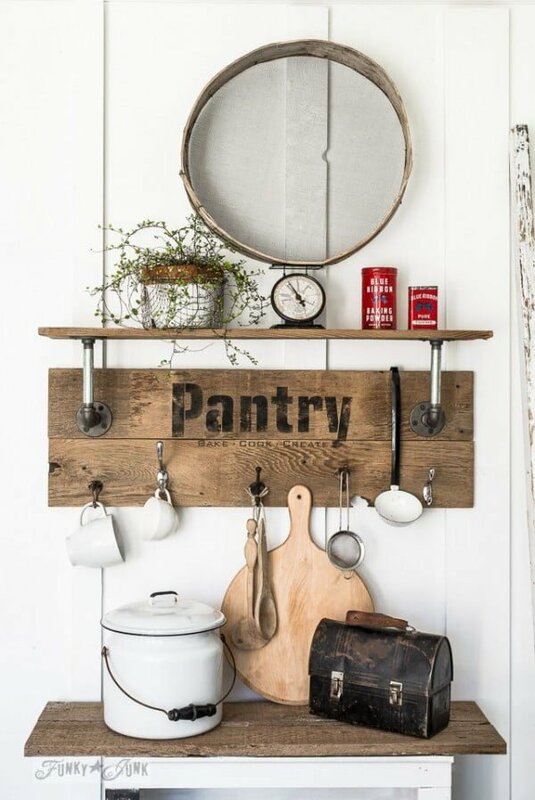 If you want to create a farmhouse shelf look for your pantry, while also saving on space, you can do this using reclaimed wood and pipes. If you love fresh produce but lack enough counter space in your kitchen to store it, try the DIY Farmhouse Produce Rack. By using only a few wire baskets, you can complete this project to reduce clutter while keeping your produce fresh and neatly stored. If you have a lot of unused materials around your home, but not enough space to store them, the DIY tiered stand is a good project for you. 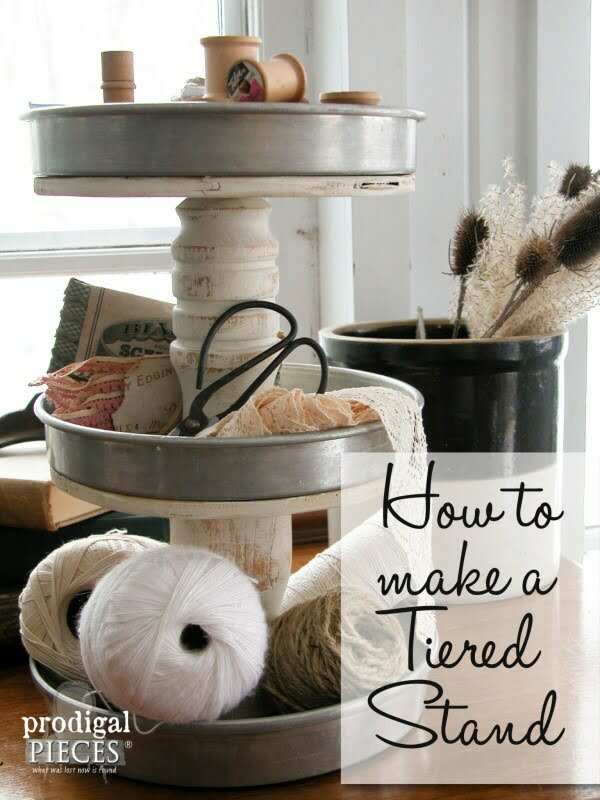 By using re-purposed junk in your home, you can give it new life while creating a great tiered stand to hold the things that really have worth to you. If you’ve recently put up new cabinets in your kitchen, don’t throw away the old ones. 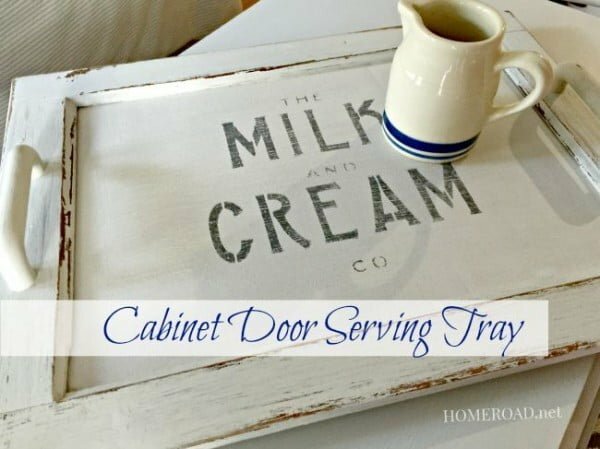 By using old wooden cabinet doors, you can create a vintage serving tray that is perfect for serving someone you love breakfast in bed. A milk stool has many uses. It can provide a boost to a short person who needs to reach something in a high cupboard, or it can serve as an end table for displaying your favorite books and plants. If you can find an old stool at a flea market or thrift store, you can make this DIY milk stool. Having a bench on your porch can provide a cozy place to relax with a cool drink. However, you don’t need to fashion one out of new wood. If you have an old shutter, convert it into a bench with these tips on how to create a DIY rustic shutter bench. Ladders aren’t just for climbing on to reach things; they can also be used to display your favorite throws, garlands or hanging plants. 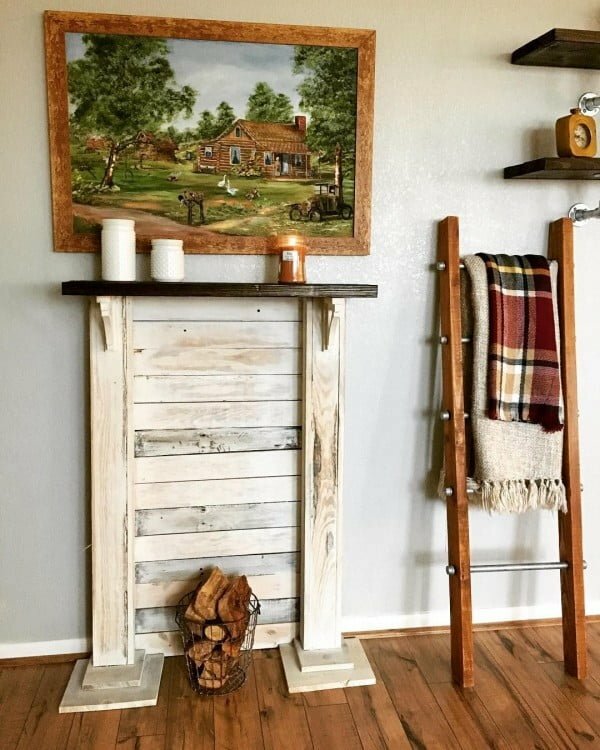 With this DIY rustic ladder, you can add charm to any room at a fraction of the cost that most stores charge for ladders. If you have dishes and china that you love, don’t hide them away in a cupboard. Create a wood ledge shelf to display your dishware while conserving space at the same time. Storage drawers are a great way to get organized, but you may not like the bland appearance of conventional plastic storage drawers. 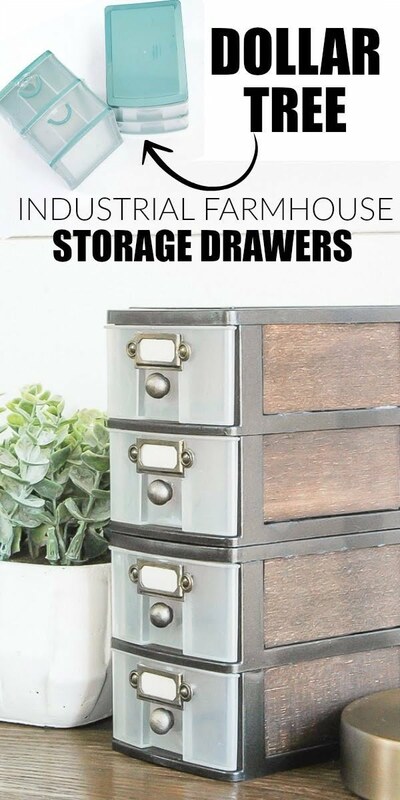 If so, try this DIY industrial farmhouse storage drawers to give your home a rustic look while getting organized. Laurel wreaths are a great and inexpensive way to dress up your home, no matter what the season. 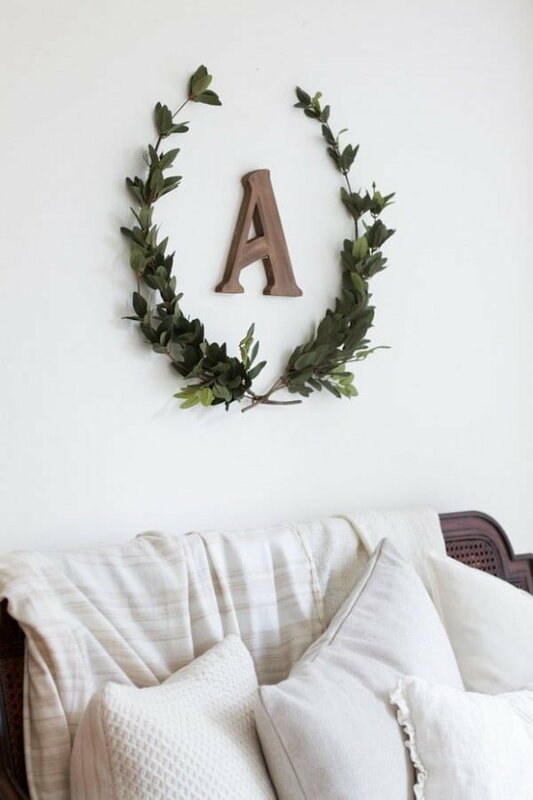 To add some natural beauty to your home, try this DIY laurel wreath, which is a fast and easy project. 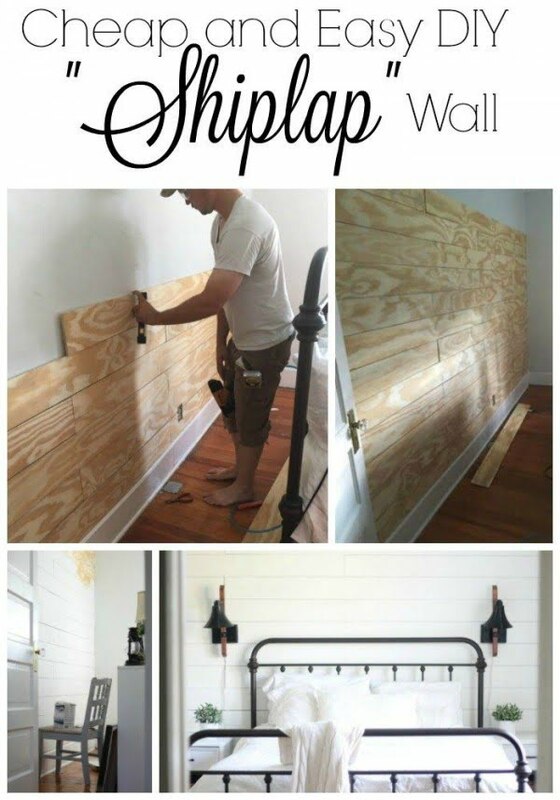 If you’re looking to give a room a makeover, try putting up a shiplap wall. It will instantly transform the look of a room and make it appear warmer and more cozy. If you’ve just completed a painting project or paint frequently at home, you may have a lot of paint stirring sticks lying around. 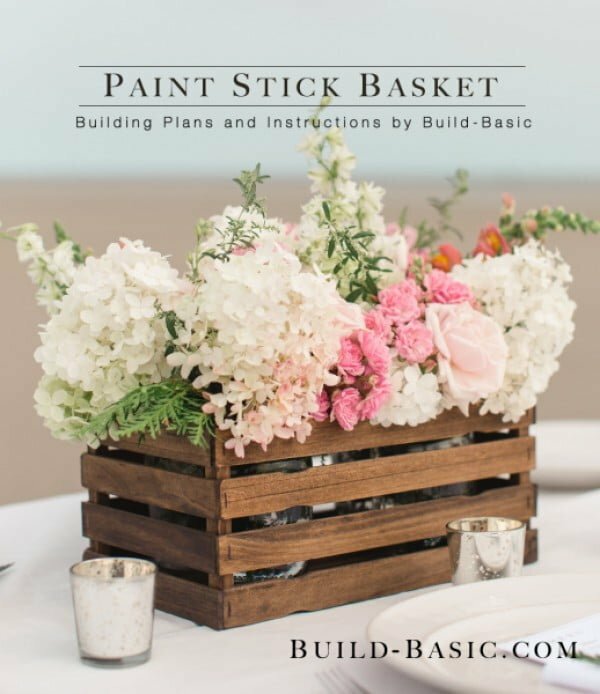 Put these to good use by making a paint stick basket that can elegantly display your fresh flowers. 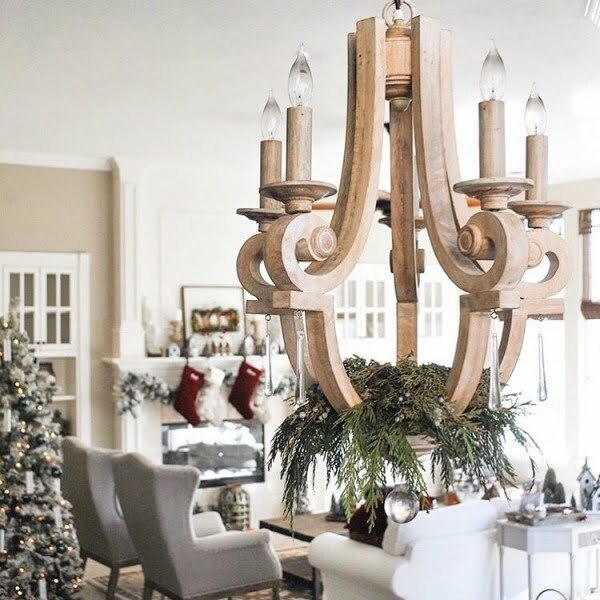 Nothing says elegance more than a hanging chandelier, but you don’t have to spend a lot of money for it. 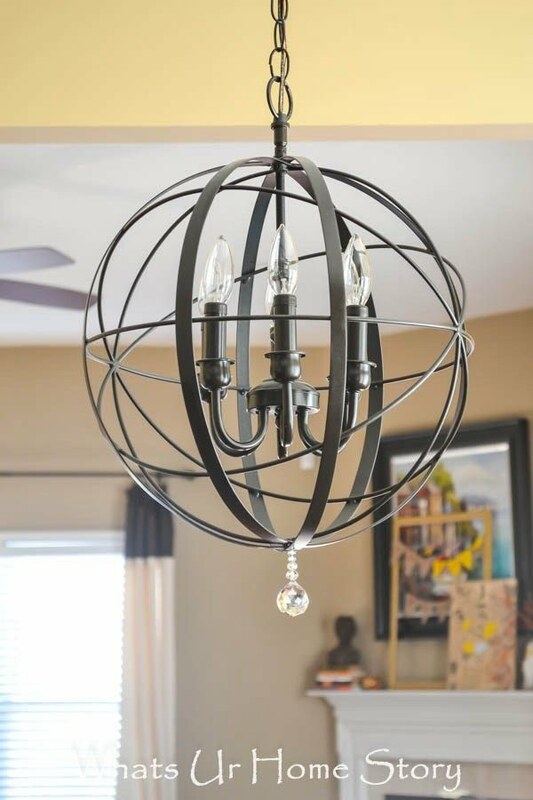 You can simply create a DIY orb chandelier to replace the plain light fixtures in your living room or dining room to give your home a touch of decadence. For those who have a lot of time and love learning new things, you can learn how to make a wood speaker that doesn’t require electricity. All you need is a smartphone and the speaker box, and you can blast tunes throughout the room. Check out this interesting tutorial now! Don’t know where North Korea is on the map? The handy Window Map can help you pinpoint it, as well as other hard-to-locate places. This project can be done by cleaning an old window and then simply stapling a paper map to it at the back. You can hang it anywhere — in your kids’ room or near a bookshelf. 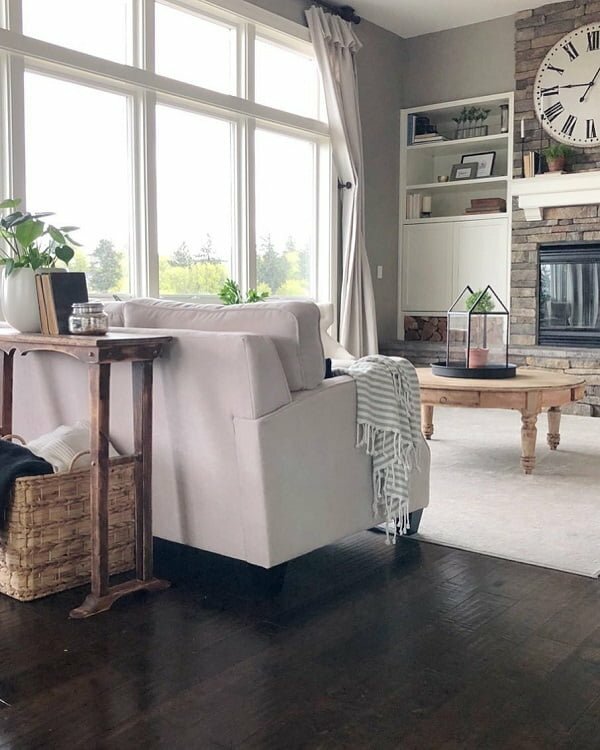 A hinge-top window coffee table is easy to make, looks classy, and can be placed in your living room or outside on the patio. The window can be lifted up with a handle, and there’s ample room inside for storage. This cool-looking table can be made with hinges, wood, a window (with panes), and a cabinet handle. Can you get your hands on a few mismatched farmhouse windows? You could turn them into a really quirky farmhouse side table. This project uses windows laid out vertically for support, with a bigger horizontally-laid-out window on top. Click the link for full instructions. Do you love flower or leaf wreaths? You could put up one in the center of an old window to bring some cheer to the room. 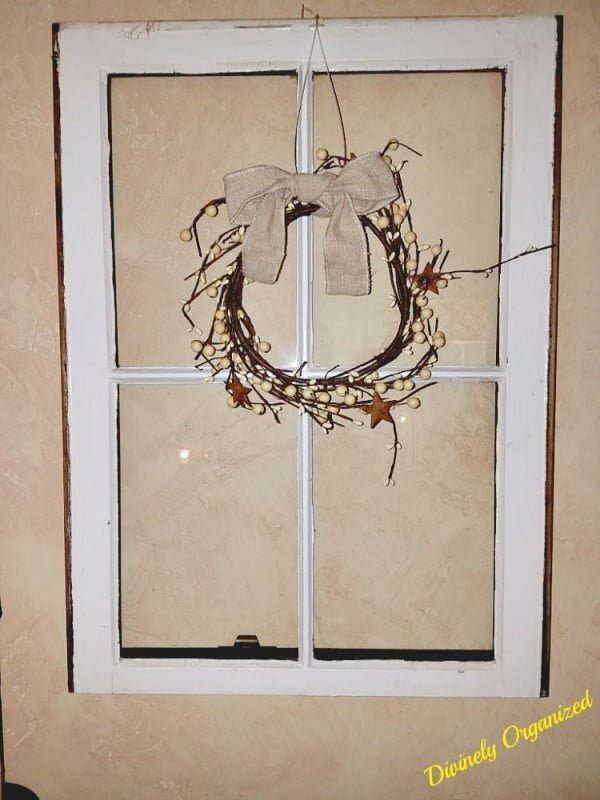 This project is easy to make — all you need is a clean (preferably varnished) window, some fishing wire, a wreath, and a picture hanger. Photo galleries tend to have these amazing displays that truly mesmerize viewers. Sometimes the frame is just as impressive as the picture being displayed. While you won’t be able to make a gilded photo frame with an old window, you’ll still be able to make an elegant, hanging photo frame. If a window can be turned into a hinge-open table, why can’t it be a cabinet too? 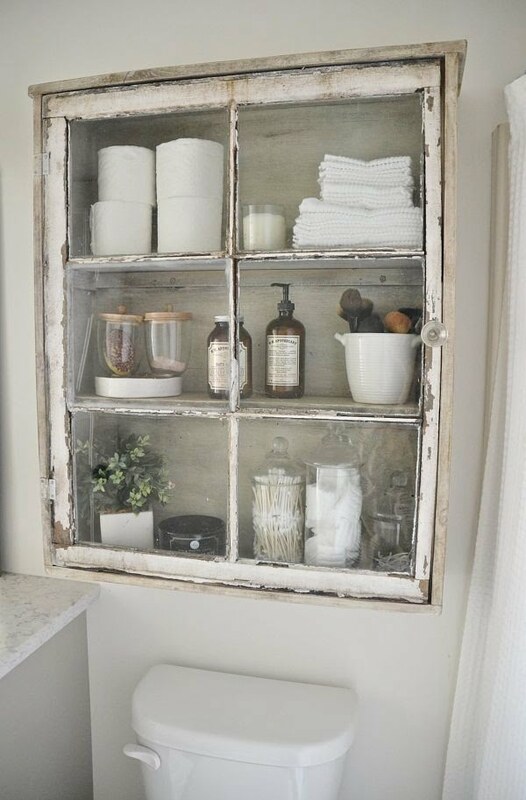 The Old Window Cabinet has a see-through, pull-open window door, with ample storage inside. You can use it as a display piece or just as a regular cabinet to store your household items. The Window Mirror can be hung up in your bathroom, in place of the regular mirror. It looks great, and it doesn’t look out-of-place, despite being unique. All you need is some wood, items for window glazing, tools, and a frame. For a detailed tutorial, please click on the link. If you can never find your earrings or bracelets, perhaps it’s time for you to build the DIY old window jewelry wall organizer. You can transform a window frame into a place to hang all your jewelry, including rings, bracelets, and earrings. All you need is some scrap wood, mesh, and hooks. It turns out old windows can double as decent chalkboards in a pinch. If you have a 6-frame window lying around, you can turn into a chalkboard with the help of some burlap, plywood, chicken wire, cork, and paint. You can place it in your room and share your artistic prowess with everyone. You can simply paint a window your favorite color — like a dark green or purple — and stick it to the wall. There are special paints available that stick well to glass. Alternatively, you could just use a burlap sack — the kind that holds potatoes — and just stick it behind the glass window for decoration. Get more useful information by clicking the link. If you don’t have a plus-sized window lying around, you’re in luck: you could place it on your mantel. Small windows, it turns out, looks great there. You can also hand up small meaningful signs or quotes on them — or even tie a wreath — to make them more attractive. The Handing Garden project is for you if you love nature and have a green thumb. You can hang up a window frame — with panes intact — by hooks and plant something on it. Alternatively, if that seems like too much trouble, you can buy a grapevine from Wal-Mart. If you’re a dab hand at painting, you’re going to love the Autumn Leaves on Glass project. With the help of regular craft paint, you can draw a circle of beautiful autumn leaves on a window. The leaves look a lot like a decal, except they have more character. Read the tutorial for full instructions. First, let’s start with making your own wood shutters. 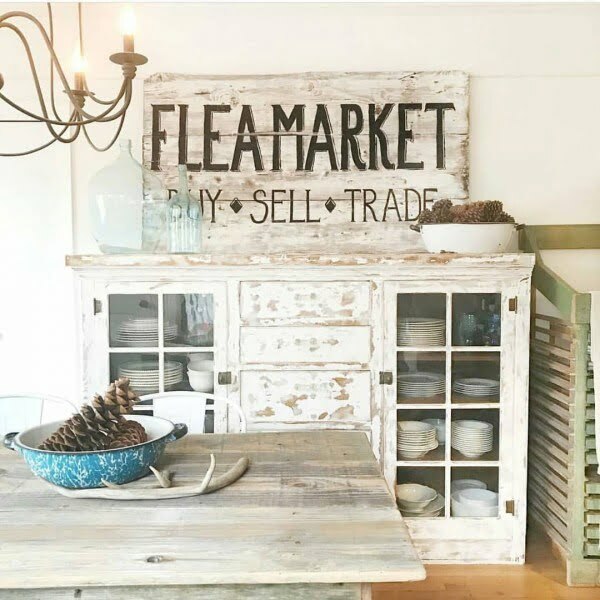 Yes, you can get charming old shutters from flea markets, and you should, but there are times when you need something custom made. For those times, you can use this tutorial and make exactly what you need for your DIY craft project. 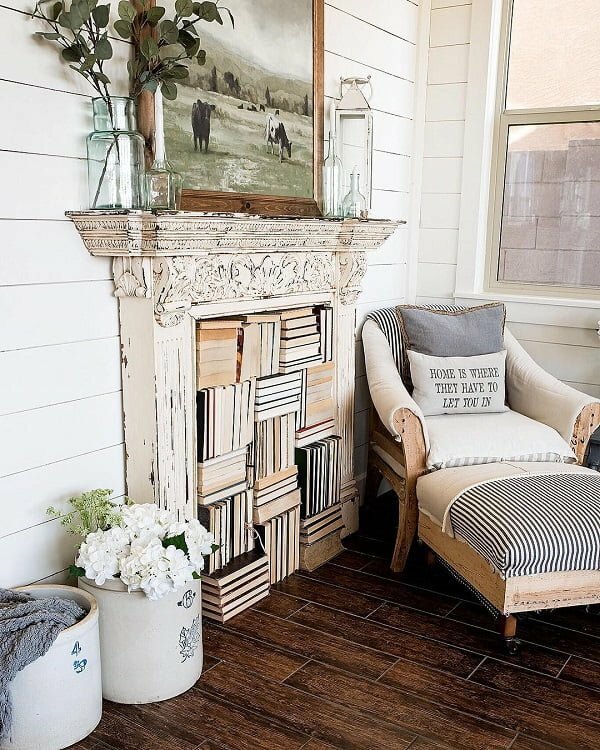 Using old shutters for picture display is a very shabby chic way to use them. It’s one of the most practical uses for old shutters and you can easily make use of the idea where ever you have free wall space. It’s a great replacement for wall art. Check out the tutorial for more details. 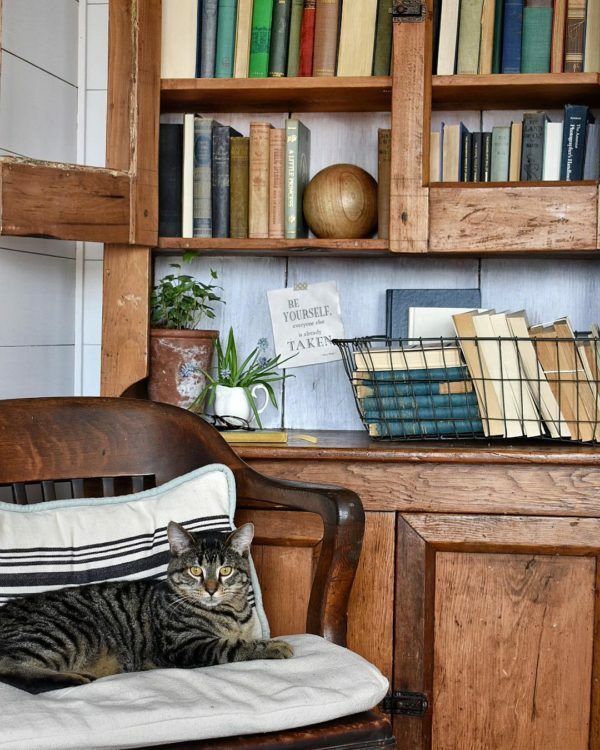 Yes, you can make actual furniture from old shutters and it’s an awesome way to repurpose them. This bookcase is as useful as it is attractive. Get yourself some more space for storage and display while doing it in chic style. The tutorial has all the details on how to build it. If old shutters aren’t shabby chic enough, you can add jewelry to make them even fancier. This way you can incorporate them in basically any decor. 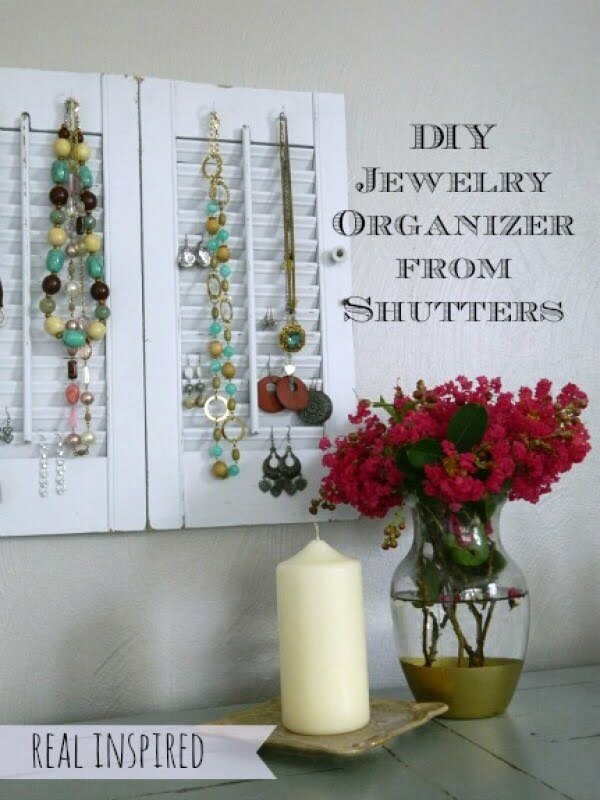 Not to mention it’s a great way to organize your jewelry. Check out the tutorial to see how it’s done. 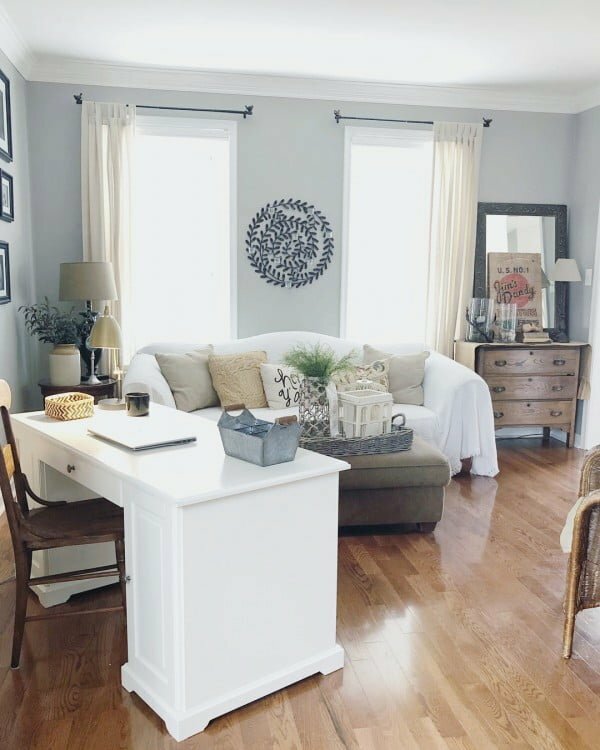 A bench might seem like a lot for good old shutters but you can actually pull off this project quite easily. Combined with fancy chair legs that you can pick up in a flea market the shutter makes an attractive farmhouse bench. Check out the tutorial to see how it’s done. 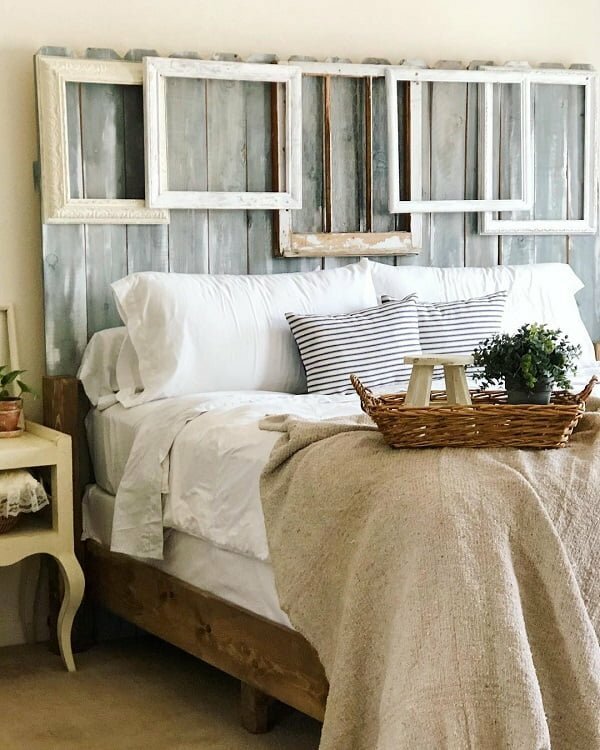 We have a wonderful post about DIY headboards and here’s another idea for how to make them from old shutters. It’s a quick and easy way to add decor interest to your bedroom and solve the problem of those empty walls. Check out the tutorial for the full story. Build an organization console for all the small items and actionable tasks at home. 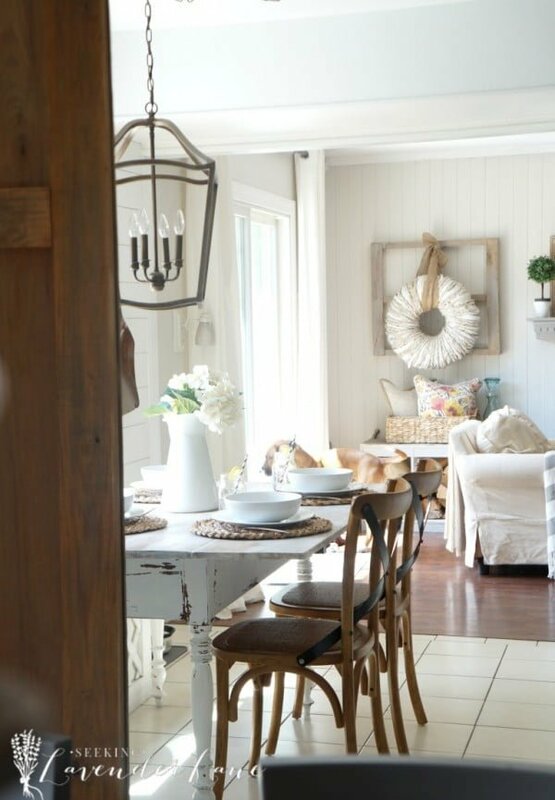 An old shutter that gives your decor a shabby chic look is a great way to do it. Not to mention it has the perfect frame for it. The tutorial has all the details necessary to build it yourself. 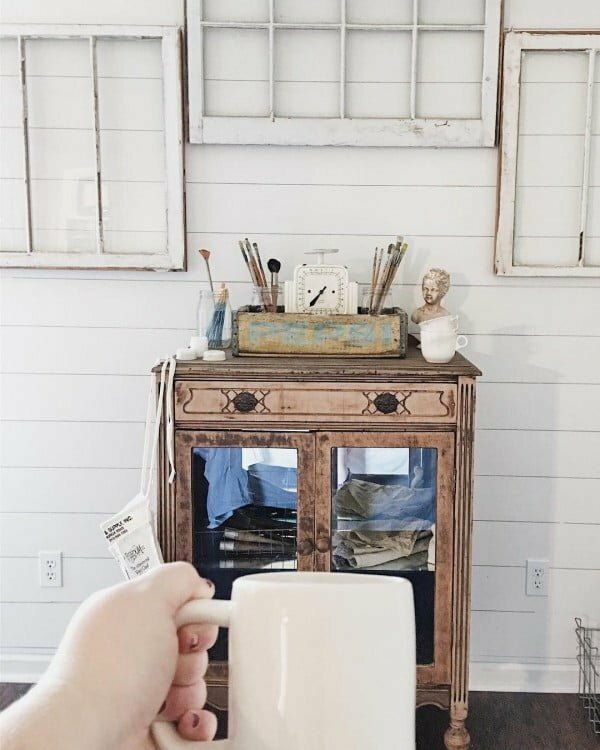 An old shutter makes a stylish DIY shelf with the help of this craft project. You can add it just about anywhere, from the entryway to the kitchen. You’ll always have an attractive decor item that enables you to create wonderful displays. This is one of the most interesting DIY projects with old shutters. 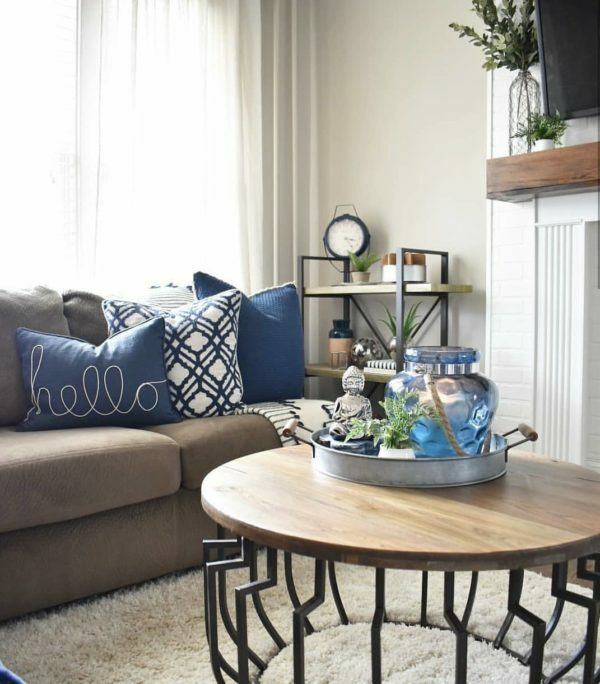 The coffee table looks interesting and very shabby chic – definitely a great addition to any home decor. If this is the look you’re going after, definitely check out the tutorial to see how it’s done. Another great project for an old shutter that results in a terrific piece of furniture. 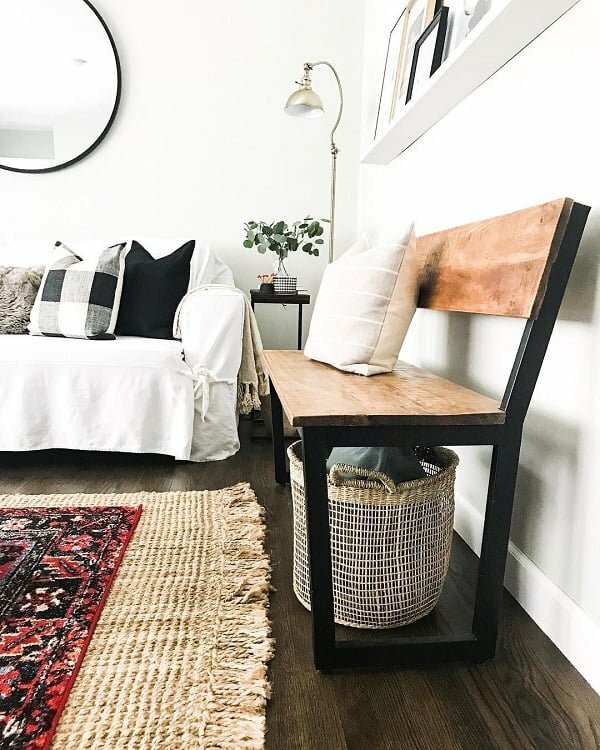 The DIY side table has the chic or farmhouse look that we like and it can be placed against the wall as an extra surface. Check out the tutorial for instructions. 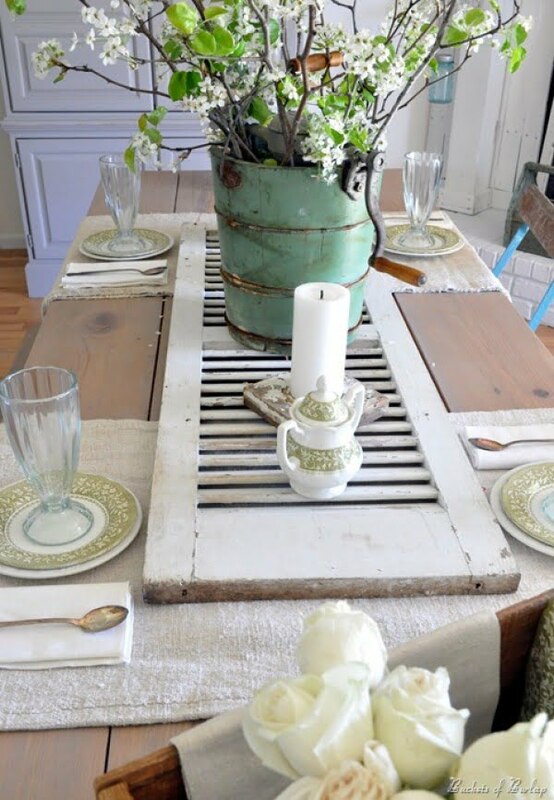 To max out your farmhouse dinner table style, use an old shutter as a table runner or a centerpiece. It’s one of the easiest DIY projects but it’s certainly one of the most creative. Check out the full story for more details on how it was done. 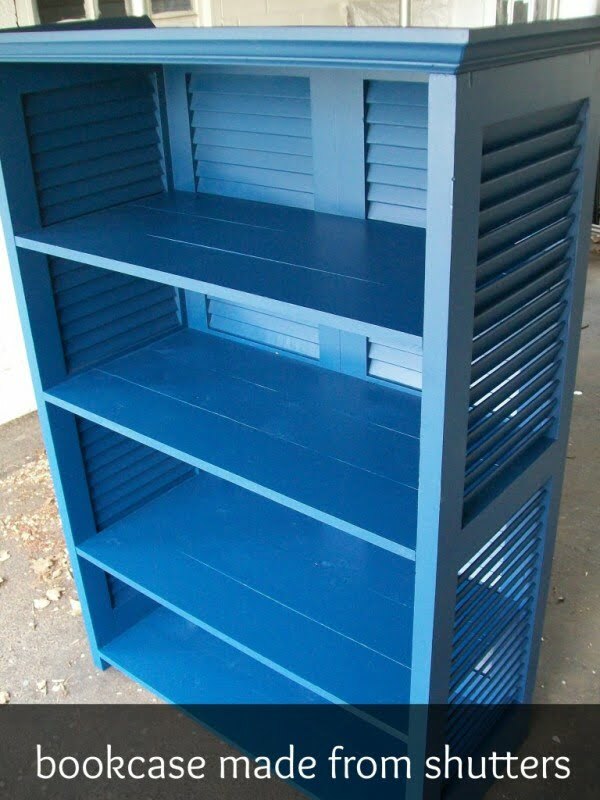 Here’s another DIY project for shelves from old shutters. 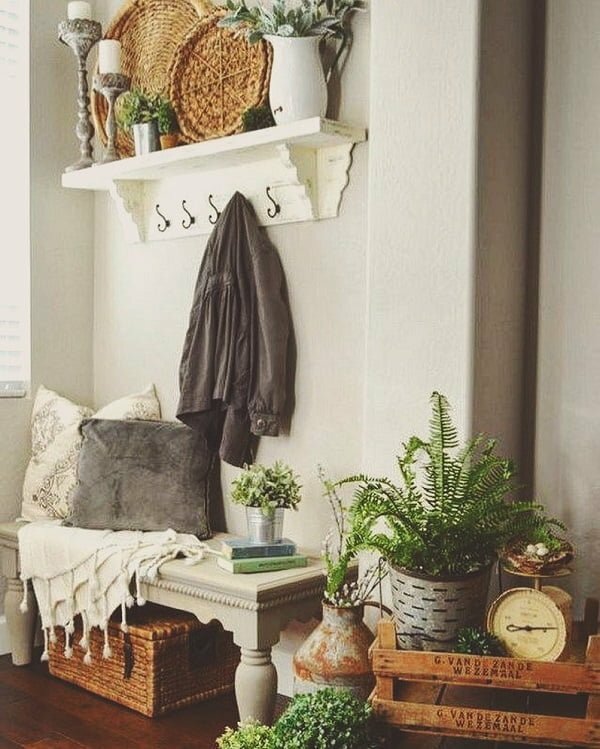 It’s very shabby chic, you can add as many shelves as you need and even add coat rack hooks for the entryway. Check out the tutorial to see how it’s done. 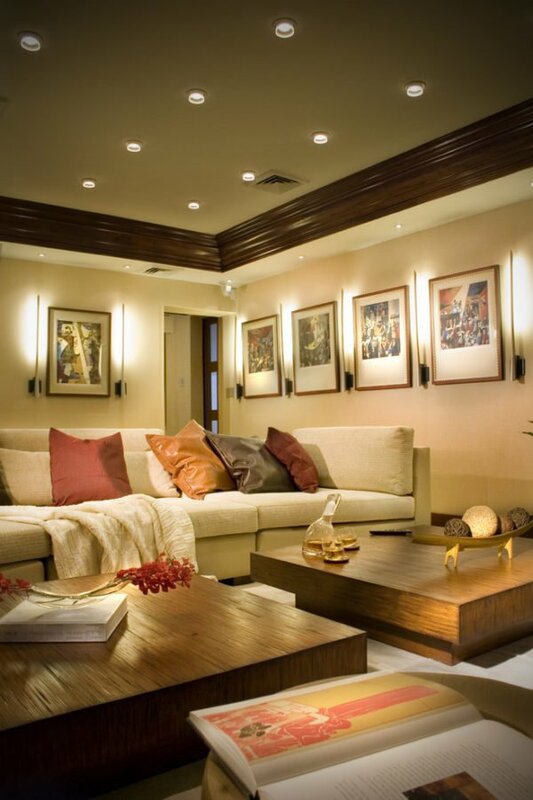 Wall lighting fixtures can pose quite a puzzle when trying to add them to your decor. 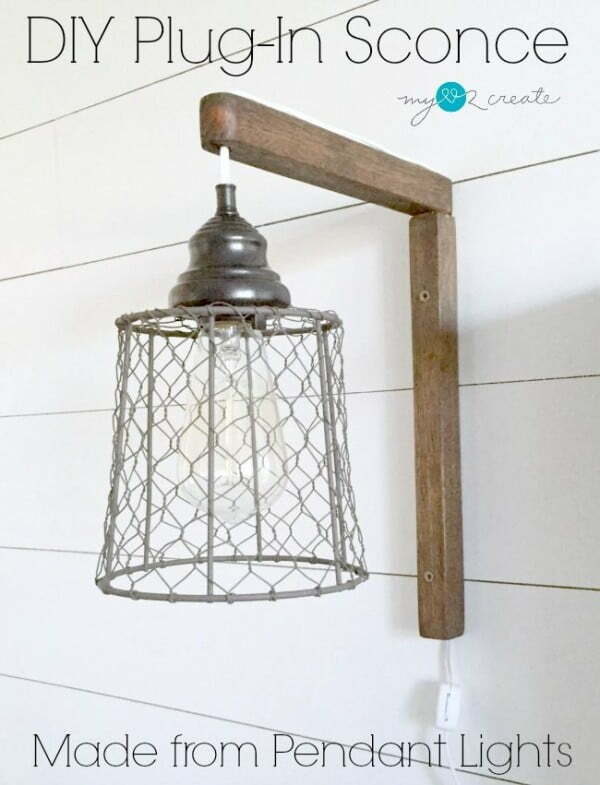 And while this DIY project is for a candle sconce, you can use the same idea for a light fixture as well. The rustic appeal is certainly attractive. The tutorial includes all details needed to build it. 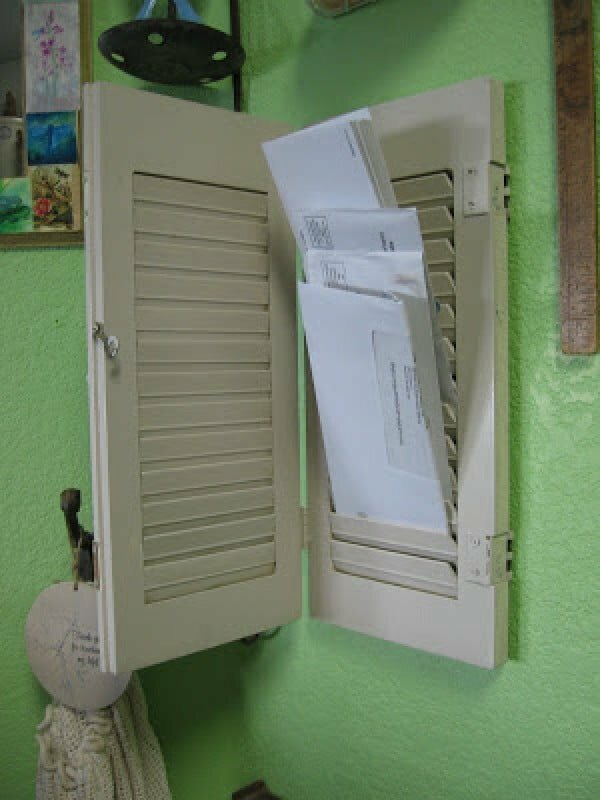 Store your mail in shabby chic style by keeping the letters away in a caddy made of old shutters. The cabinet like design will add a decor accent that is quite unexpected but attractive. The tutorial will explain you all the details of this project. 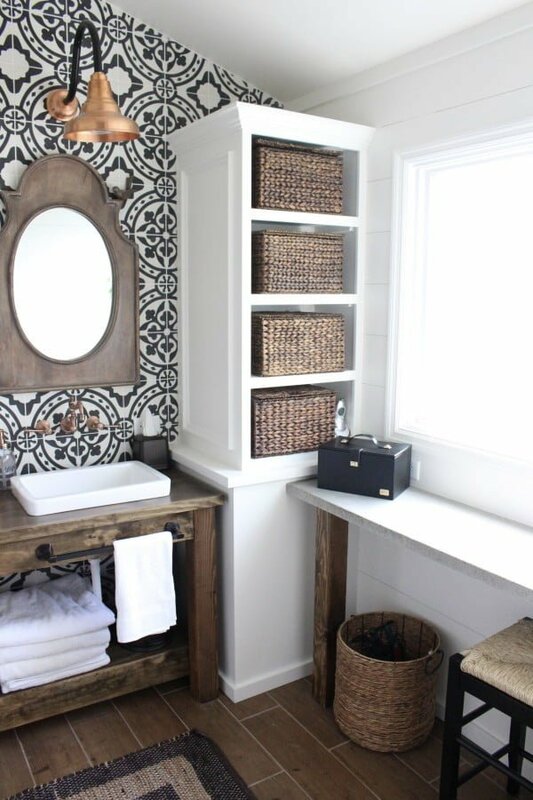 Bathroom can always use more decor accents and an old shutter is a great way to add them. This shabby chic towel rack is made fancy by crystal door knobs and serves as an attractive way to store towels. The tutorial makes this DIY project easy. 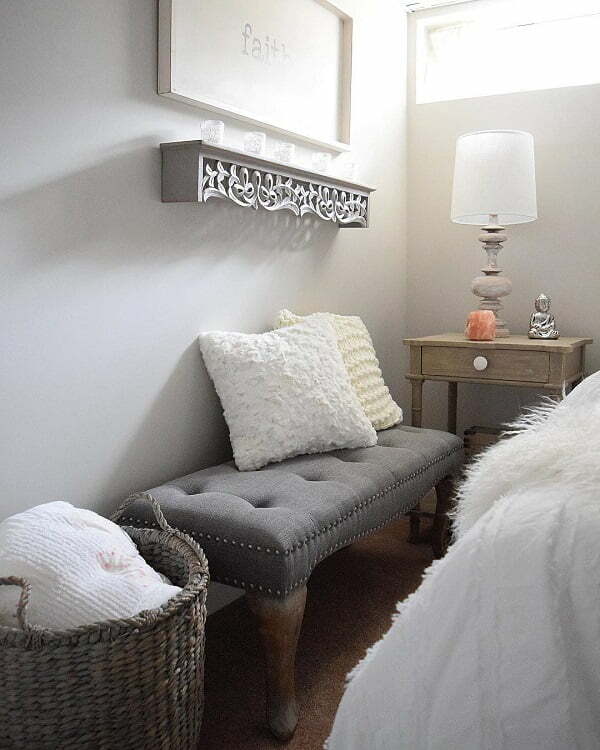 You can make this compact wall suspended nightstand with a lighting fixture from a simple old shutter. 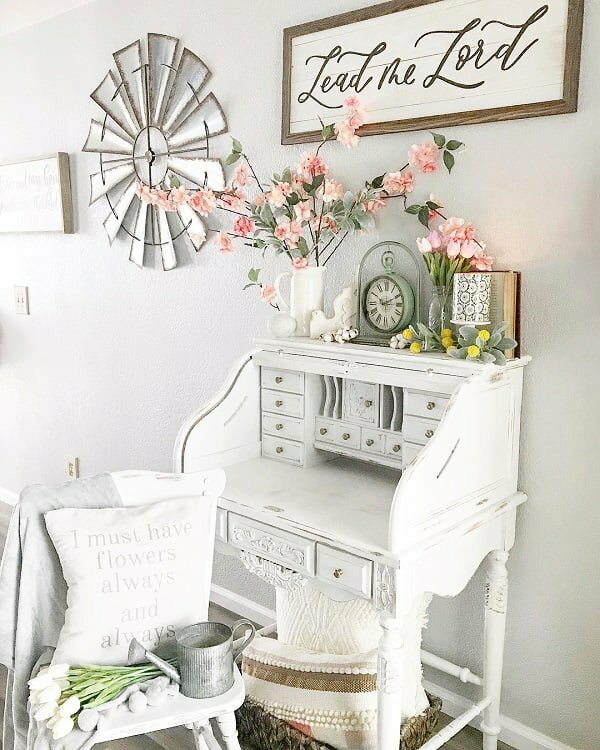 It’s a great DIY project to make and the shabby chic nightstand is just outstanding, especially if you’re decorating a small bedroom. Check out the tutorial for all the details. Few DIY projects are this creative. Take two old shutters and a few round cements forms, what do you get? 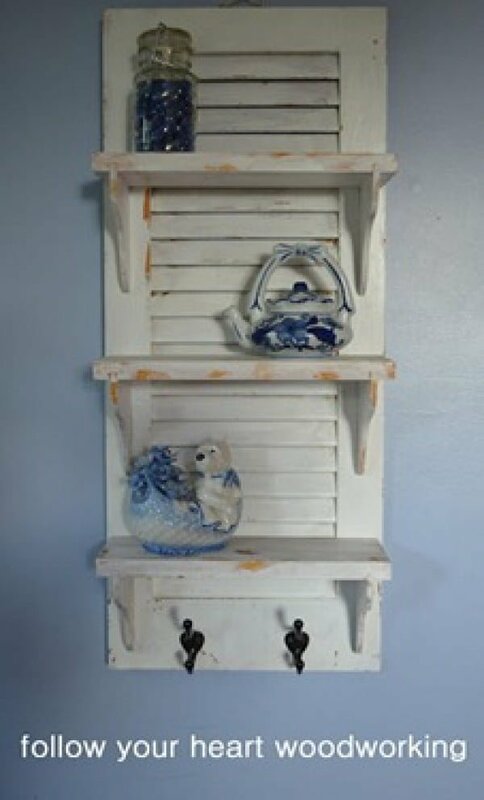 Why an absolutely beautiful shabby chic bookshelf that’s as stylish as it is a useful storage unit. Be sure to check out the tutorial to see how it’s built. 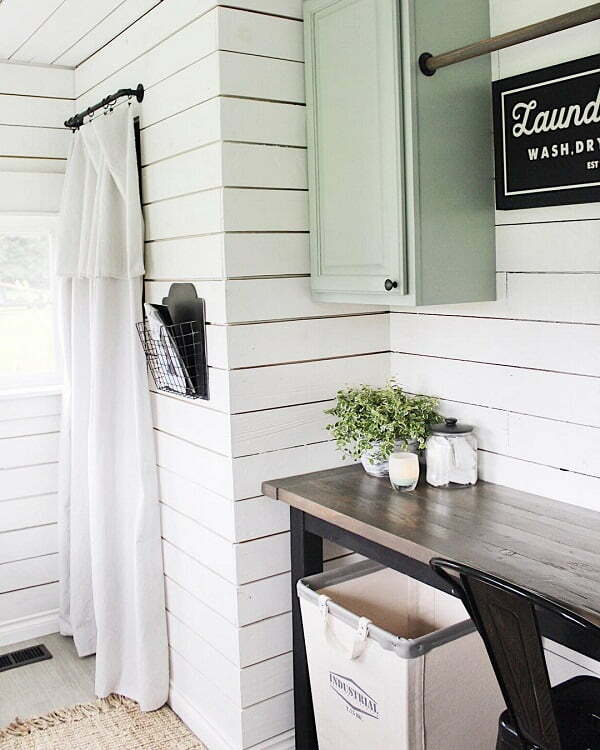 Here’s another way to repurpose an old shutter to a rack for towels or coats. It’s your choice where to use it but it’s going to be a stylish decor addition in any case. The tutorial will explain you how to build it the easy way. 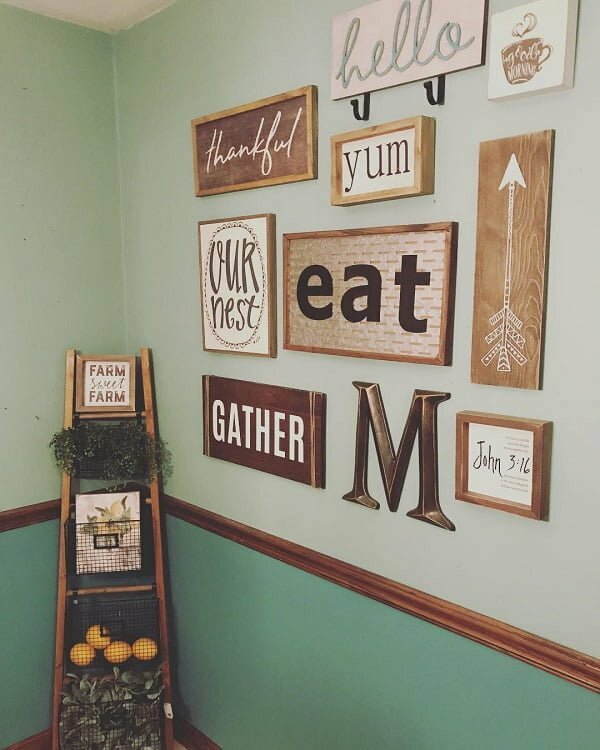 If you like the idea of having a bulletin board but you aren’t exactly excited about its effect on your home decor, this project just might be the answer. 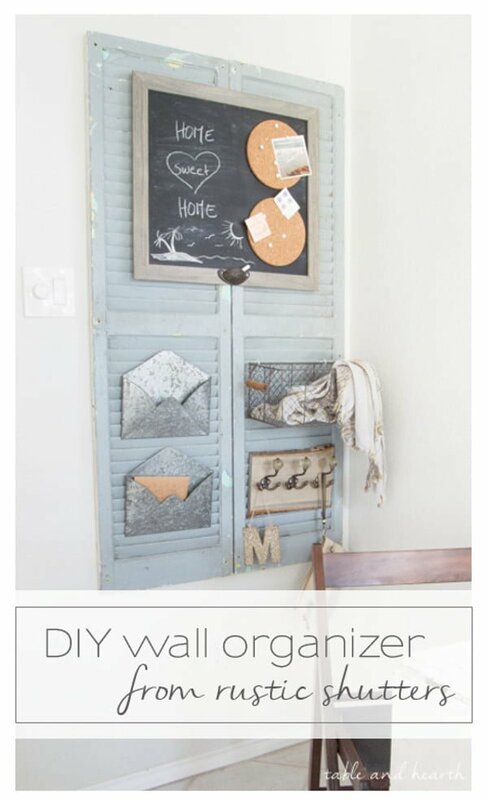 Build a closed bulletin board from old shutters as shown in this easy tutorial. 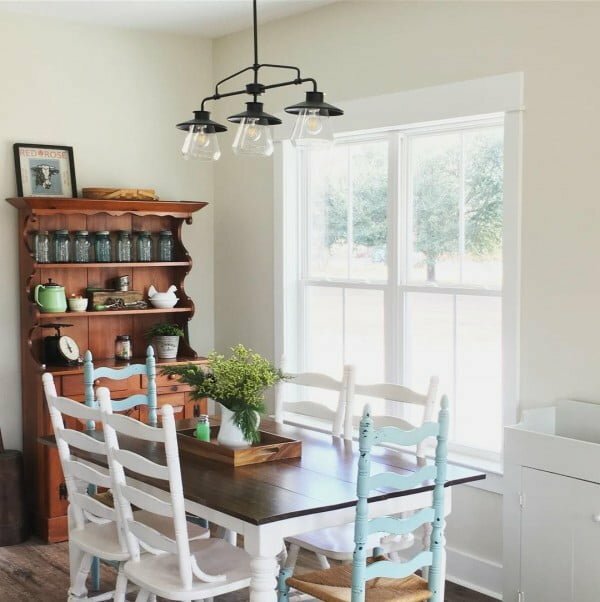 After you’ve chosen DIY tutorials for your farmhouse decor project, you’ll need some ideas for inspiration on how to implement them at home. 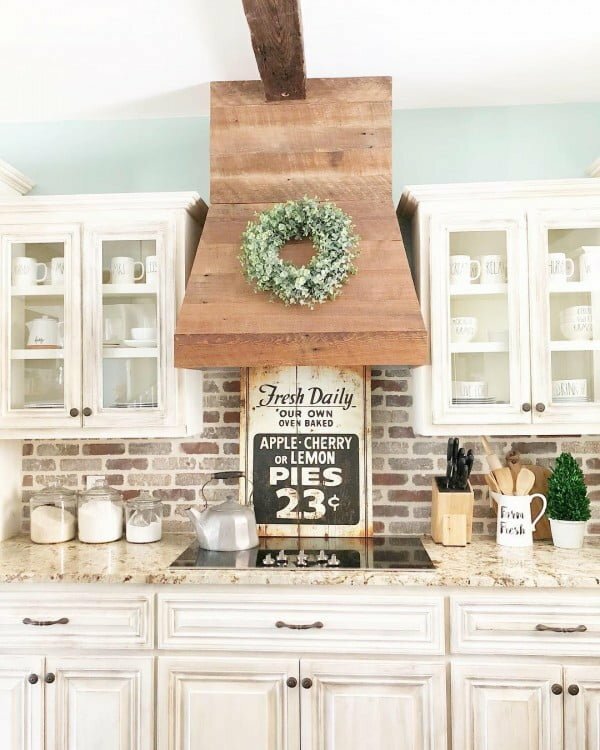 Below is a massive list of truly inspiring ideas on how you can use farmhouse style all around your house. 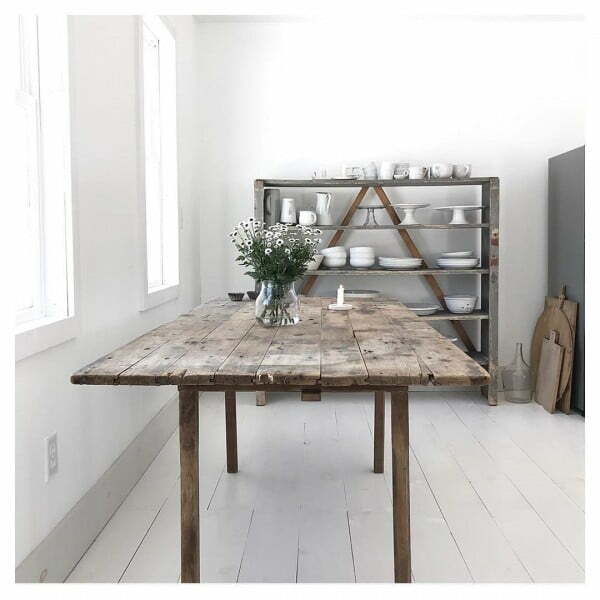 This fabulous trestle table features an old barn door for its surface. A great piece equally at home in the depths of Sherwood Forest or in Nottingham’s Castle. Perhaps no greater interior design enhancement has taken place in the last 50 years than the invention of the wall-hanging TV. It frees up entire rooms for more decorative purposes while retaining its basic functionality. From ancient times, humanity has gathered around a crackling fire. This stunning example transforms that atavistic ritual into a modern day expression of love, family, and home. 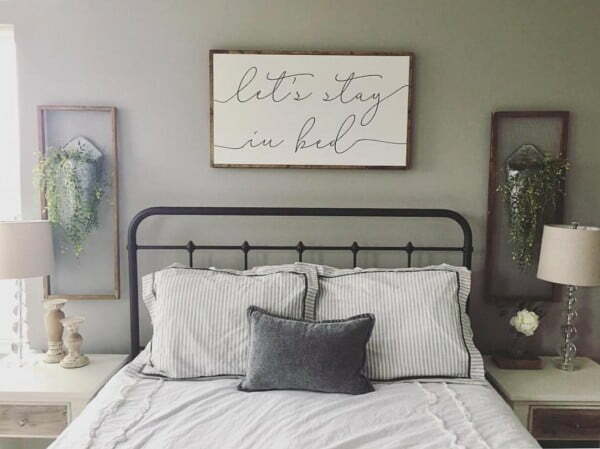 Pairing an inviting 20s style bedframe with the coy modern signage above it is a particularly inspired touch that says so much about the joy and happiness felt by the two people who sleep beneath it. 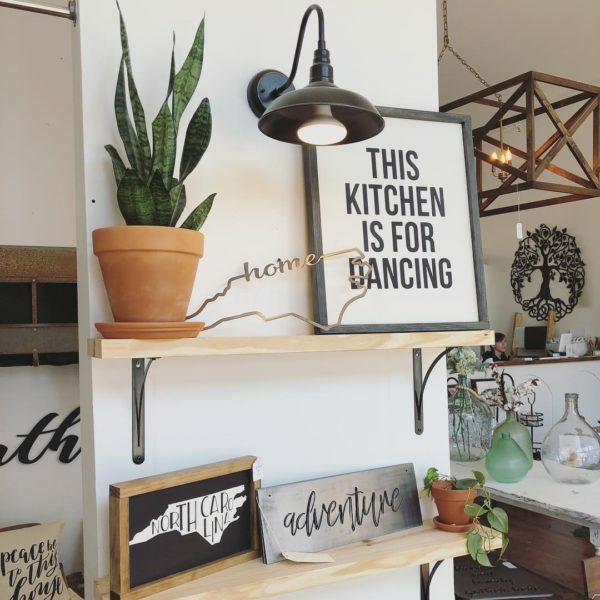 Retro signage has always been an item that is in high demand for farmhouse decor aficionados. This one works particularly well due to its muted color scheme that is a perfect complement to most farmhouse palettes. 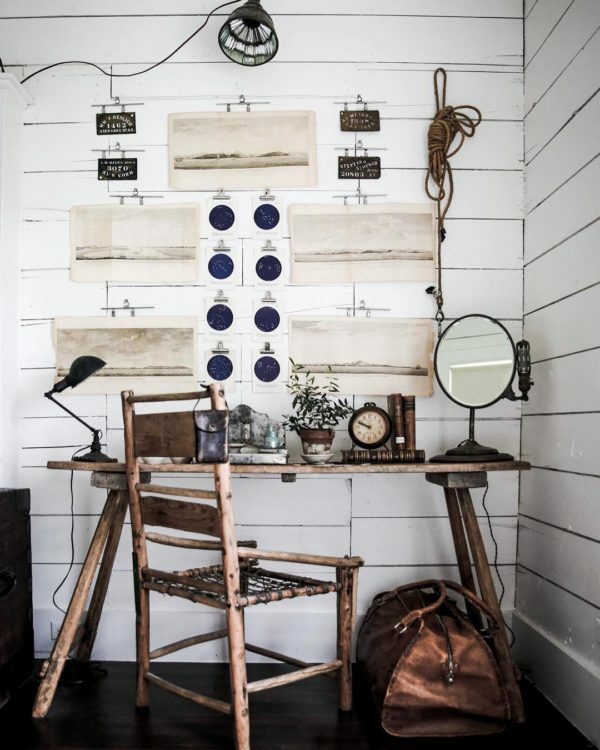 Farmhouse decor can be found everywhere, nor are there any ironclad rules as to what it must be. 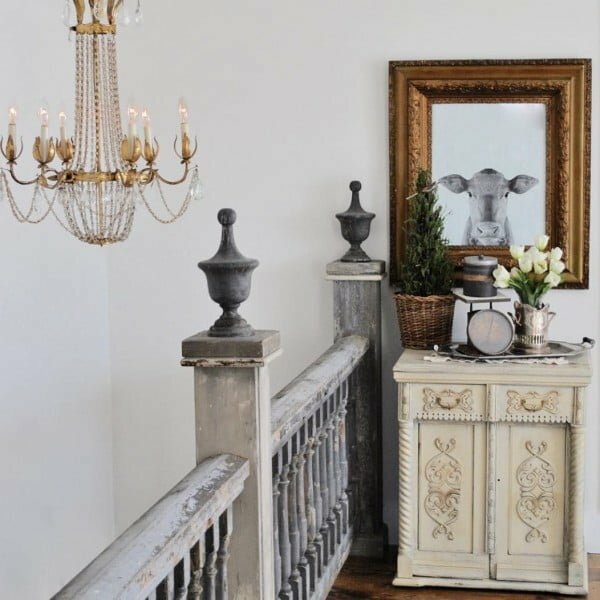 This shabby chic banister is a case in point and yields an image that is more evocative of genteel urban decay than anything else. Repurpose is the name of the game when you see these completely original overhead lights. Everybody only has two questions about this daring bit of illumination: Where do I get some and how do I convert them? 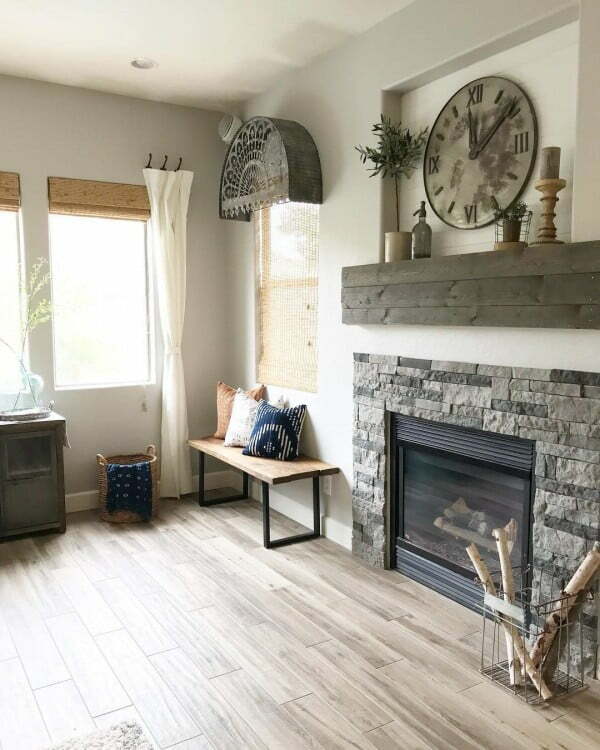 Just because you don’t have a fireplace doesn’t mean that you can’t create a lovely stand-in for one. Even if for nothing else, those Christmas stockings have to hang somewhere. Pallets are one of the most strenuously utilitarian items in the whole universe. It is often surprising to see all of the different ways in which their humble origins can be transformed from an industrial chrysalis into the butterfly of artistic usage. More is not always better as this sparsely-furnished space attests. Much of its impact clearly derives from its singular focus on a limited range of items. Given the choice between this delightfully unique creation or some pre-fabricated assemble-it-yourself cube of particleboard, which would you prefer to have in your home? Me too. Even a single piece can be used to evoke the charms of a bygone era. Such is certainly the case with this cuckoo clock. These are the types of one-off items that all remember but few have ever seen personally. 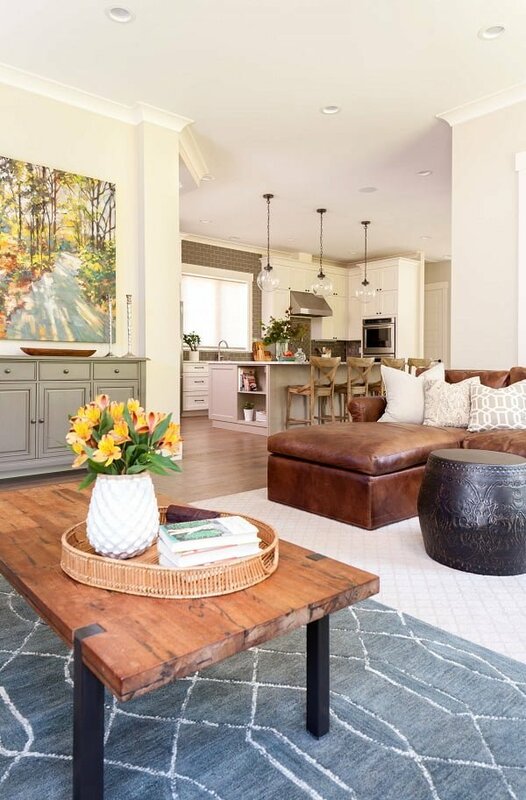 While much of farmhouse design focuses on the white/dark dynamic, it is important to add a few splashes of color into the mix in order to prevent something from becoming too monochromatic. Not everybody has a vast cavernous living room to work with. At times you simply have to concentrate your efforts on making a particular space attractive. 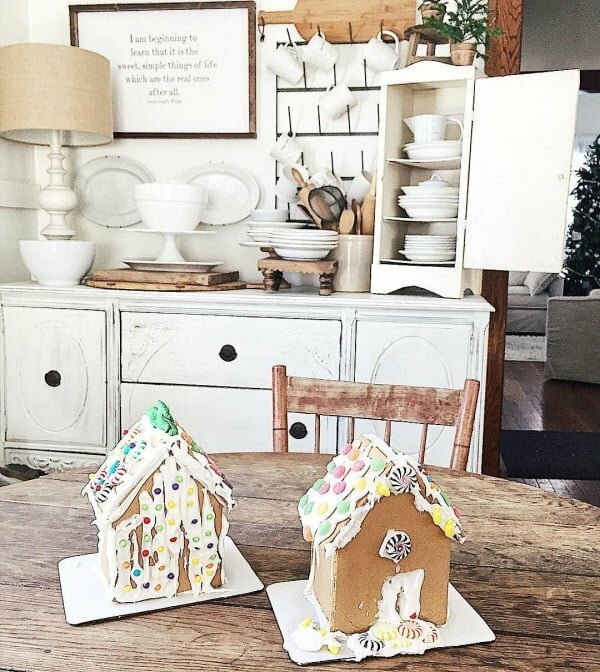 One of the hardest aspects of decorating is to know when to stop. There’s always one more great piece you could add– and it would totally ruin the perfection you have already achieved. 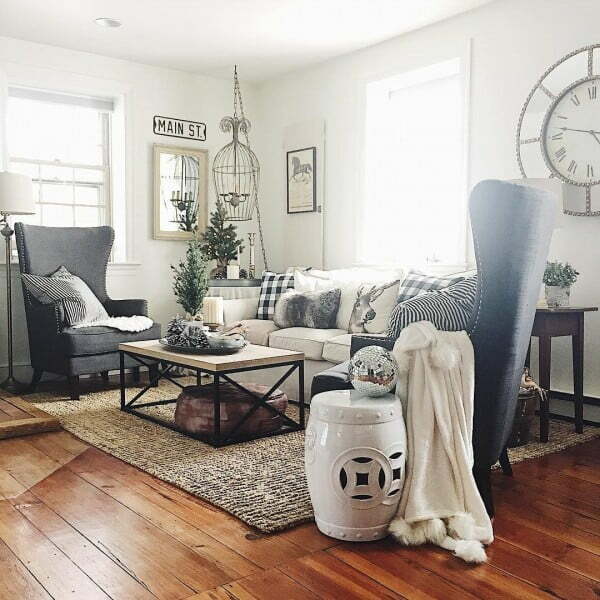 Making the decision to go for farmhouse chic in any room is made much easier when you have a delightfully imperfect wood floor to start with. What else could possibly look better on such a foundation? 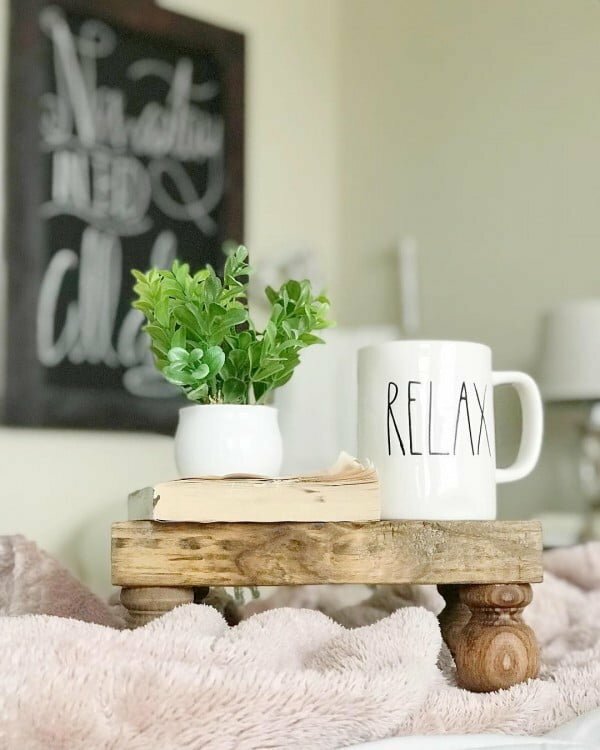 This cute little DIY tray is the perfect size for your book and cuppa. Plus you can make it yourself in any fit or finish you desire. 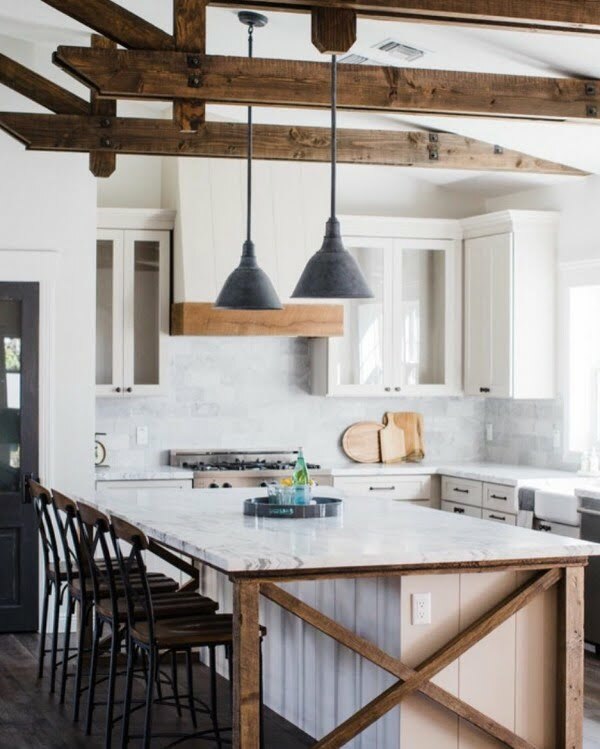 Much of the emphasis of the farmhouse decor movement lies in the search for contrast– most often seen in the sharp delineation between pristine white and often-distressed but always contrasting wood features. Old wood frame windows add real eye-drawing impact and provide a nice tight boundary for the old bureau in the center. Nice symmetrical example of, what else, framing the piece to maximum advantage. Even a sprinkling of assets can significantly alter the overall vibe of any space. That is certainly the case in this instance of minor accessories making a big impact on a definitely non-farmhouse room. Or maybe not, if that bed is as comfortable as it looks. 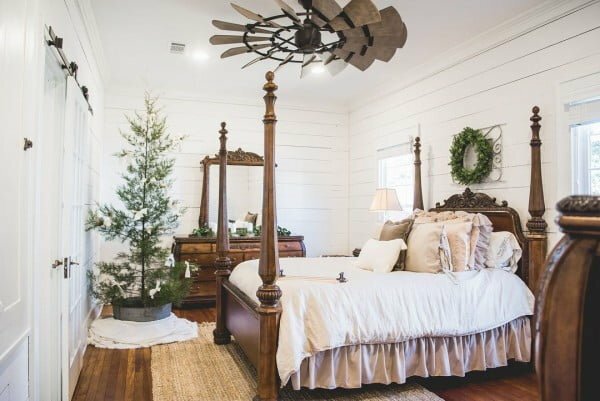 Lovely shiplap walls and genteel plantation elegance provide a unique regional take on the classic farmhouse look. Sometimes you just have to create your own accent piece to complete the ensemble. 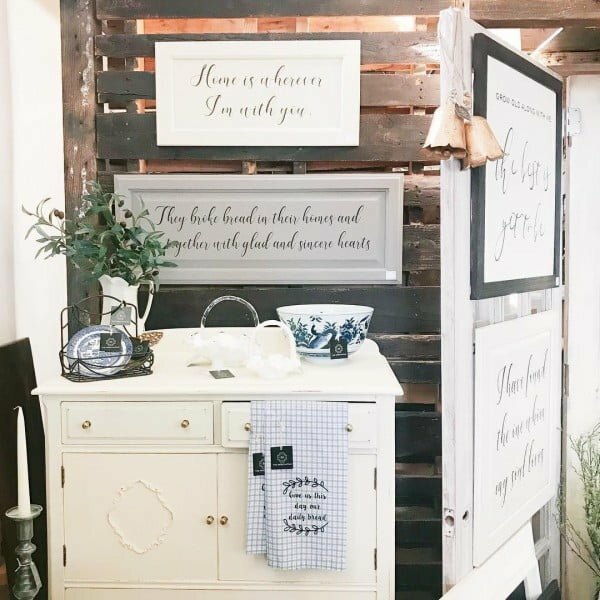 This homegrown distressed sign shows that you don’t have to wait until you find the perfect piece when it is right there in your mind already. 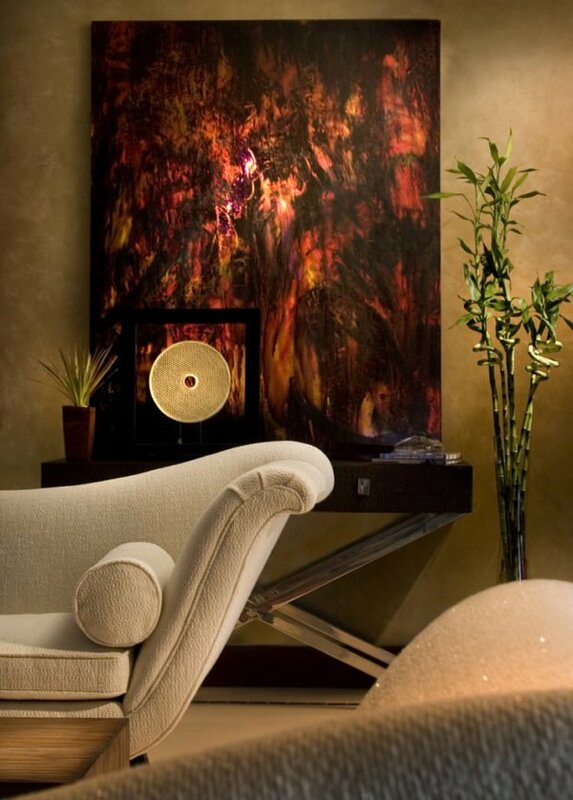 Elegance never goes out of style, as shown by this lovely hanging lamp. You can almost hear the piano tinkling in the background. 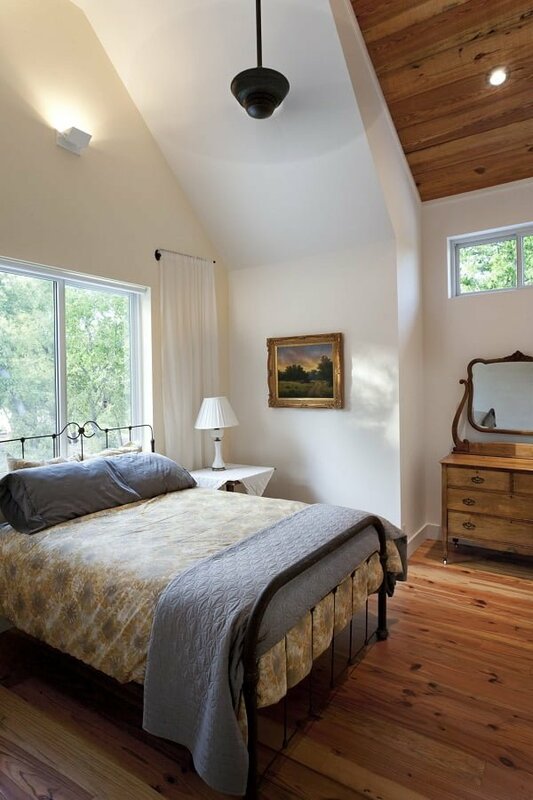 Instead, this charming antique dough bowl provides the perfect accent for a lovely low-key farmhouse-style bedroom. The name of the game with farm decor is adaptation to new purposes and this one scores big on that front. 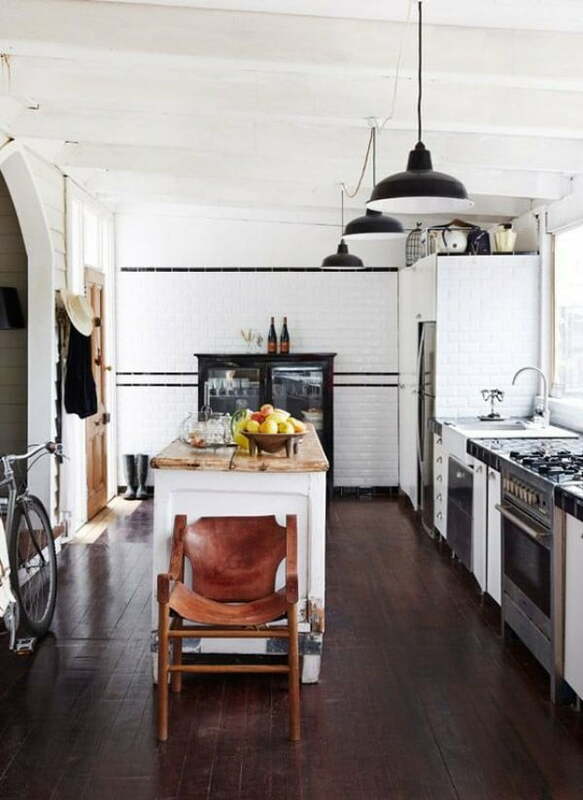 How about a perfect example of why you don’t need to live in a tin-ceilinged Victorian to enjoy the charms of a farmhouse kitchen? This clever island adaptation shows that you aren’t a prisoner of your original home design. 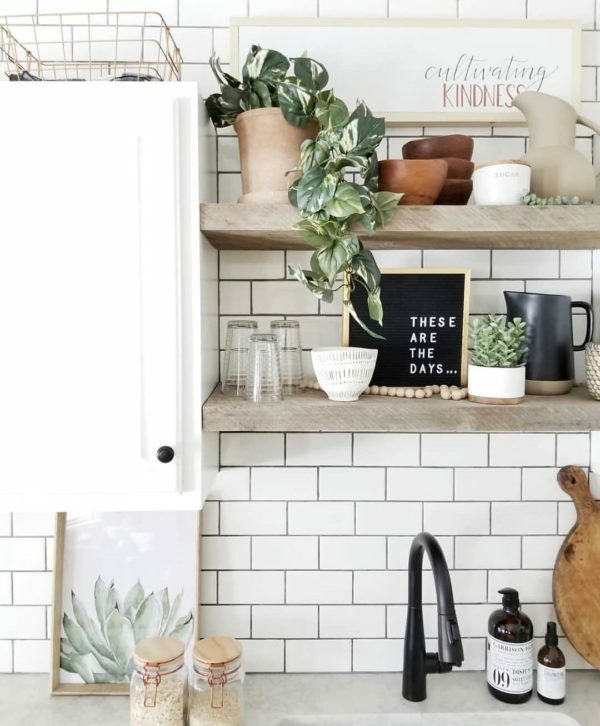 This is such an effortless looking kitchen sink area that you just know it took a long time and plenty of thoughtful planning to get it to the just right stage. 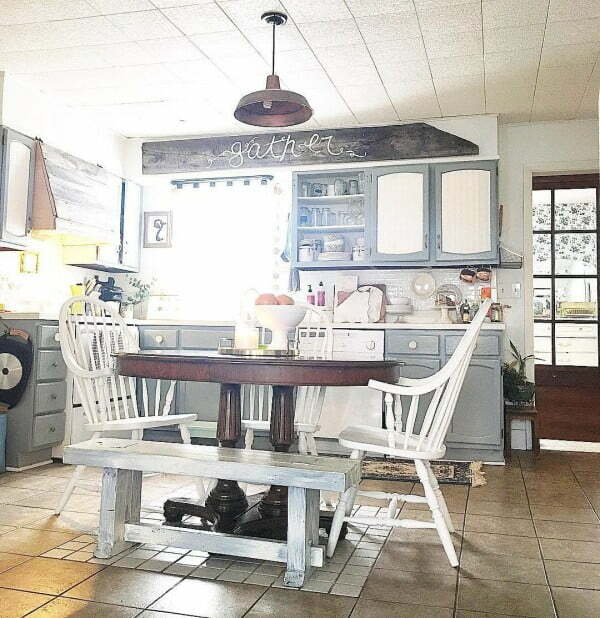 Wonderful contrast between the stark white cabinetry and plate set with the hyper-distressed table and chairs. With just the perfect added touch of monochromatic accessories. 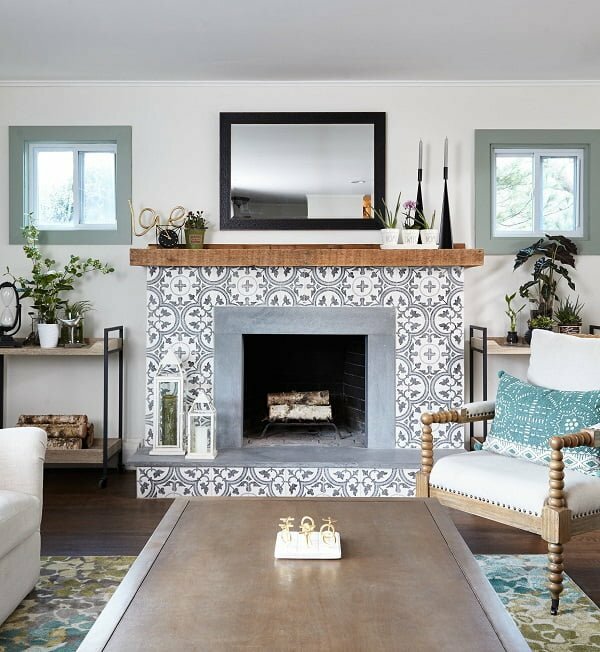 The great Southwest has its own tradition of relaxed and comfortable living that offers manifold opportunities for interior design exploration – as evinced by this bold fireplace mantel. One of the great delights of farm decor is that you automatically get lots of places to display your special things in settings that just seem comfortably right rather than strenuously contrived. 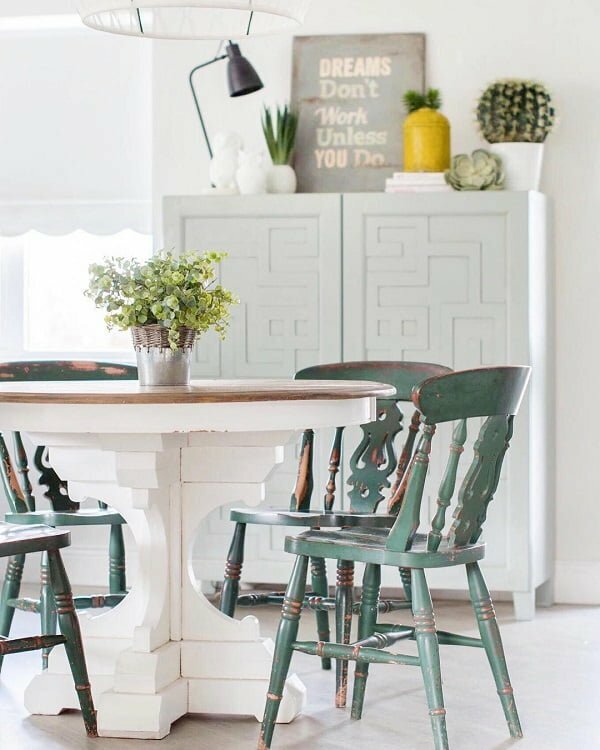 Mismatched chairs go perfectly with this traditional farm-style table. The wall pieces also add charm without having to bow down to the gods of conformity. This little nookery is all about warm, cozy comfort and features that staple of many farmhouse themes – plaid. Yet it does so in a tasteful and understated way that melds well with the other accents. Not all farmhouse decor ideas come from the English-speaking world. Here’s a charming and practical little dish cabinet from Germany that is just perfect for that one lonely slice of wall space that you can’t find any use for. Here’s a fabulous pantry sliding door that is jazzed up even more with a smartly executed wall-size blackboard lurking behind it when closed. Excellent example of maximizing space to perform multiple tasks. Out in the country, you use what you have. This comfy kitchen with its assorted collection of table and chairs is a perfect example of that trend being used to real advantage. With these delightful sliding barn doors separating your inside spaces, you may actually be able to answer yes to that question. Perfect for those places where swinging doors would cause a conflict with furnishings. Nothing says farm style quite like painted wood. These shiplap boards go right over an existing wall and definitely create the proper rural ambiance around which to build everything else. Farmhouse and elegance are not necessarily mutually-exclusive concepts as shown by this lovely scrollwork chandelier. Even farmers have dining rooms and this would go perfectly in one. Nothing says farmhouse like old-fashioned milk glass serving ware. 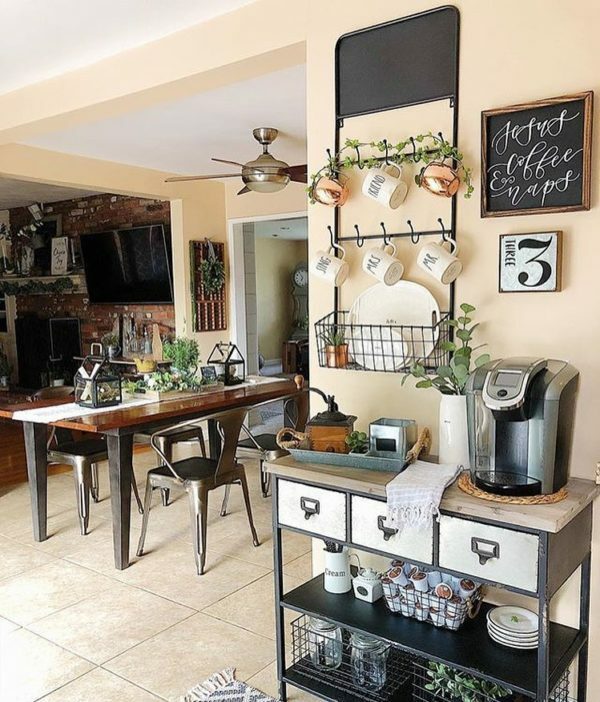 These stylish pitchers and platters would look great in any setting but are particularly apropos for farmhouse decor themes. 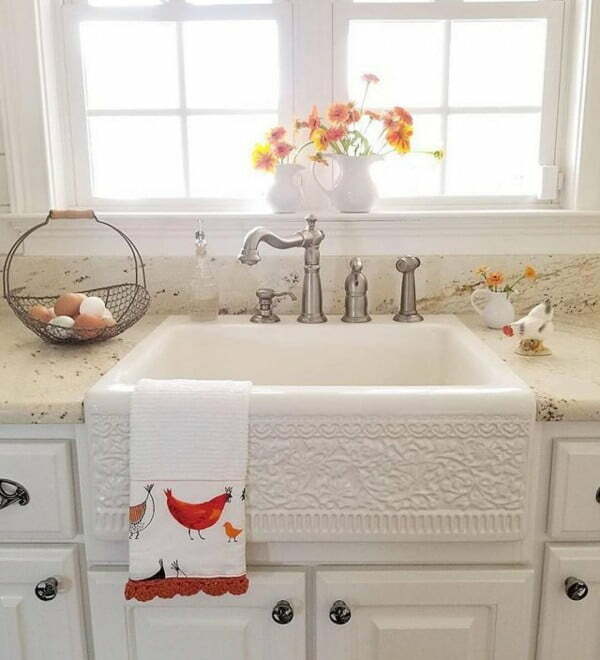 Those deep farmhouse sinks make fabulous kitchen additions. Under a window, the sink wall becomes the main feature wall of the space. 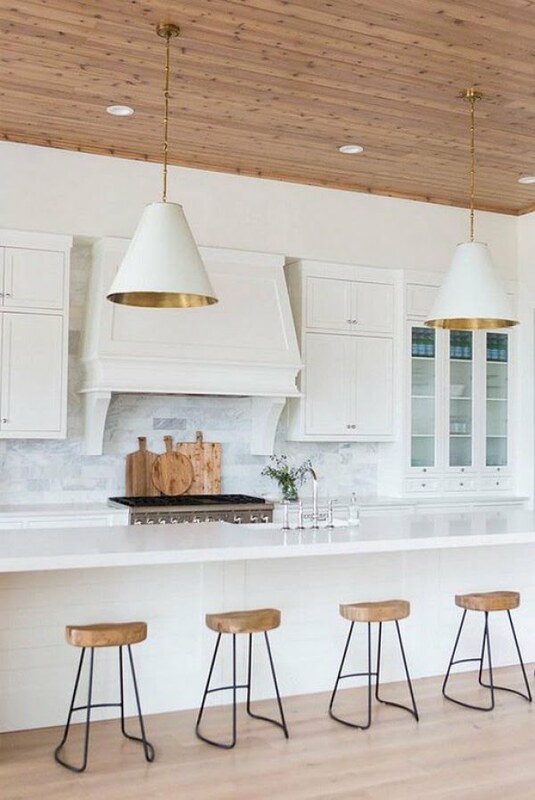 Pendant fixtures in the kitchen are the perfect place to make a decor splash. The brushed metallic look achieves an industrial farmhouse look. Few things are more cosy and inviting than a breakfast nook with a bay window seat curled around a table. Add some throw pillows and an even softer layered look is achieved. 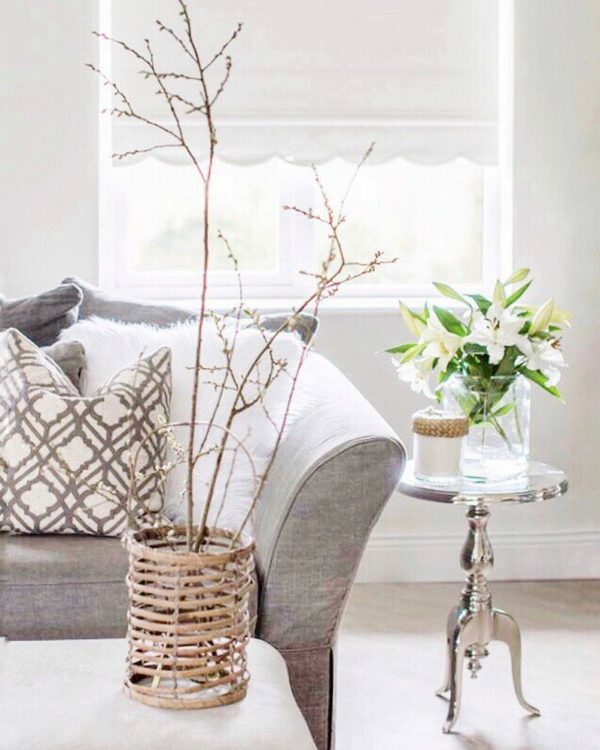 A neutral color palette is essential when trying to cultivate the farmhouse decor look so many strive for. 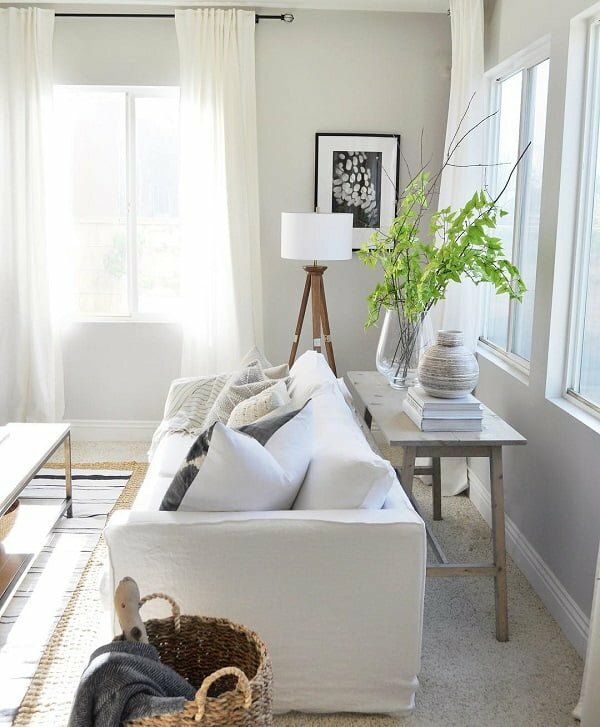 Greys, whites, and creams synergize in a way that is calm, cool, and collected. 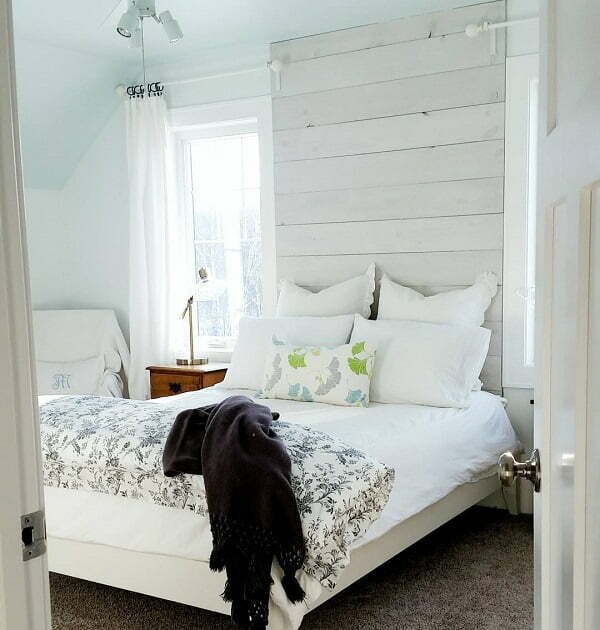 Adding shiplap to walls and ceilings does more for a space than any number of furniture pieces can. The depth and architectural interest it adds sets the tone for the entire room. Having a large-scale chandelier in a living room helps to anchor the eye and center the room. The furniture arranged below frames the lighting fixture. Ornate frames have a distinctive old farmhouse vibe, and a gold ornate framed mirror adds just the right punch of character to a hallway. 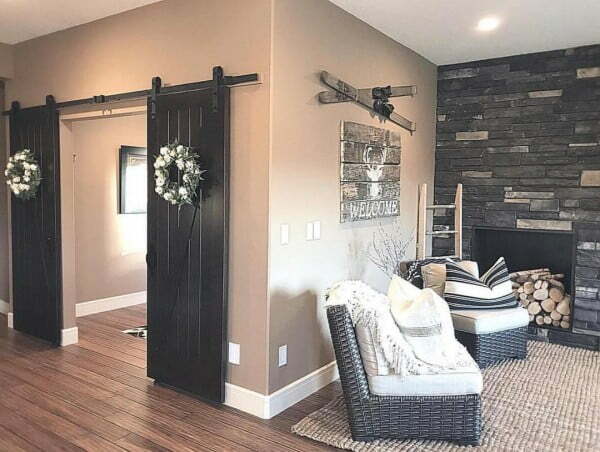 Few things are hotter right now than sliding barn doors and hardware. An open floor plan doesn’t have to always be open. These sliding barn doors can demarcate a space with ease, beauty, and practicality. 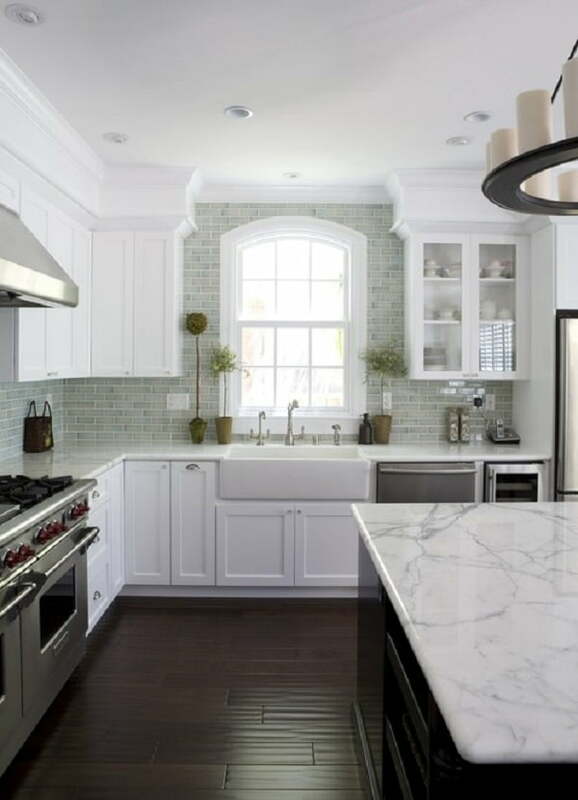 A recent trend in interior design is to focus on adding items of architectural interest. The thought is that these details alone can carry a room more than any accessories can. Adding a small shelf unit that fits perfectly into the allotted space can resemble a built-in unit, especially when painted the same color as the wall. 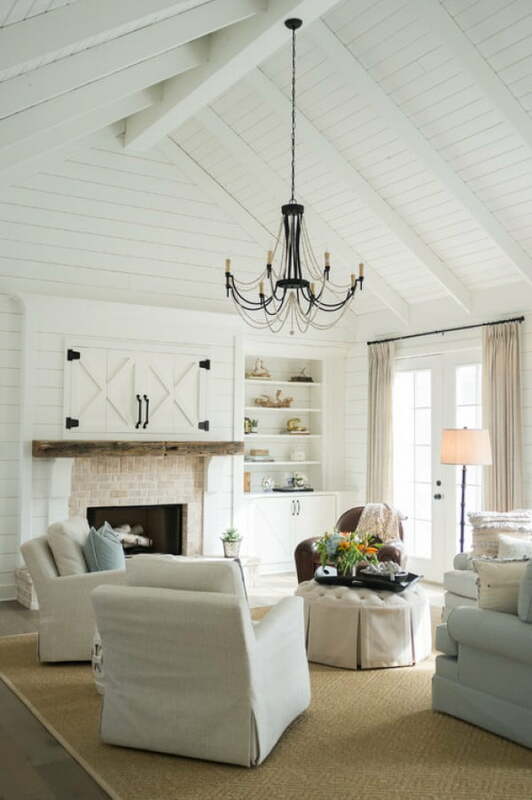 Pairing rustic wood, such as wood ceiling beams, with white walls and cream accents delivers the farmhouse feel of country charm to perfection. 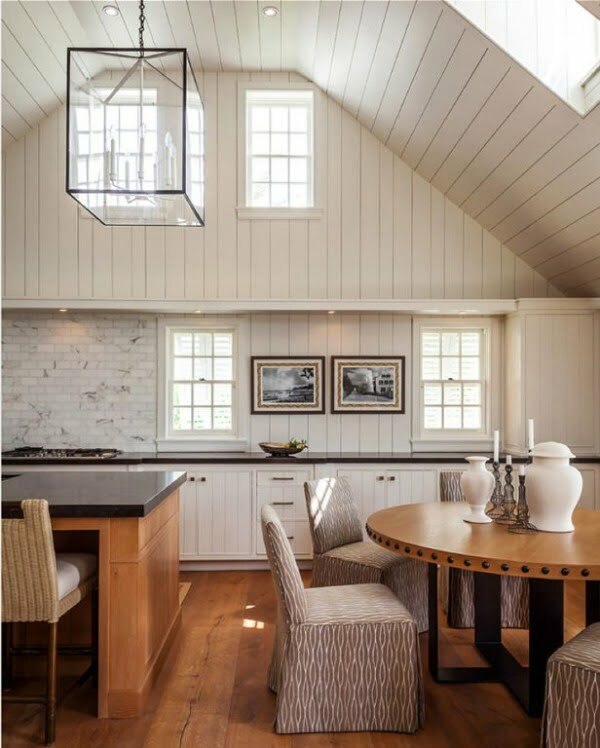 A vaulted ceiling in a kitchen mimics the look of a charming barn roof. 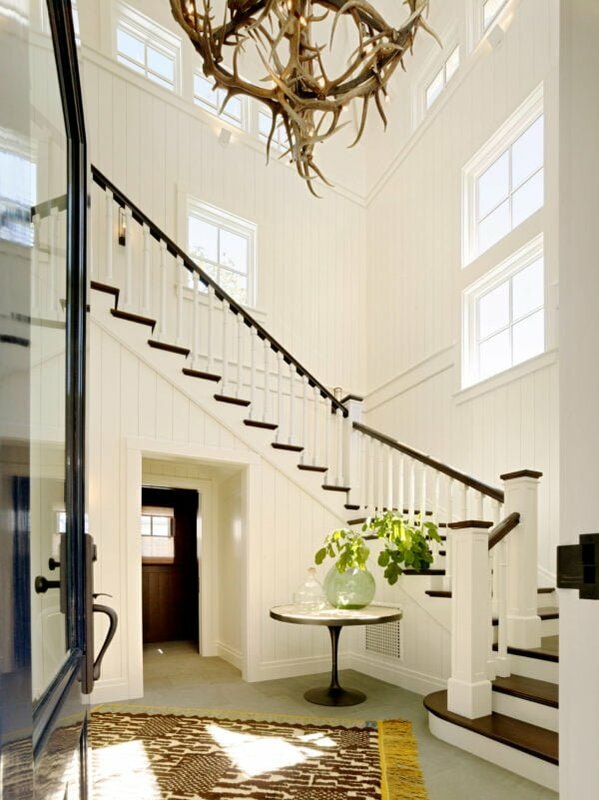 The added shiplap accentuates the lines and keeps the eyes focused upwards. Having an island in a kitchen space is a lifesaver when it comes to creating additional counter space, storage, or a seating area. One made of chunky wood is ideal for spreading the farmhouse vibe far and wide. Few things seem more farmhouse than large numbers or words printed on textiles like table runners. 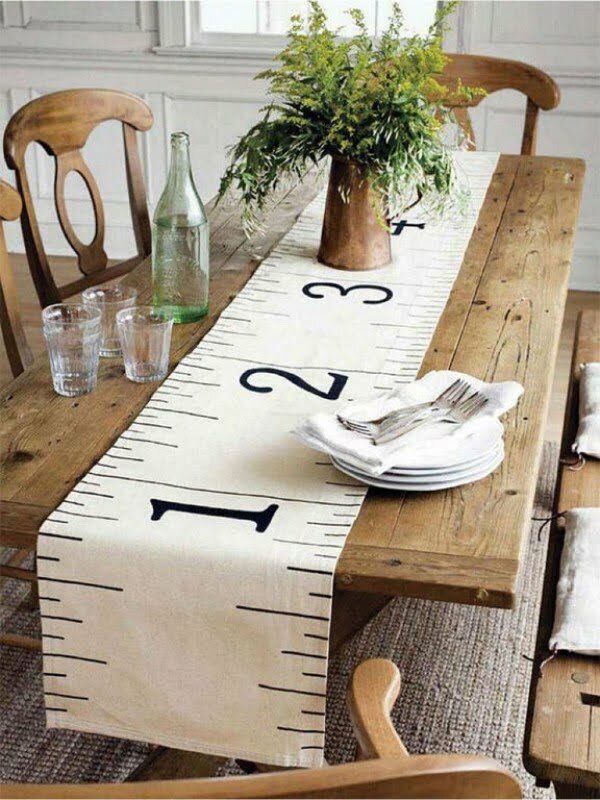 The ruler table runner pops against the rustic wood table beneath. Adding some striped textiles into a kitchen space, such as in a runner floor mat, adds just the right amount of farmhouse flair. 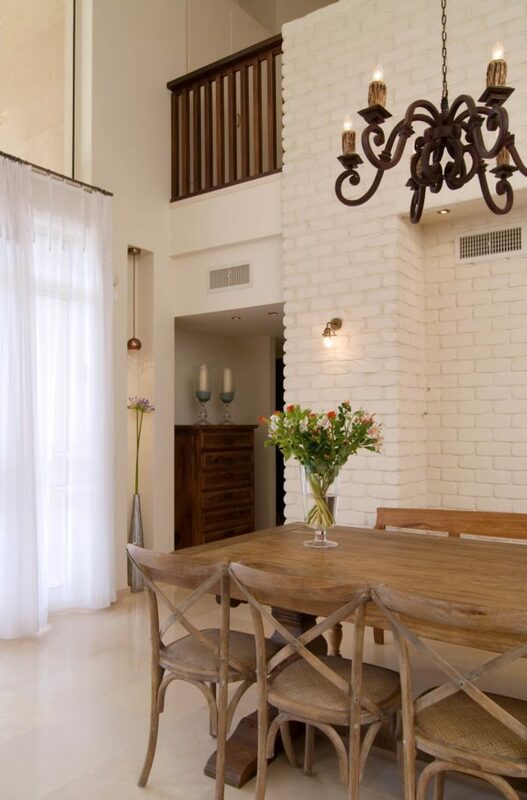 Adding wood planks to the ceiling is a great way to make a statement. Wood always adds depth and warmth to a space, and when it is added to a ceiling, it adds instant visual interest, character, and charm. Ceiling is the forgotten wall and in this decor idea wood planks are used to create the perfect accent space with lots of decor interest. Who needs the traditional stool seating at a kitchen island when you can have unique wicker seating. 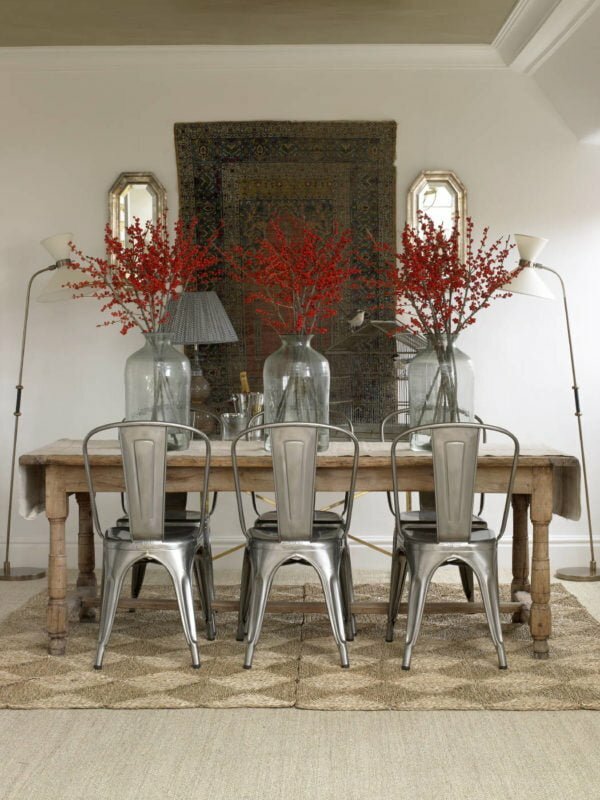 Wicker seating indoors is a great way to breathe some casual al fresco living into a kitchen space. 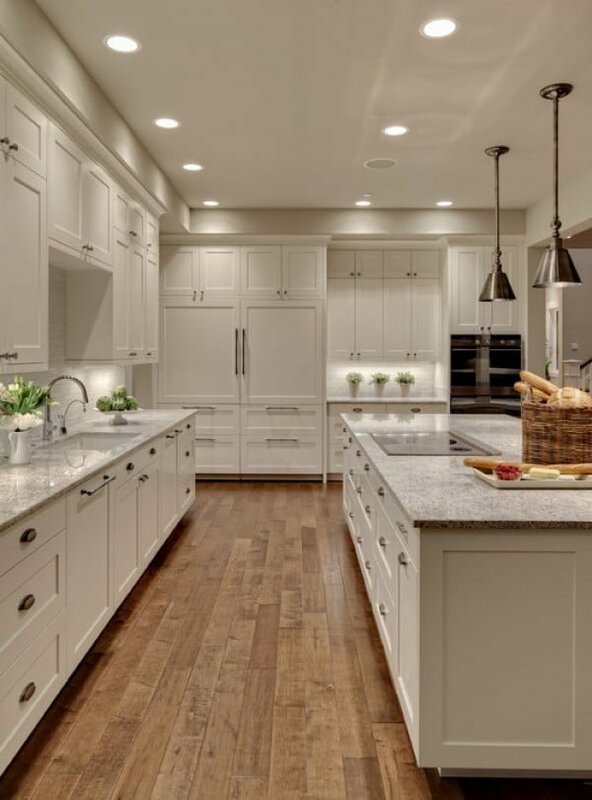 Having a warm-toned hardwood flooring in a kitchen is as practical as it is aesthetically pleasing. It is easy to keep clean and shiny while warming up a large space and making it feel more intimate. The crisp color contrast of black and white is a tough one to beat. It is sharp, crisp, and clean looking. 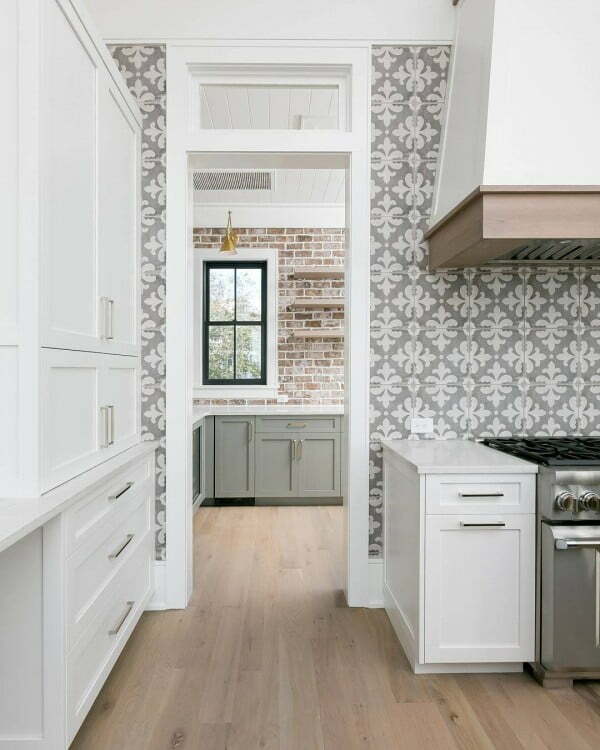 In a kitchen, black farmhouse lighting and black tile touches unify the space with a touch of whimsy. 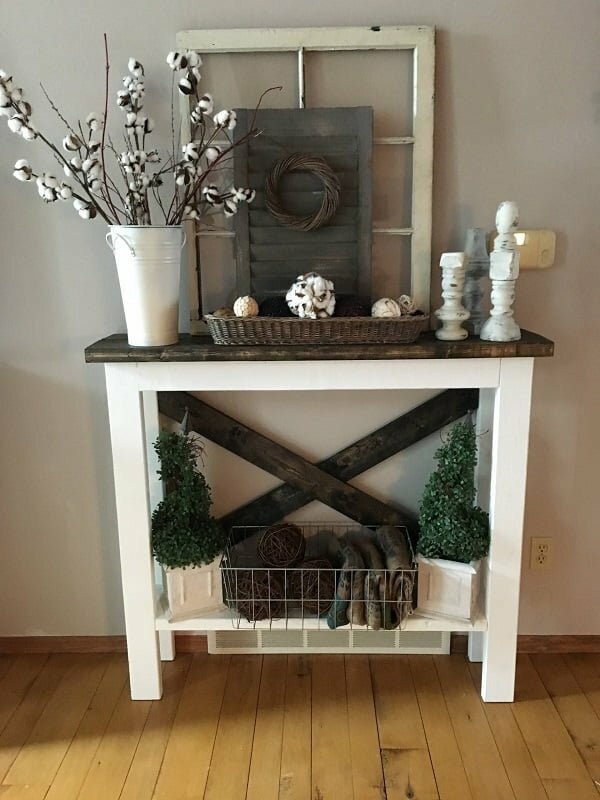 The farmhouse look is fairly easy to accomplish with a few key pieces, one of which is a weathered wood furniture piece. 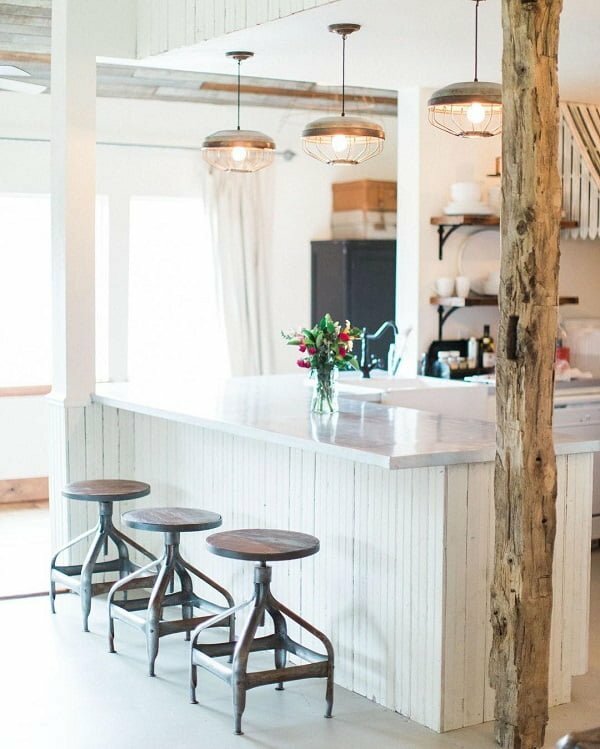 The chippy-white table adds just the right amount of rustic charm that all farmhouse kitchens seem to carry. 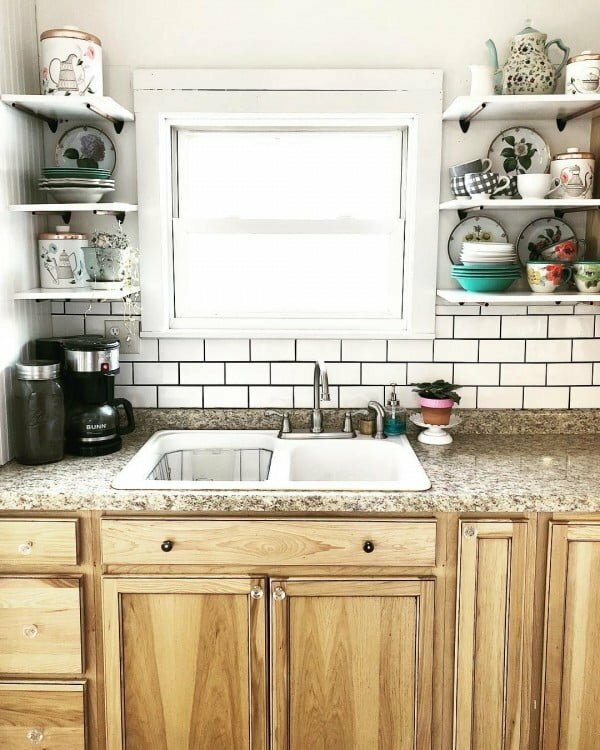 Adding open shelving to a kitchen is one of the easiest and most inexpensive ways to instantly up the farmhouse decor factor. 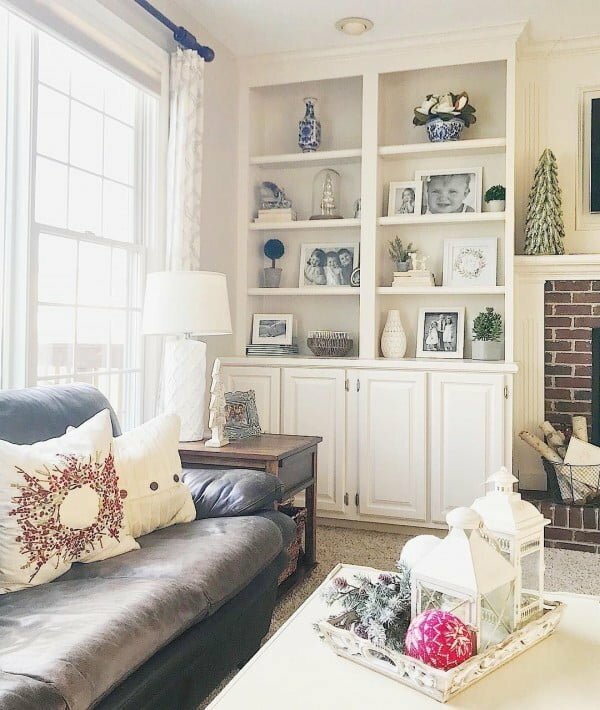 Shelves are the perfect places upon which to stage accessories, use for extra storage, and easily display and switch out seasonal accent pieces. 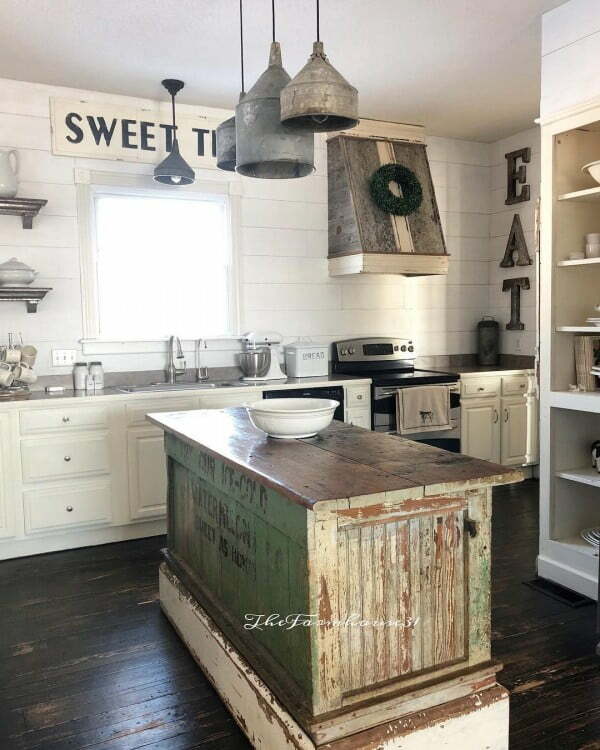 A unique corrugated tin ceiling in a kitchen instantly achieves that galvanized farmhouse look. It reflects and changes with the different lighting staging of the day and is a one-of-a-kind ceiling. Contrasting fabrics of bedding and pillows make a bedroom space more interesting, as well as adding a layered and homespun feel. 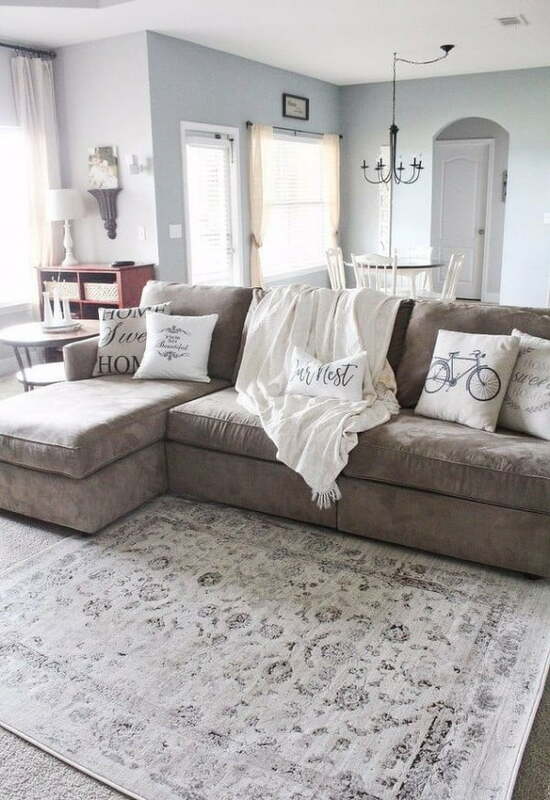 Whimsical decor works in farmhouse style really well. 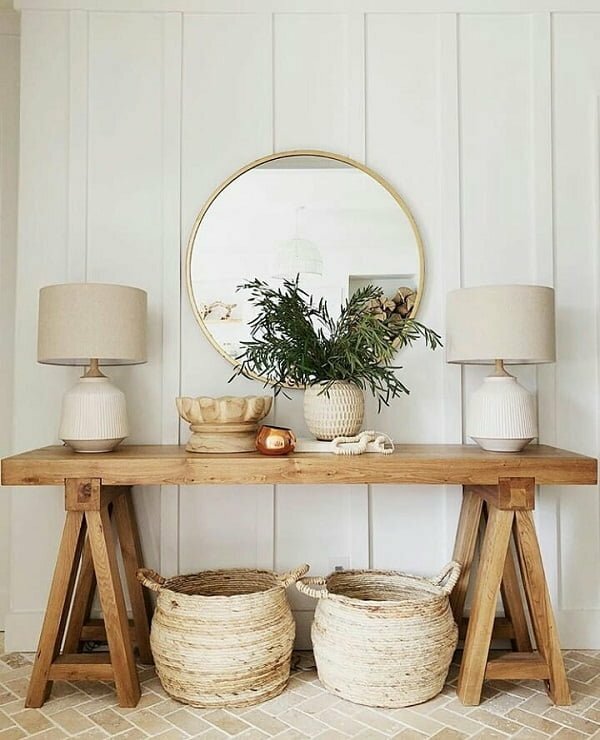 A well placed tree stump side table not only brings new materials and shapes to room decor but helps to create a cozy look as well. 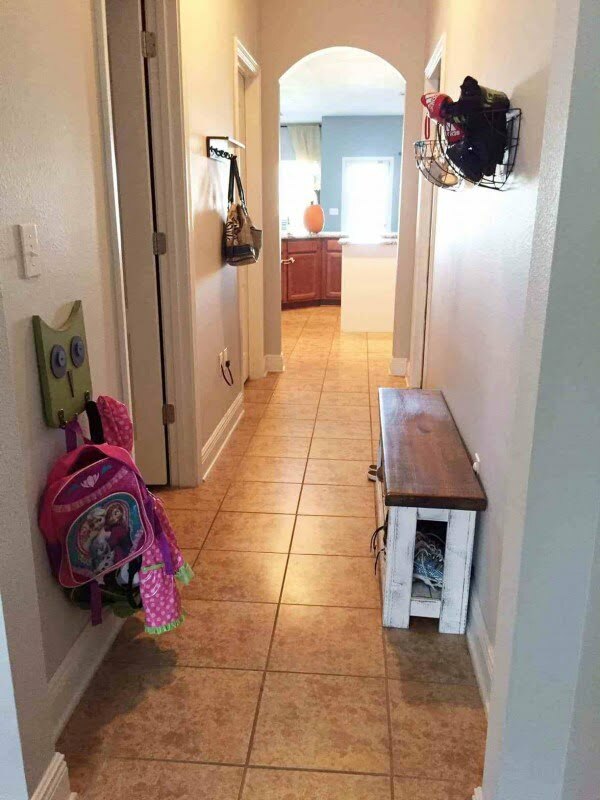 A bench in an entranceway provides people with the perfect place to put shoes on, or set items upon. 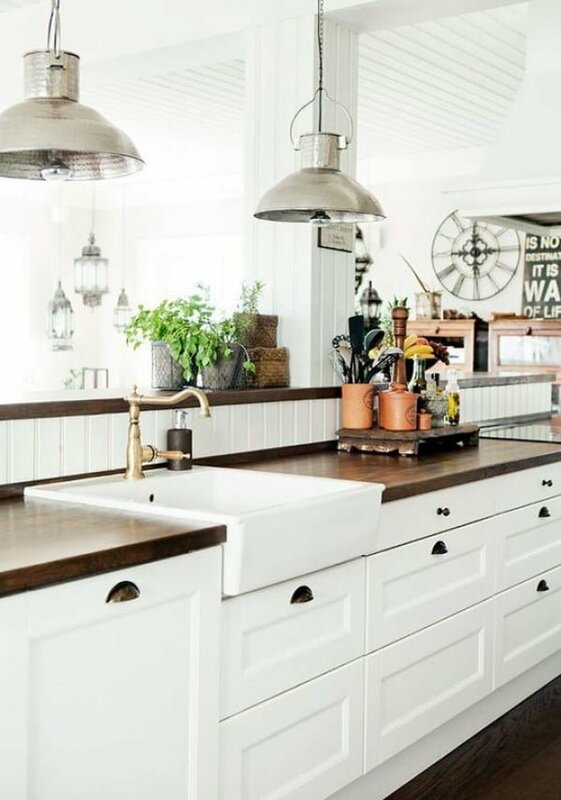 The rustic two-toned look of warm wood and weathered paint is the pinnacle of farmhouse panache. 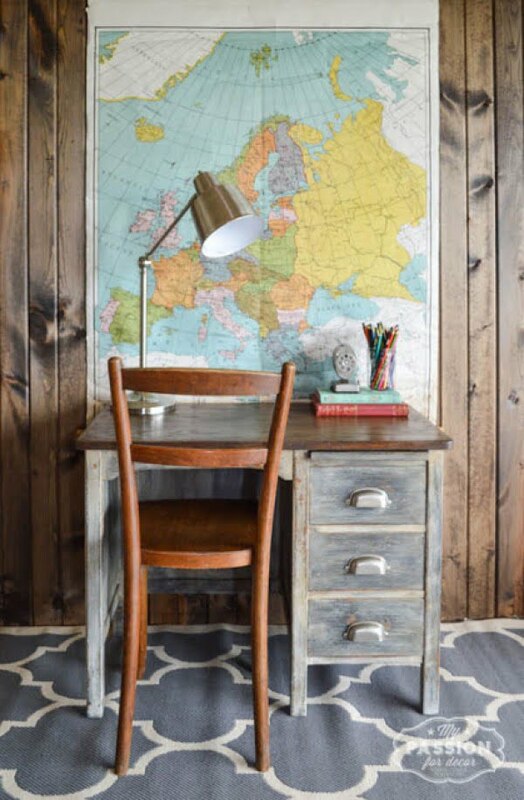 Rustic wood desks make perfect work stations, adding warmth and character. A wood vanity in a bathroom is a unique alternative to the traditional porcelain sink units. A two-tone pedestal table featuring a warm wood top and a cool black base is both modern and traditional. 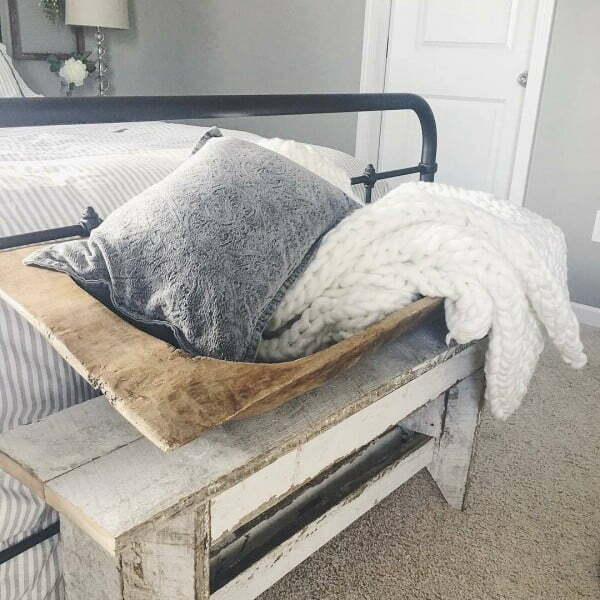 Weathered furniture always give out that vintage look that serves to create the best cozy farmhouse look in any setting. 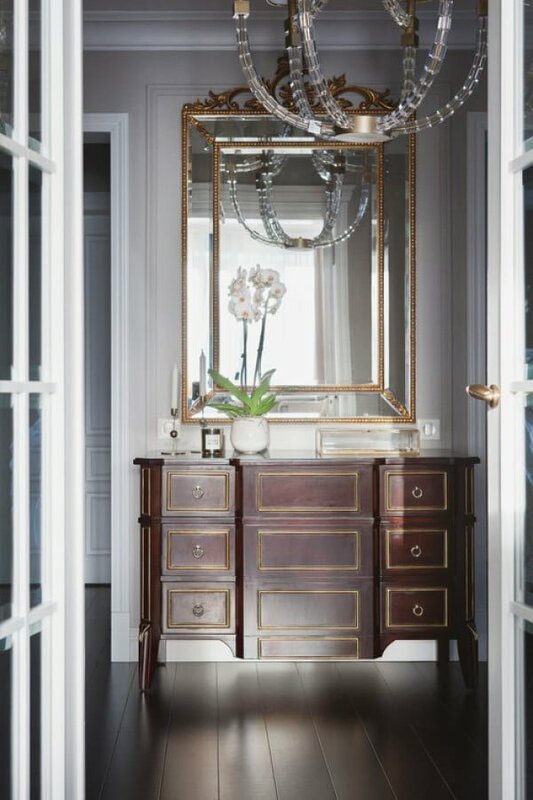 A sensible eye for details, focusing on an ivory floor entrance, a staggering gold mirror and a great play of wood and metal bits. A modern take on rustic elements, such as the white hardwood hanger and metal storage boxes which reflect a Scandinavian vibe of the setting. 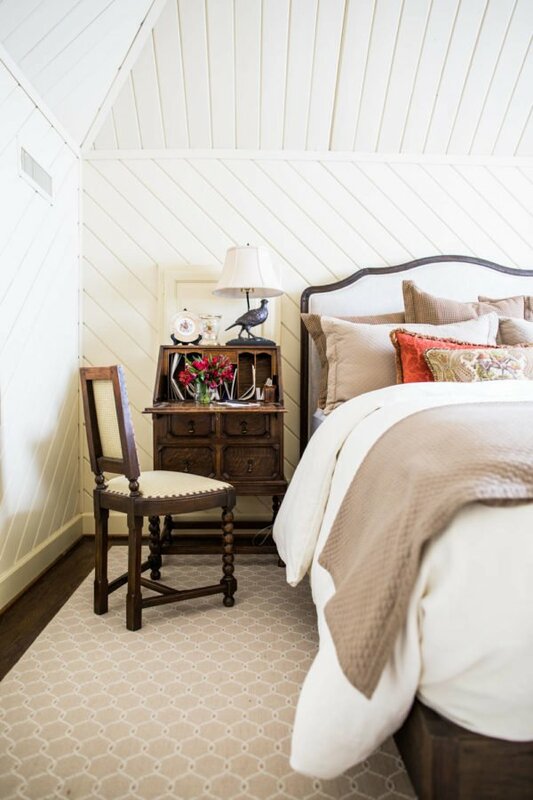 This perfect blend of a country-style nightstand and warm parquette flooring allows a playful blend of textures and designs, creating a fancy retro nook. The white walls and bits work amazingly with the contemporary night lamp, the soft wooden fruit bowl, and funky flower pots. The brown hardwood floors bring warmness to the setting, while the mustard-yellow walls and classic staircase brings a sense of pleasant nostalgia. 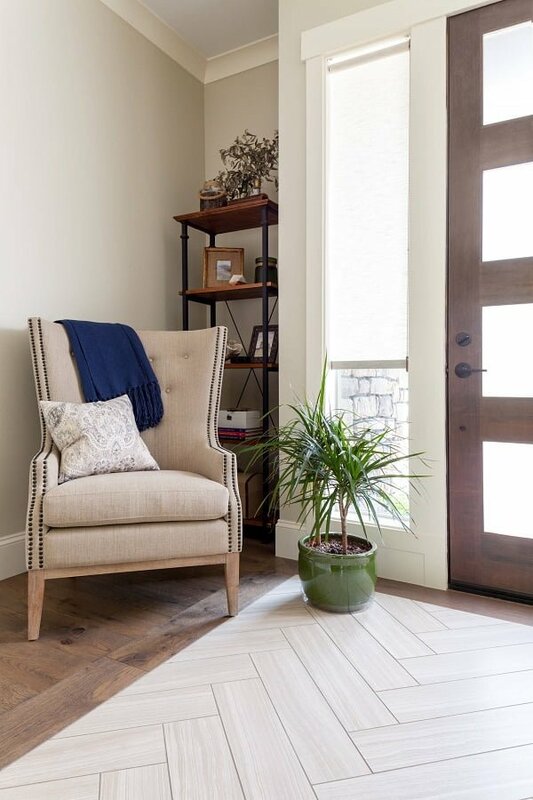 The zig-zag wood flooring is a great addition to the luxurious blush armchair and bottom-to-top window frame. Simply extravagant! 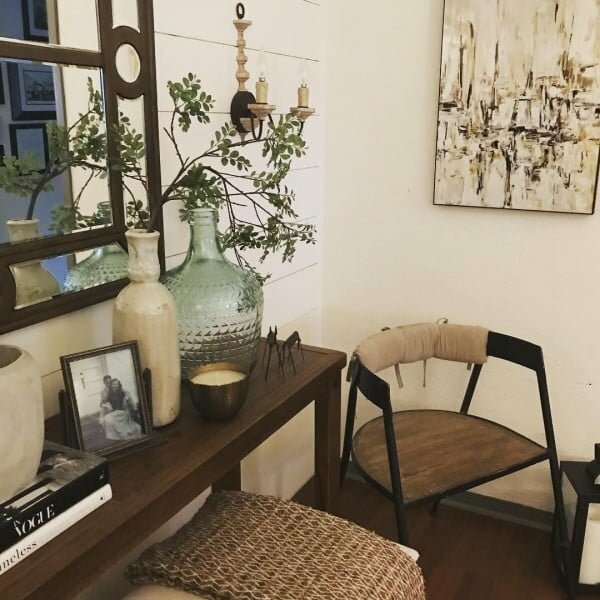 This home decor idea is exploding with contrasts, from the majestic wall painting, to the crafted chair, leather sofa and the artistic wood table. Delightful! Let the music do the talking! The grand harpsichord controls the light feel of the room, and is enhanced by witty wall signs and a fluffy chair mat. 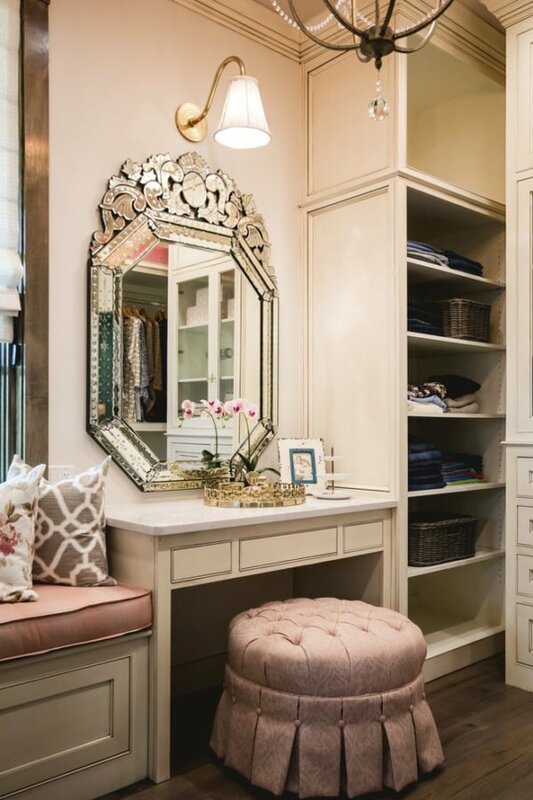 The collage of pink details, such as the round ottoman and secluded cabinet shelves, give an impressive take on a Rennaisance setting. 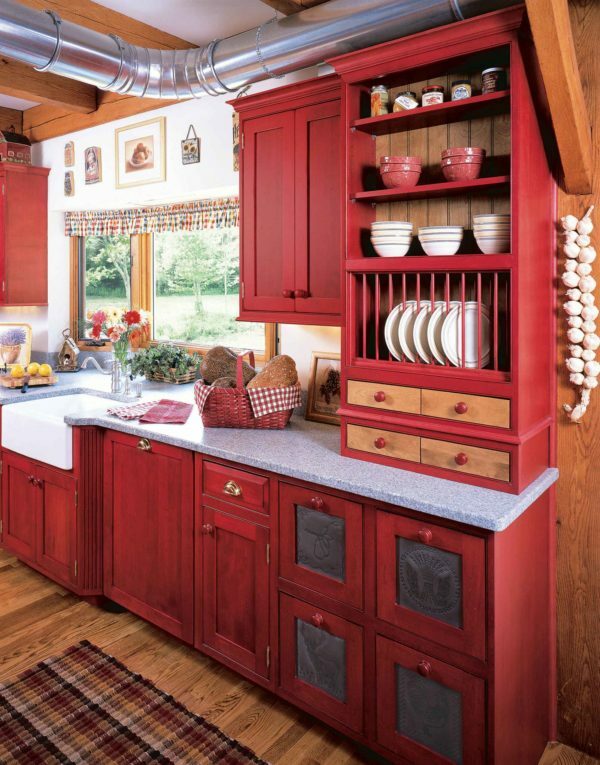 Wooden red kitchen cabinets go hand in hand with the impressive wooden floor and broad outside windows. 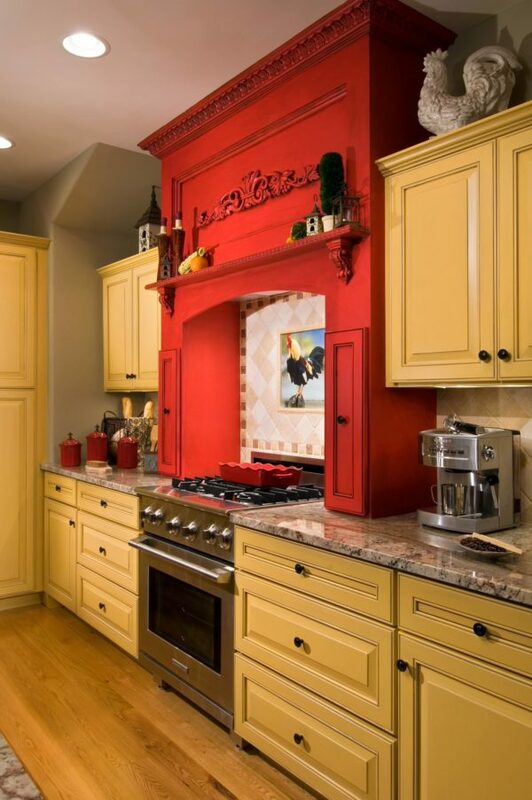 The gentle yellow cabinet tones are intensified by the spectacular red over-the-stove piece, revealing practically used storage space and strategically placed decor shelves. This modern decor focuses on the chess-inspired carpet, soft metal chair set, and impactful vase-like bottles. Creativity at its peak! The imposing wall clock pairs marvelously with the iron chandelier and modern feasting table set. Extravagant! 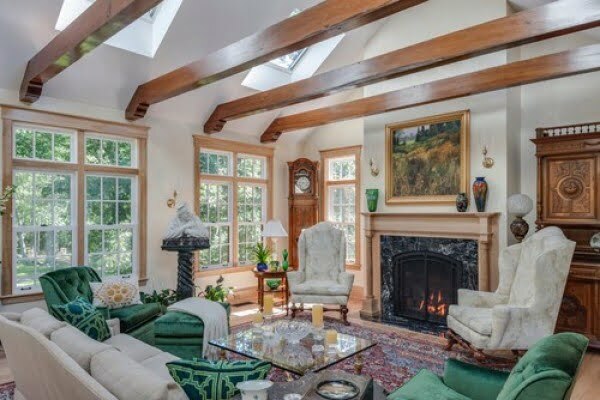 With sky-high ceilings and expanded staircase, this room uses multiple massive windows and glass entrance door. 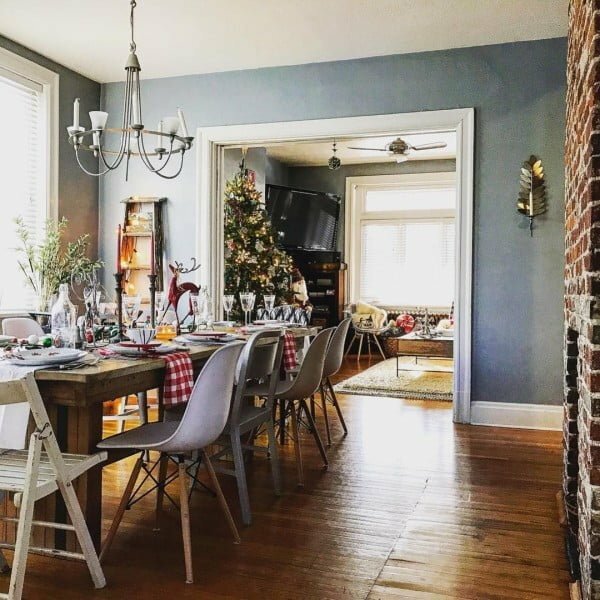 A dated table set is transformed into a rustic attention-grabber, macthed with halfway brick wall and yesteryear iron chandelier. Talk about space! 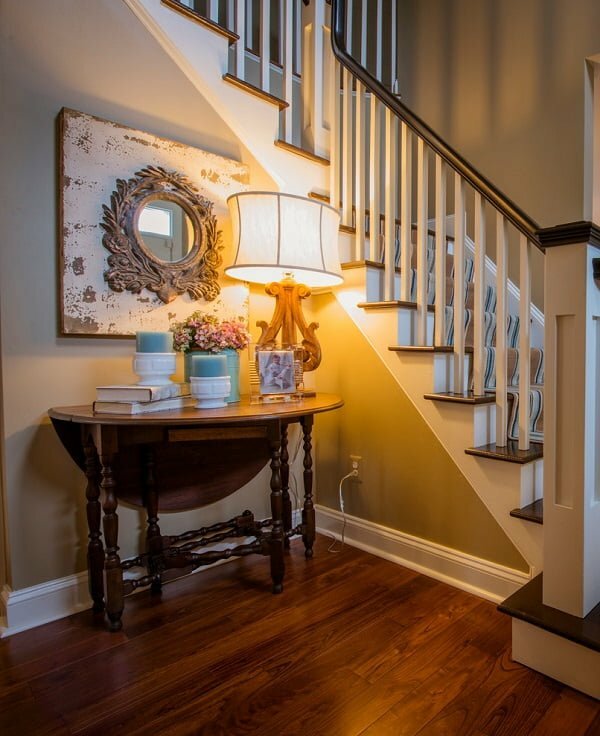 This setting uses traditional and warm decor details such as classic stairs, long foyer carpet, and cozy sitting nook. 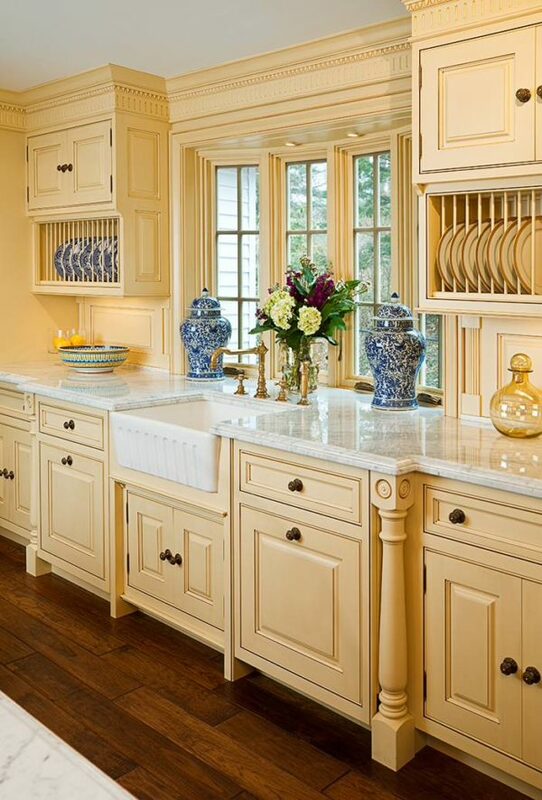 The soft yellow cabinets set pairs amazingly with the marble countertops and multi-functional rounded windows. Awe-worthy! This contemporary space is comprised of silver-blue garden chairs and a dollhouse inspired table, and a frizzy central lighting. 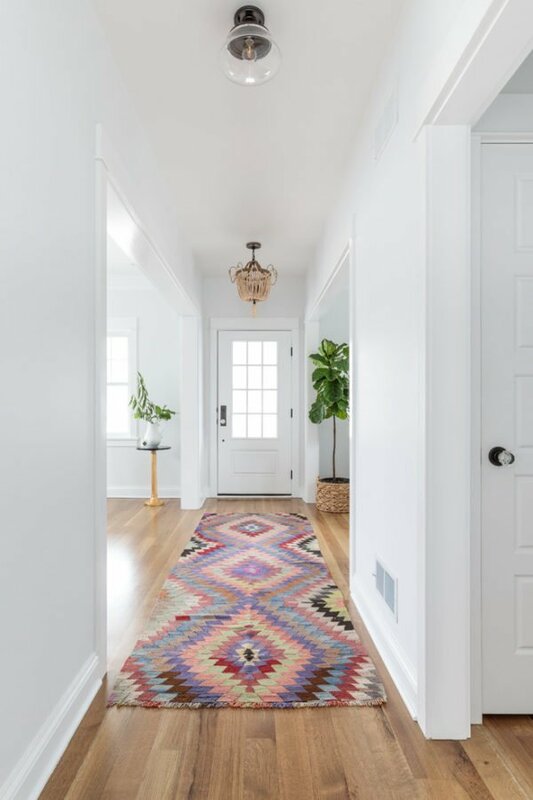 The colorful and utopic rug accentuates the soft wooden floors, long hallways of the room as well as the clever little details, like the green plants and golden chandelier! 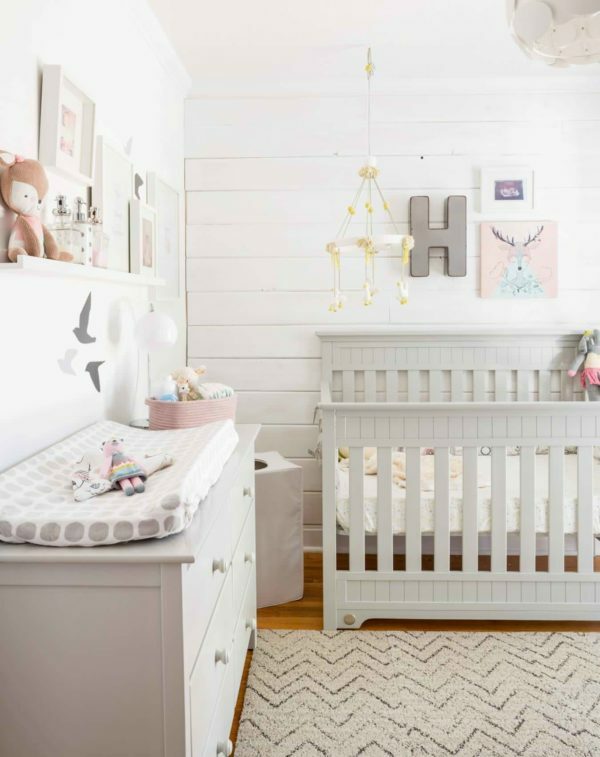 With white plank walls, an adorable baby crib, and a whimsical set of wall signs, this farmhouse baby room screams nothing but thoughtful decor. The design of this room explodes with bold colors, strong wood patterns, and an imposing framed chandelier, hanging over the elegant marble table. 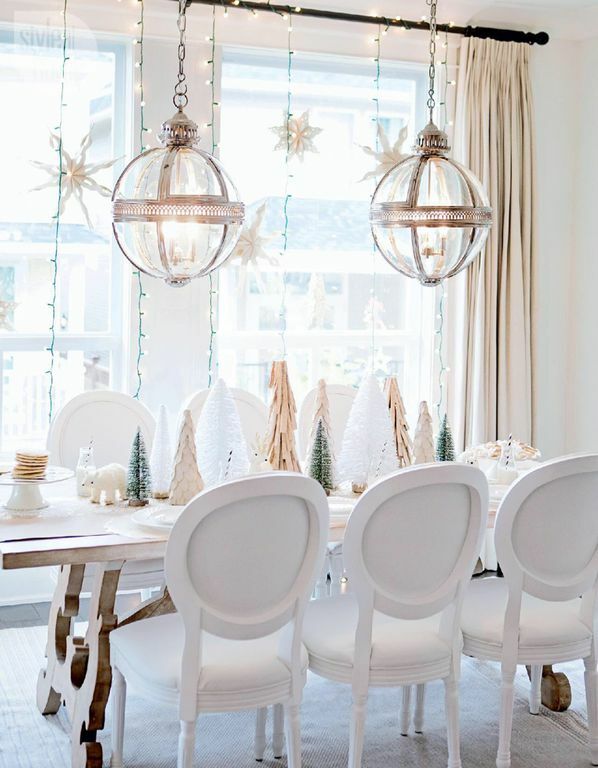 A contemporary vibe based on simple white, gold and silver furnishing details and decor details to introduce a light and festive atmosphere, without overcrowding the space. The magnificent room focuses on large wood table, tin retro chairs and spacious sitting area, and kitchen-adjusted drawer stand. An almost flat-like vibe, the farmhouse has multiple bookshelf cabinets and an en-suite living room, connected to the bright and packed kitchen. 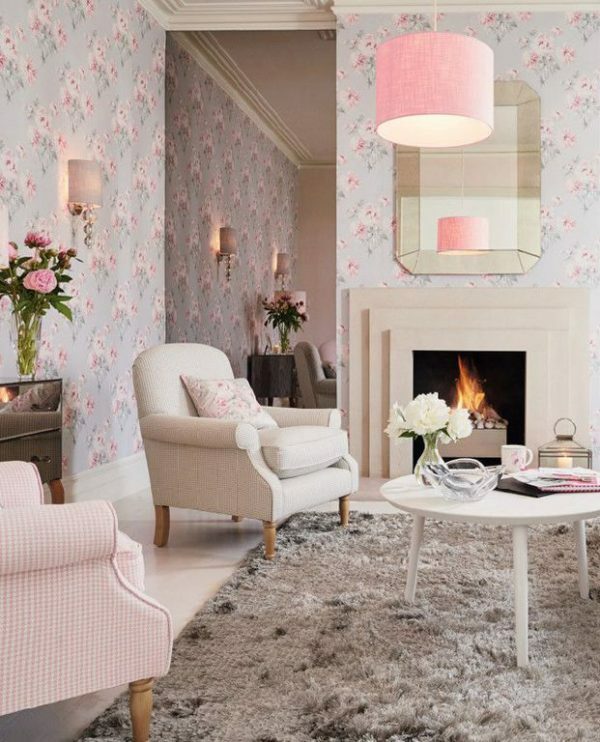 The romantic wallpapers and cottage-inspired carpet offer warmth to the room, enhanced by a pink chandelier and 3D fireplace frame. The under-window bench is both intimate and open, while the baby blue walls highlight the white round ceiling lamp and animalistic wall motives. 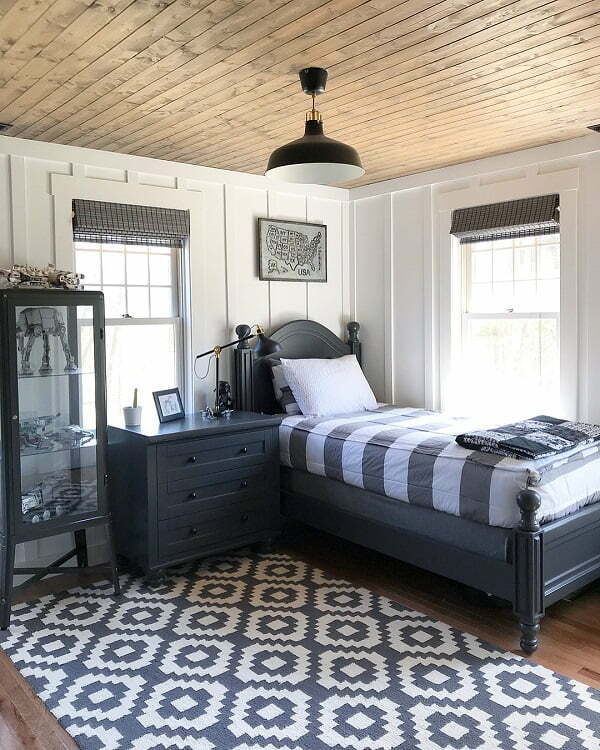 This farmhouse kid’s room is defined by the fancy white desk cabinets, the modernistic wall shelf box, and the playful photo string collage. 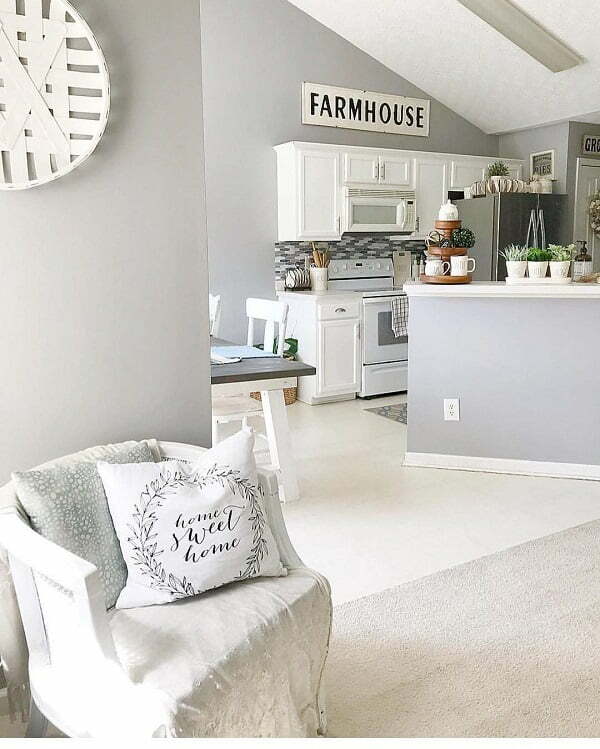 This farmhouse nest uses a white panel wall, a selection of retro quote frames and lab-like bottles to create a familiar and nostalgic setting. 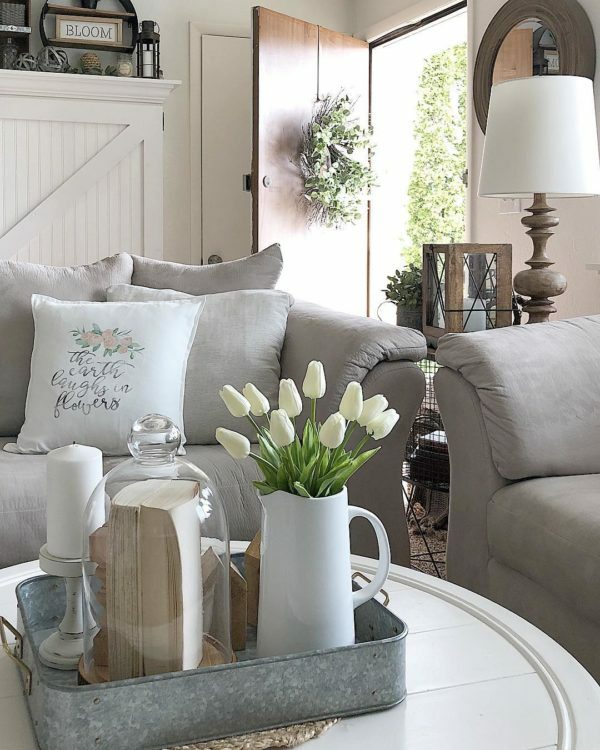 The classic greyish living room set works well with the barn-like closet and a round white coffee table, introducing a summer-craving vibe. The empty wood frames wall collage is the centerpiece of this setting, accompanied by a set of retro bar stools and a delicate floral arrangement. This corner space is enhanced with an open retro shelf cabinet, an iron wall cup hanger and a staggering decorative vases for storage. 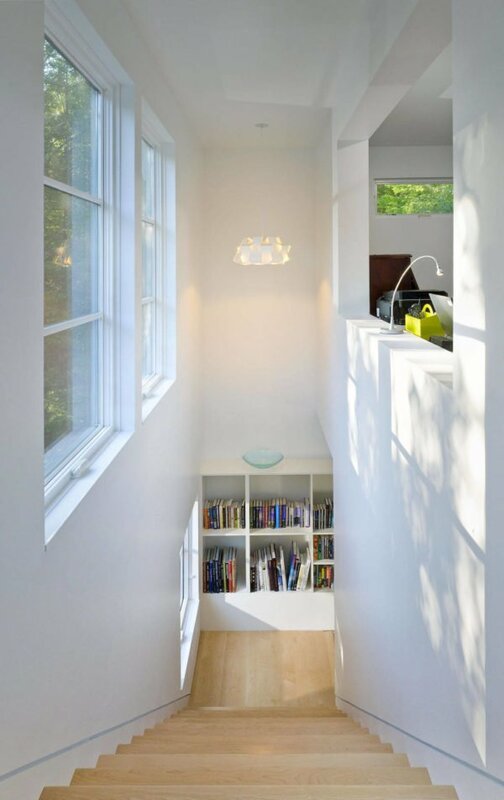 The internal window of this nook opens up plenty of space. At the same time, the adorable wreath and miniature quote signs deliver nothing short of freshness and cheer. The hand mirror wall collage introduces fairytale-like vibes into the room, supported by a single hanging wood cabinet and marble countertop. 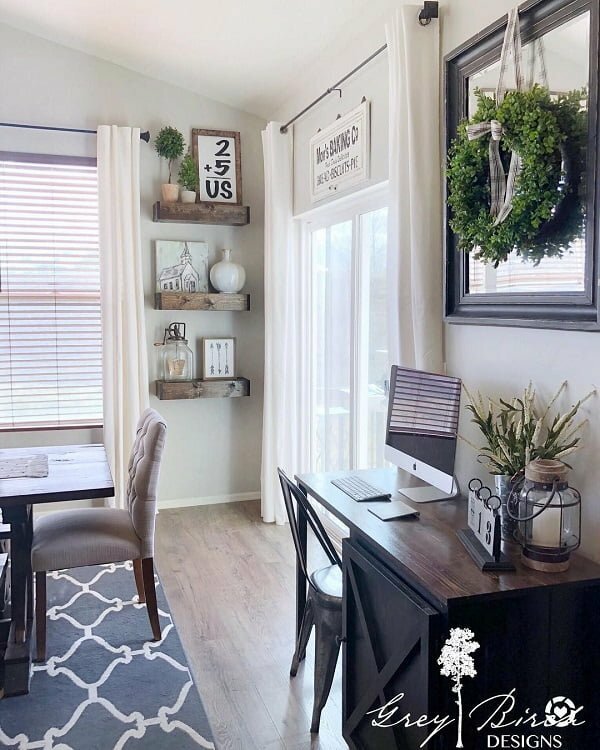 The plain white wall is a perfect platform for creating a collage made of wood photo frames, classroom signs, and an unusual hanging floral arrangement. The blue pillows depict a summer-like vibe in th room, amplified with a middle-aged coffee table and fizzy ivory carpet. 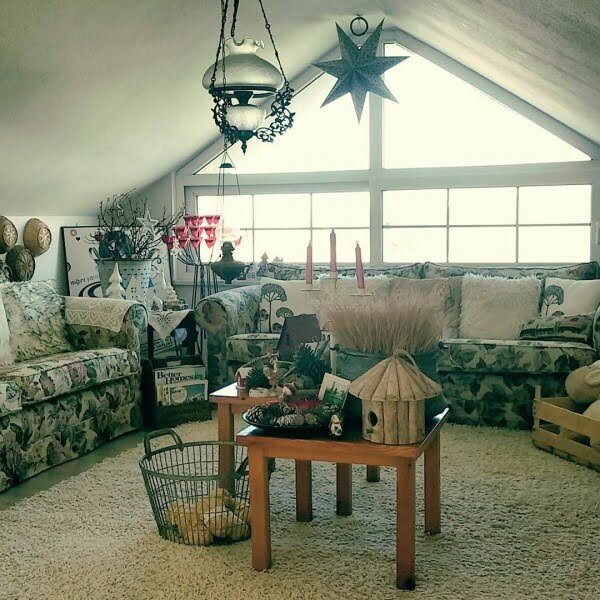 A comfortable area composed of unconventional decor details, such as vintage hanger clips, a handmade ‘fisherman’s’ chair and seaside star maps and engravings. 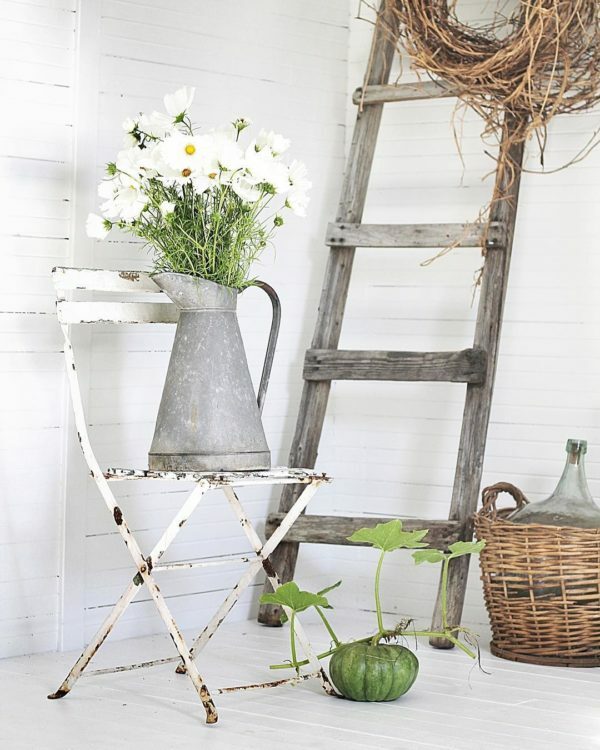 The rustic tin flower vase set on top of a vintage metal chair plays incredibly well with the rustic wood ladder and bamboo storage basket. The single white cabinet extends into a wooden shelf set, strategically placed onto a light-producing white brick tile wall. Fanciness overload! 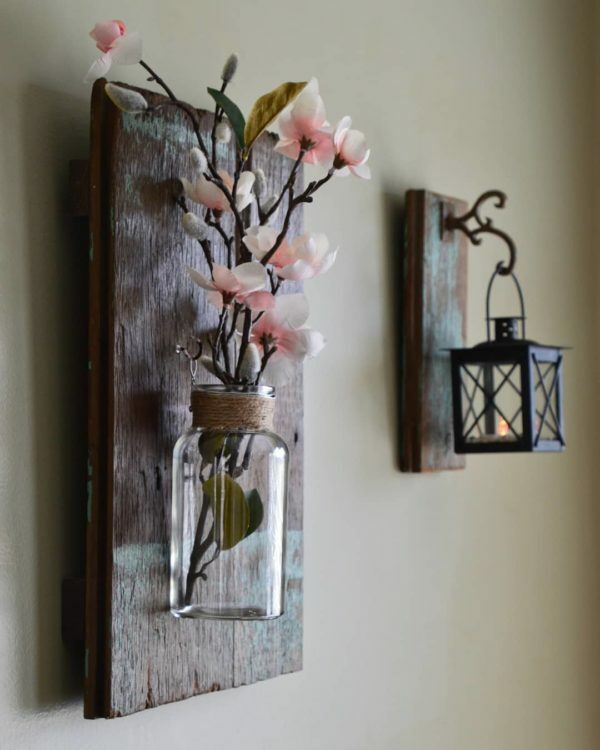 A pure example of how to cleverly transform an old barn door into vertical shelf planks, decorated with a rosebud mason jar and a rustic lantern. 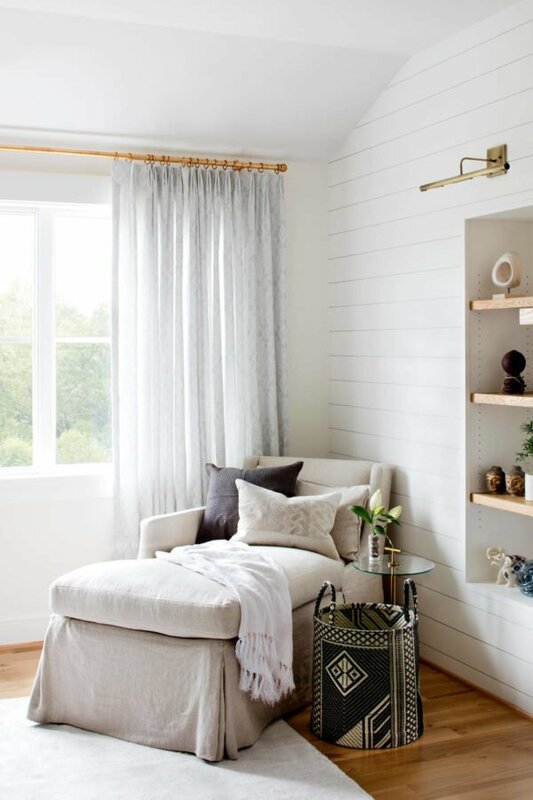 The practical hardwood shelf rack matches the remaining room elements, including the rustic wooden chair, and patterned pillow-like sitting mat. 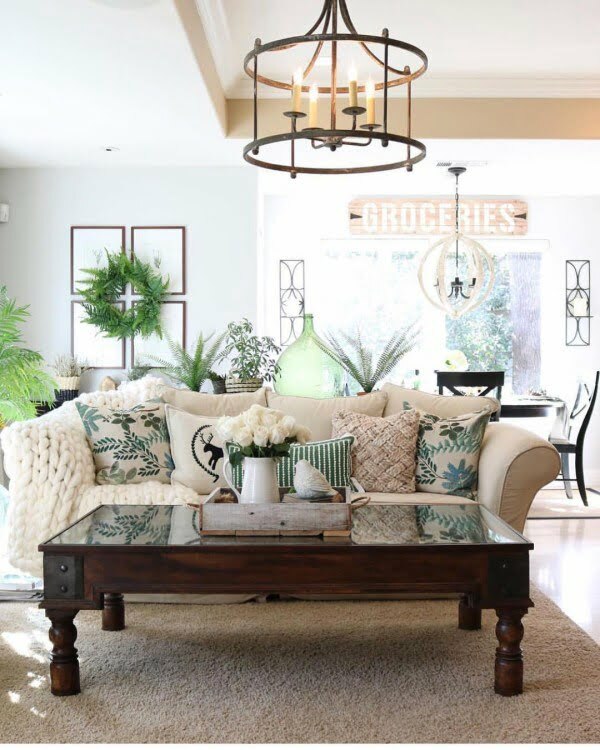 When it comes to bringing the modern farmhouse vibe into your space, some simple decor ideas and accent pieces can help you achieve it simply and inexpensively. You don’t have to live in the country to have your own personal farmhouse. 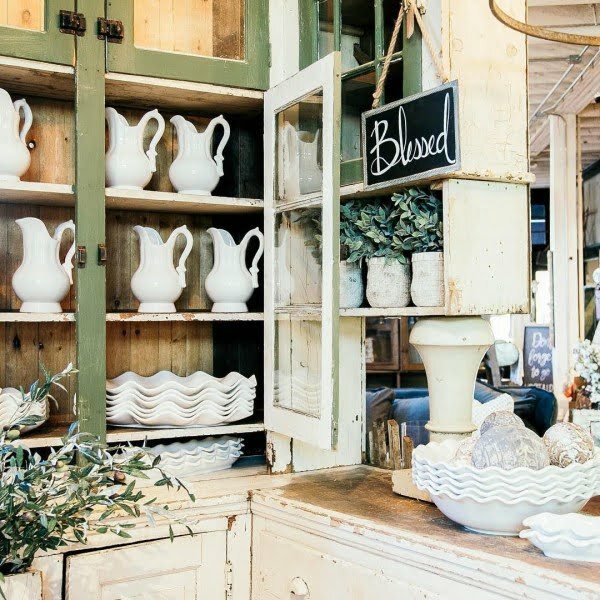 Some fun and unique updates to existing spaces or pieces can effectively breathe the farmhouse spirit into any space. 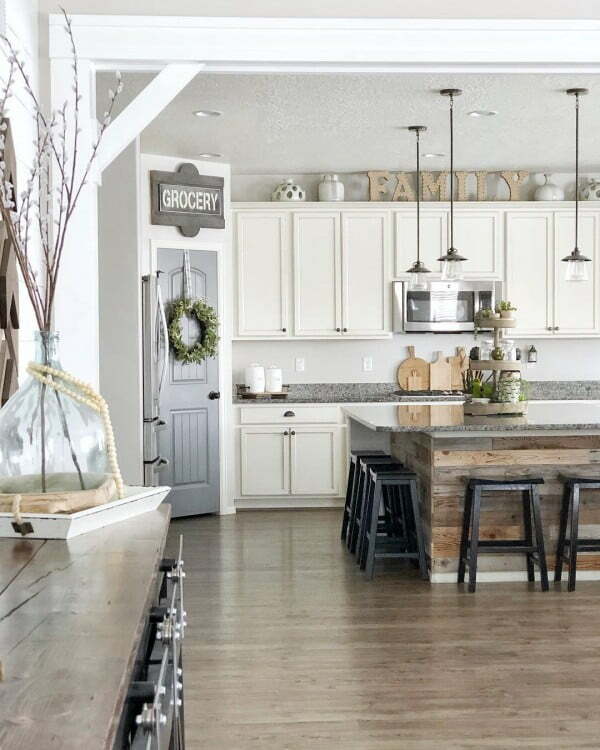 Enjoy these whopping 100 inspiration ideas for creating a modern farmhouse look and feel. 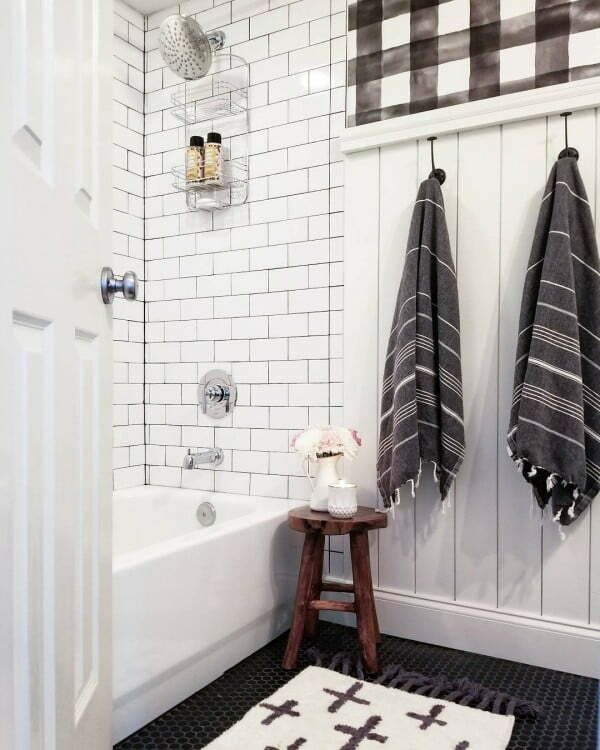 Adding white paneling to a bathroom adds instant character and visual interest to the space. For small washrooms, it can add an open and airy feel, in addition to charm and warmth. 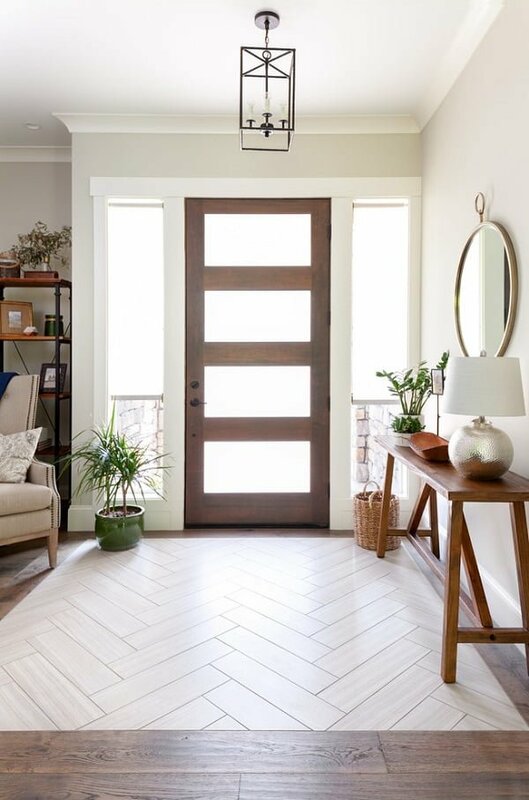 Cultivating a farmhouse-style entryway really sets the tone for an entire home. 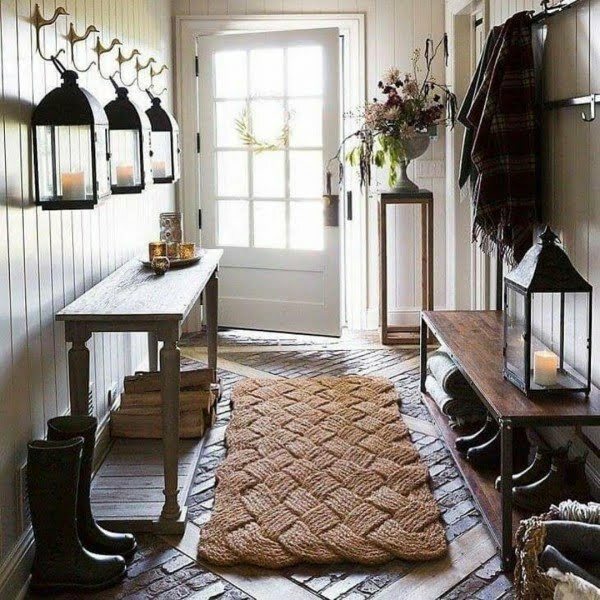 Adding a textural element like a large woven hallway rug is a great way to accomplish that layered look that speaks to the farmhouse vibe. White is the ultimate color when it comes to the modern farmhouse. It is clean, fresh and neutral. 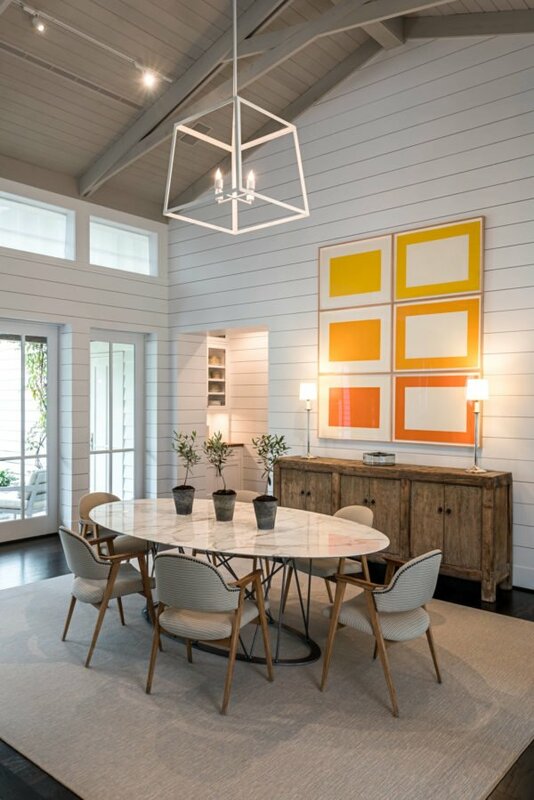 A dining room with white walls, and additional white accents, creates perfect flow and harmony. 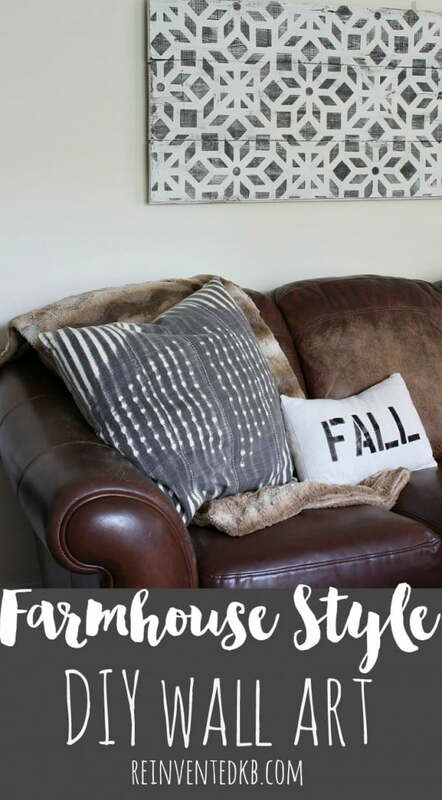 Adding multiple throw pillows to a sofa creates that homespun feel and layered look so characteristic of the country home. 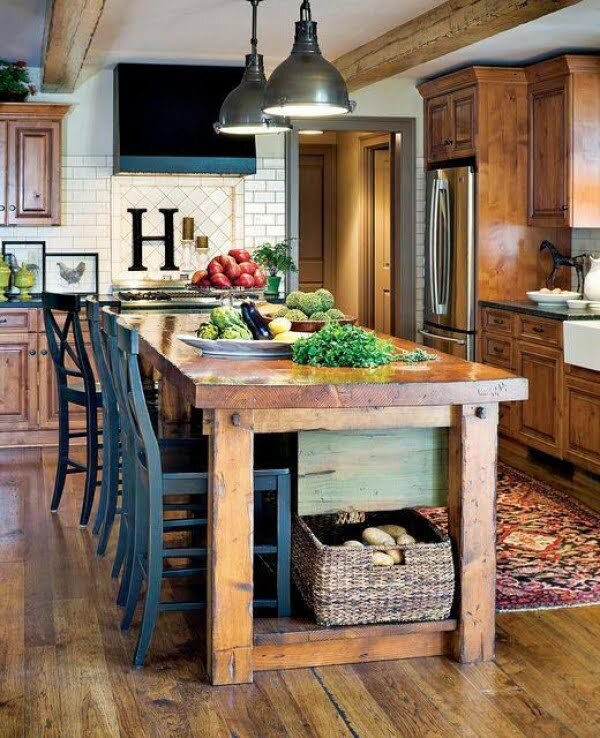 Adding a block-letter sign to a farmhouse kitchen adds a powerful graphic punch, while calling to mind country market signs. Wallpaper has enjoyed a comeback, and as it is a simple way to add a ton of character, it’s easy to understand why. Ideal for adding a feature wall, wallpaper lends the space depth and visual interest. 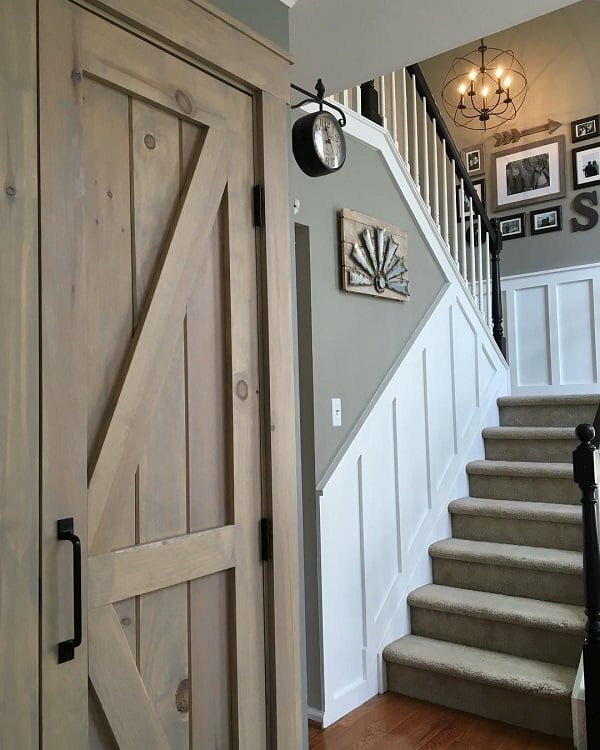 Few things scream farmhouse more than barn-style doors. 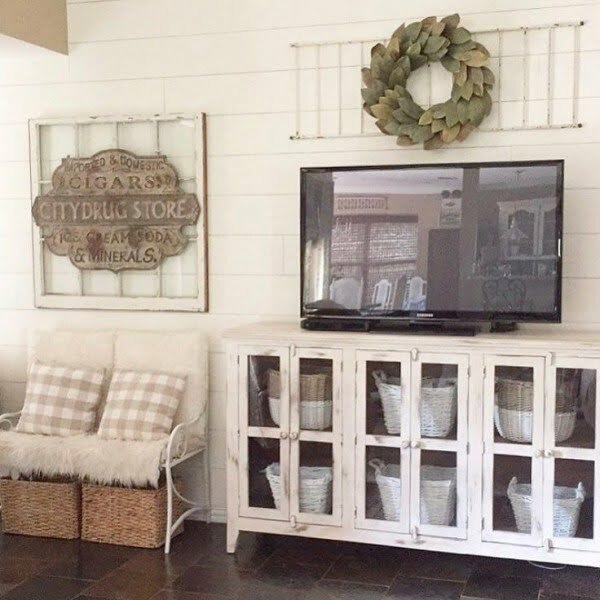 Adding sliding barn doors with the complementary hardware to a shelving unit instantly adds charm and functionality, as a TV or other storage can be hidden behind the doors when not in use. 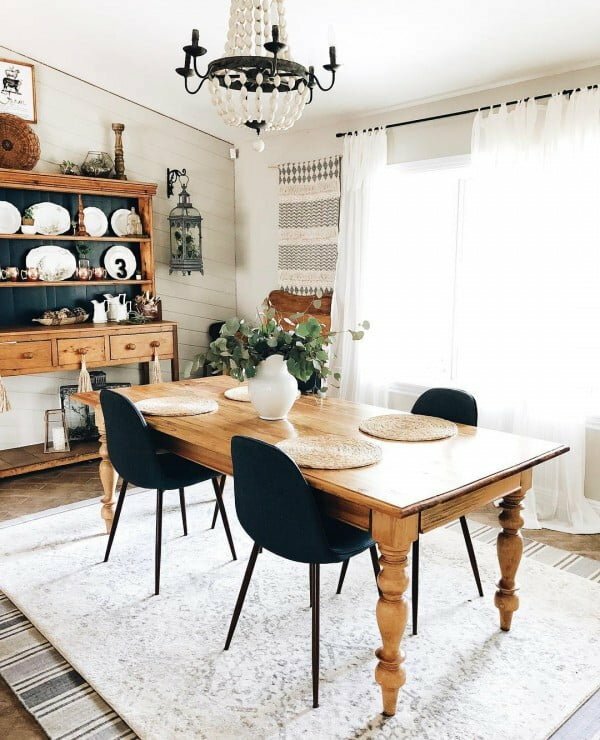 Adding even a single weathered-wood furniture piece to a space adds instant character and the homespun country feel, in a fun and inexpensive way. 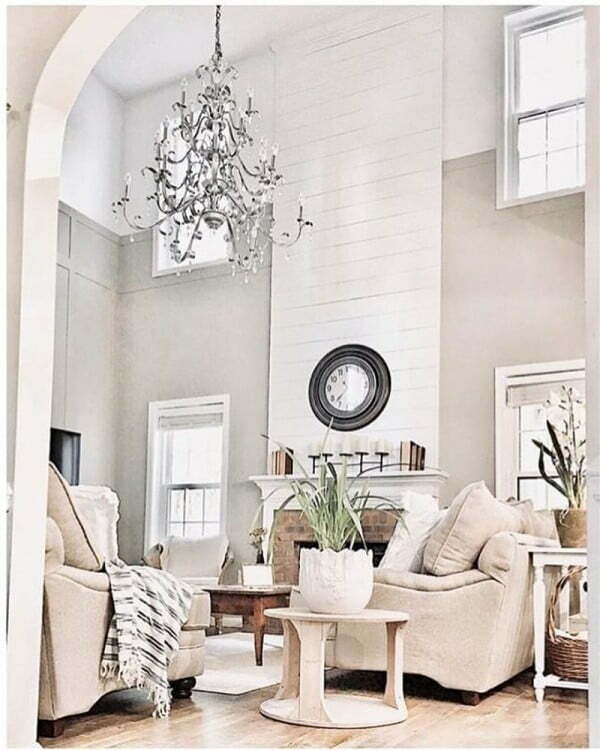 Characteristic of the modern farmhouse, pairing neutral paint tones like whites and greys is the perfect way to breathe some warm neutrality into a living room. 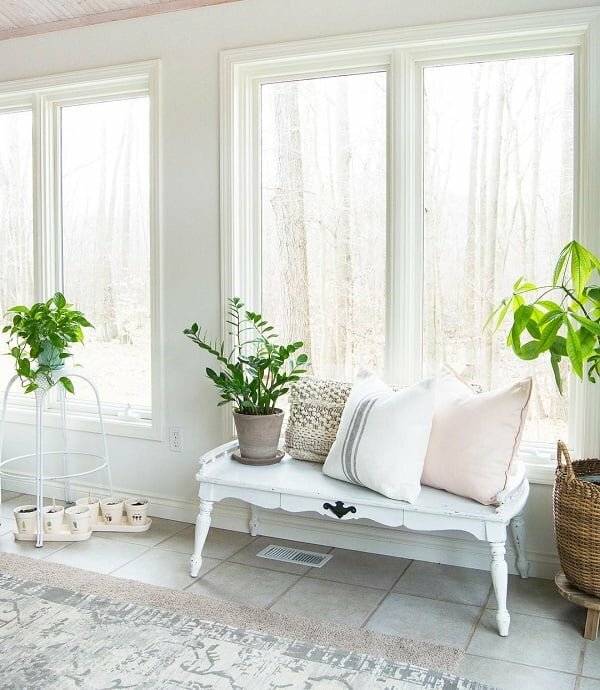 Adding a window bench is the ideal way to draw attention to the natural light and beauty of a window. It also provides the perfect local for a little light reading and tea drinking. 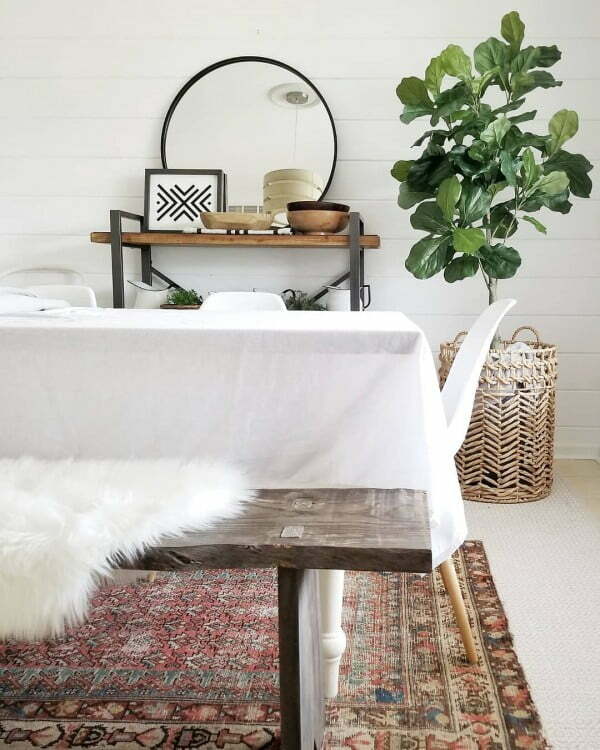 When it comes to a farmhouse dining room, a chunky leg table is a must. Even when paired with modern minimalist chairs, the farmhouse feel shines through. 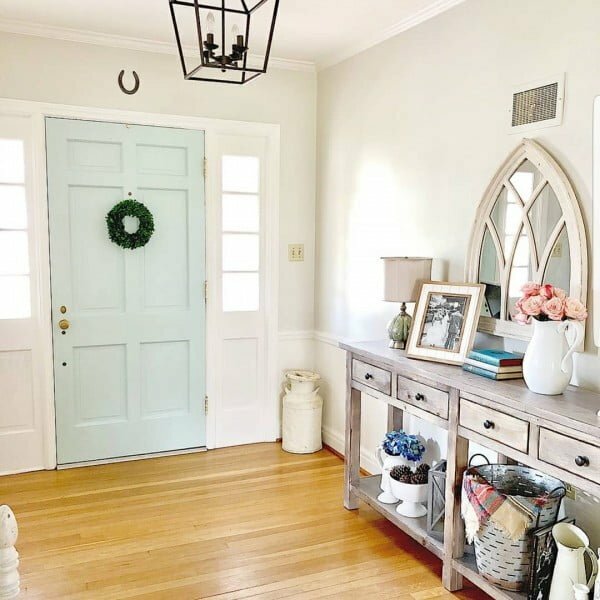 When it comes to replicating that feeling of farmhouse hospitality, adding an indoor wreath brings to mind those welcoming country home front doors. As the hearth is often thought of as the heart of a home, combining a brick and paneling surround creates an ideal feature wall around which furniture is arranged in a living room. 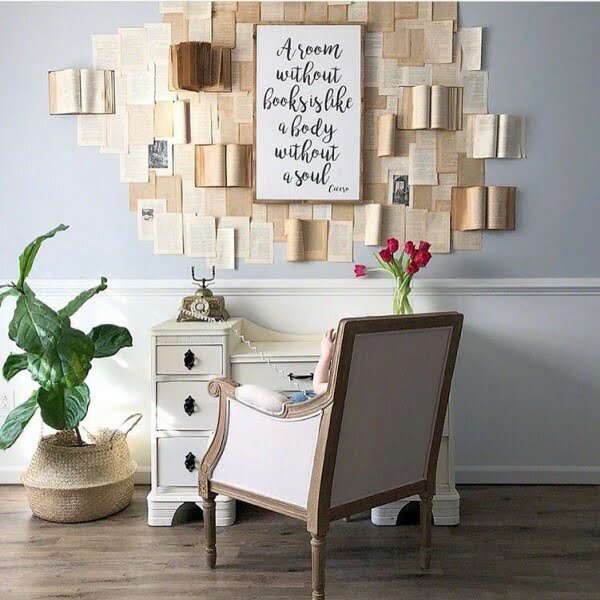 Adding some unique DIY wall art like a gallery book wall creates a one-of-a-kind feature wall in a space. Above a desk is the perfect place as it frames the space and creates a visual story. 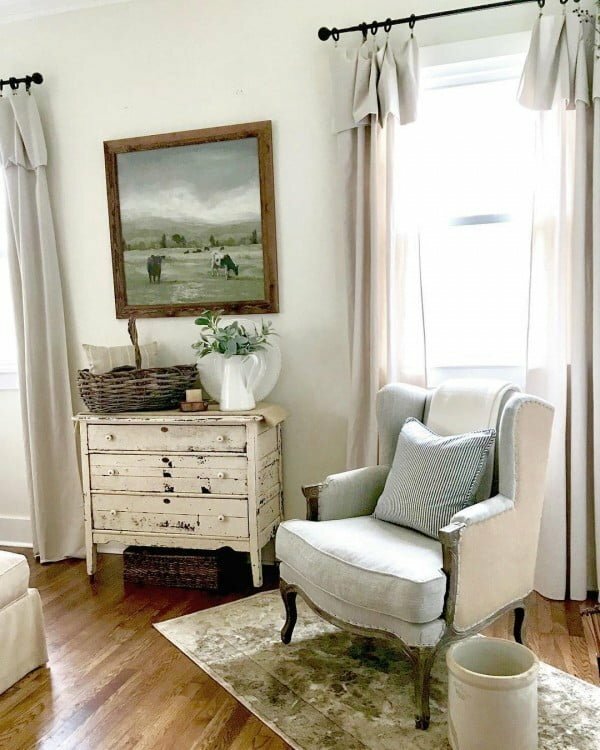 When it comes to breathing some farmhouse spirit into a space, few things will accomplish this more fluidly than adding some artwork depicting a rural scene. The bedroom is the perfect place to add some textural layers in the form of bedding, pillows, and a fluffy rug. 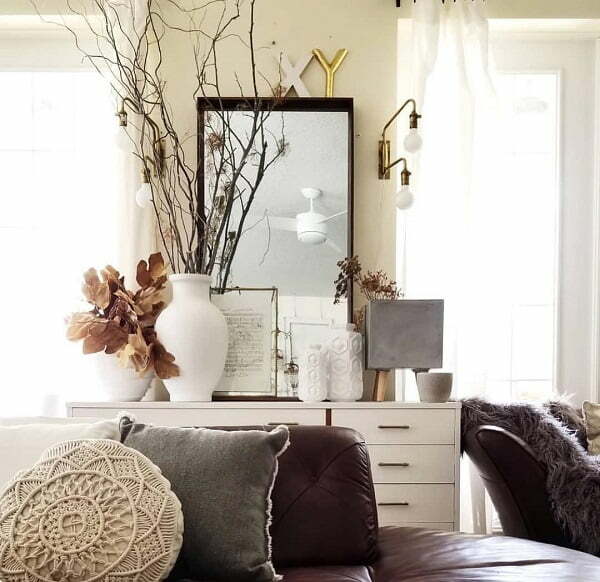 These elements work together to create an intimate and cozy space. 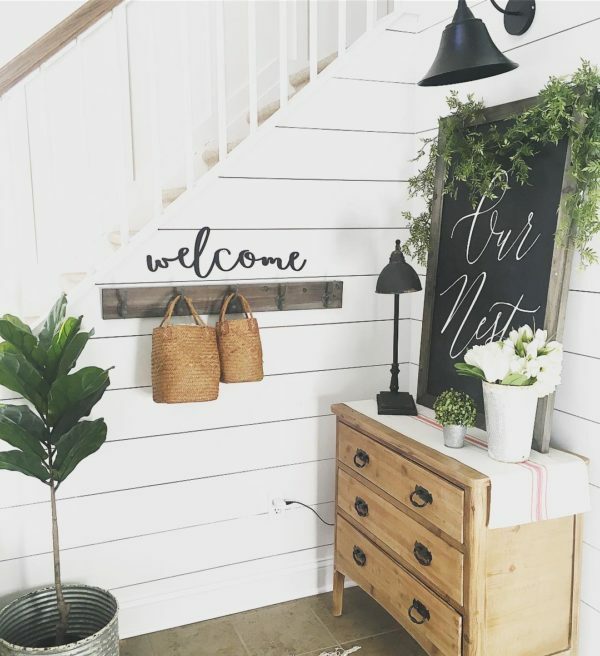 Creating a visual vignette in an entryway via an entryway table paired with farmhouse-style items like baskets, pine cones, and flowers provides a home with the ideal welcoming platform. Adding a geometric-patterned rug to a dining room helps demarcate the space, while providing a bold pattern for the eyes to feast on. 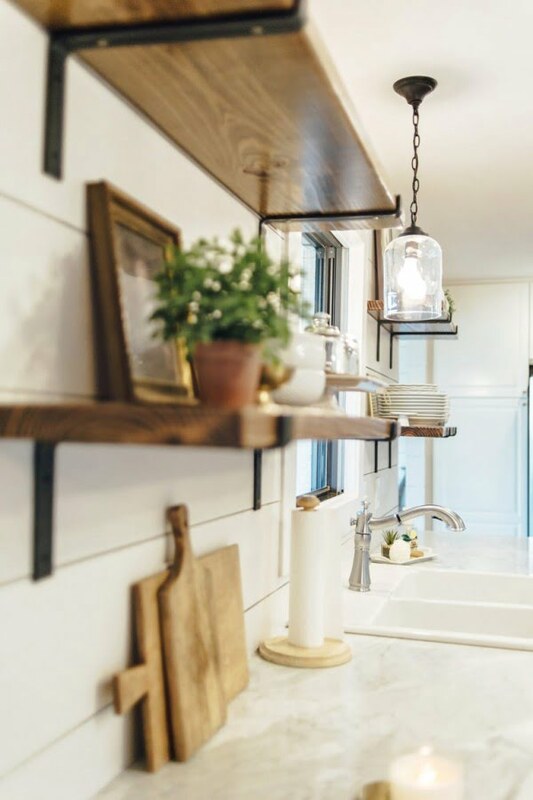 Adding some farmhouse-style hooks to a space is not only aesthetically pleasing, it also adds functionality and storage to a room. 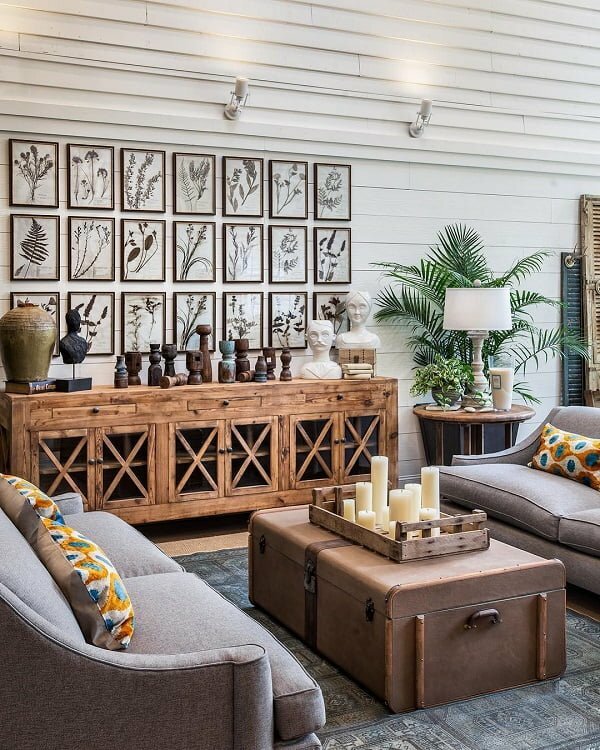 Rustic wood pieces and wall art in a space instantly warm it up with a dash of character and homespun appeal. 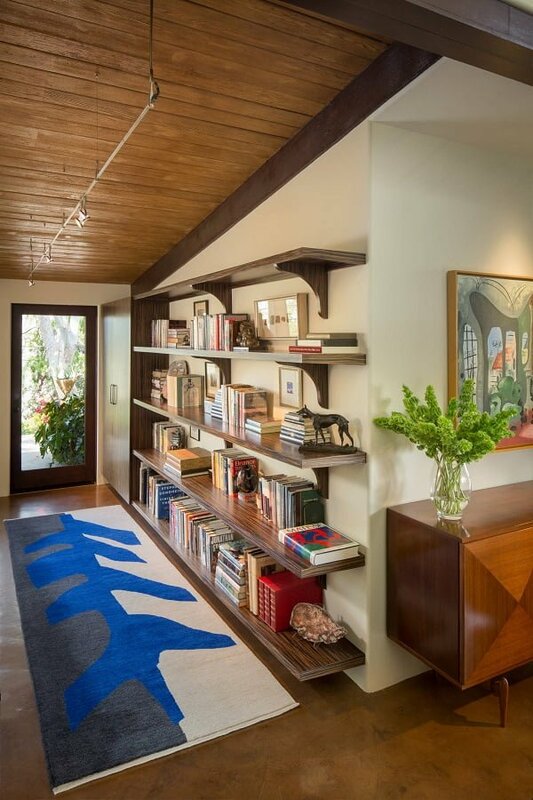 A traditional farmhouse can be enhanced with a wise set of decorative elements, such as the spectacular patterned blue rug and open wood bookshelf! 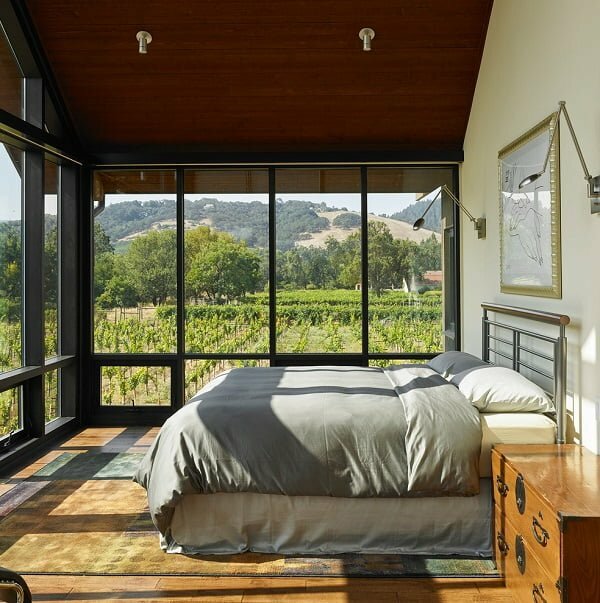 Get the best of both worlds and enjoy this elegant farmhouse using all-window walls and a metallic and comfortable bed! The bedroom focuses on plenty of modern details, such as the oriental and unusual ceiling lamp and the white and rounded chair. A fresh take on a modern-day bedroom, incorporating a multiangular metal-glass chandelier and dynamic set of patterned and fluffy bed pillows. 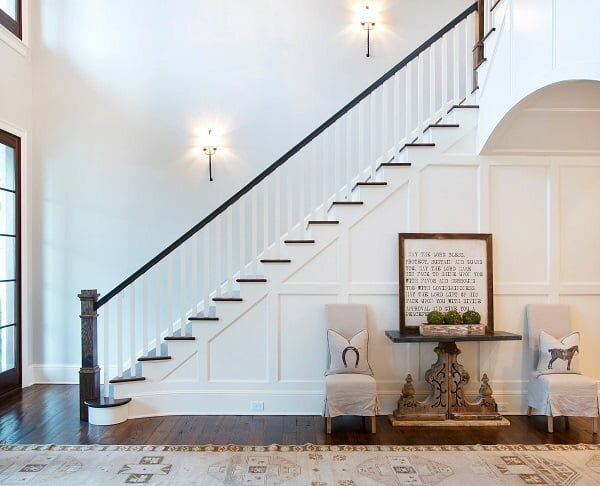 The sky-high angular white ceilings work marvelously with the fuzzy grey patterned carpet and the artistic statement walls, creating a modernistic farmhouse heaven. This fresh design is composed of a mix of elements, like the exhibition-inspired ivory walls and double minimalistic table arrangement. If you love bright and contemporary rooms, take inspiration from this setting, using a majestic set of second-floor windows and a minimalistic ceiling lamp! This modern surrounding focuses on bright yellow pillows and office-like chairs, and warm dark gray walls embellished by a collage of framed artwork. This fabulous living room takes modern office-inspired sitting arrangement as well as fancy in-built fireplace and staggering colorful wall paintings. 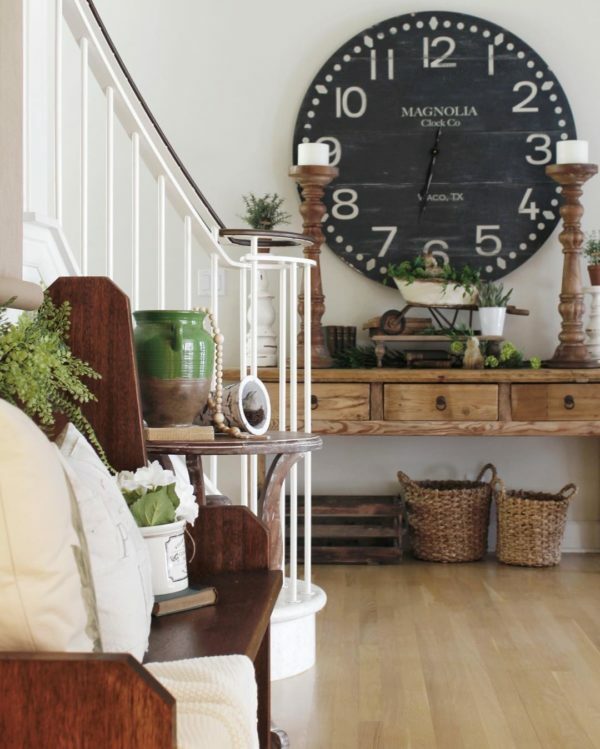 A very pleasant-looking hallway sitting nook, surrounded by a simple staircase, vintage medium wood drawer, and sensational black wall clock. This prodigy design is using a statement aquarelle painting made on a piece of wood, and beige and posh sitting elements. Finally, the greenery serves as a smart choice for color pop! The multiple black framed walls pair well with the triple-bed set and wood square entry-inspired bars. Finally, the metallic set of ceiling lamps provide a discrete but sufficient lighting. 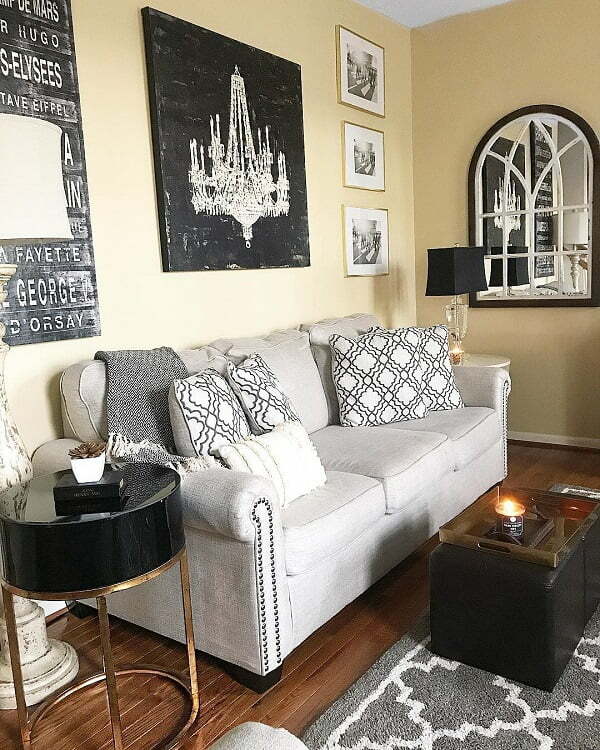 This chic and adorable space focuses on various materials and elements, such as the black leather sofa, metallic chair, and spectacular director’s light! The spacious living room lets the black leather set of chairs and white couch stand out hugely and work extremely well with the vertical and narrow brick fireplace! 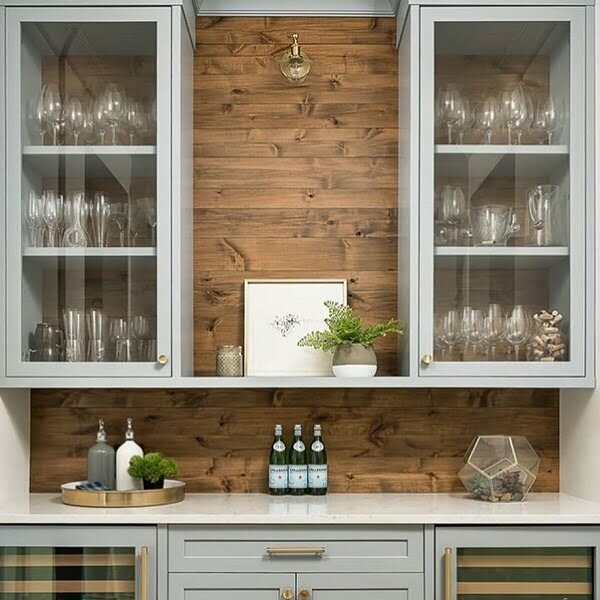 The bottom-to-top shelf wall makes the space work magnificently and incorporates elements such as the neutral beachy chairs and bottom shelf storage baskets well. This modern nook uses a convertible armchair and bed as well as ivory curtains and tribal black and white storage basket. 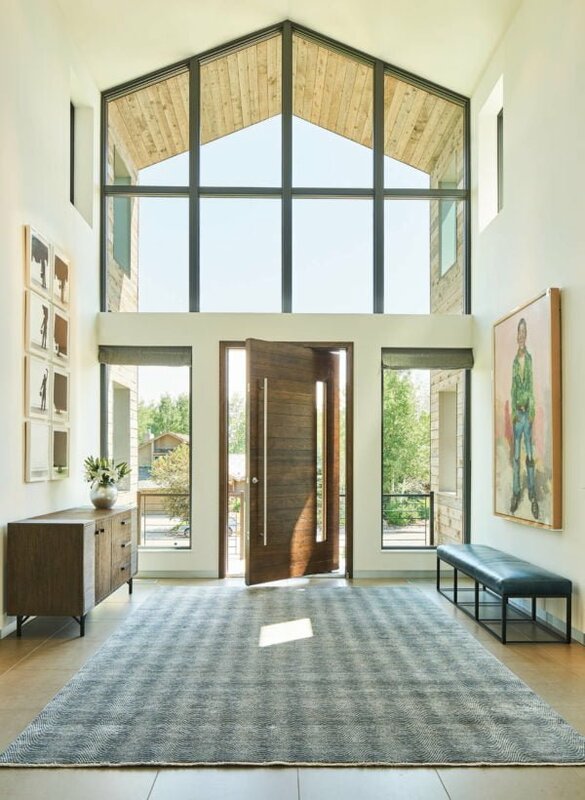 The sliding barn door connects two rooms into a similar ambient composed of contemporary LCD screen and half-open wooden ceilings. 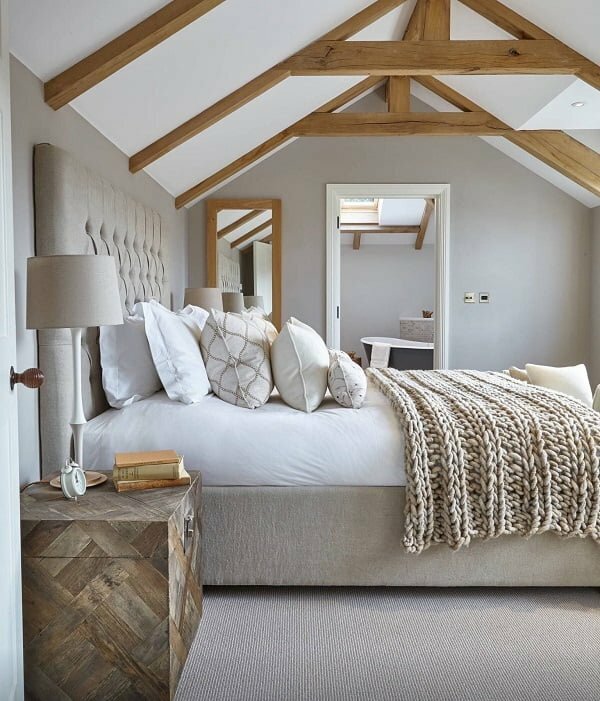 This alluring bedroom design incorporates many white bits, such as the wood walls, soft bedding and flat beige carpets. 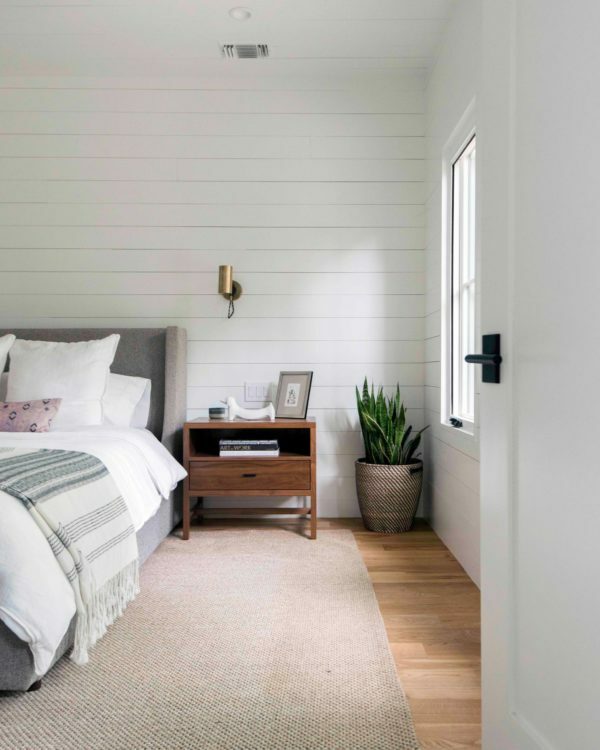 Creating a favorite house space is easy and apparently, all it takes is a parquet-printed chest nightstand, white and wood attic ceilings and a massive cream bed. 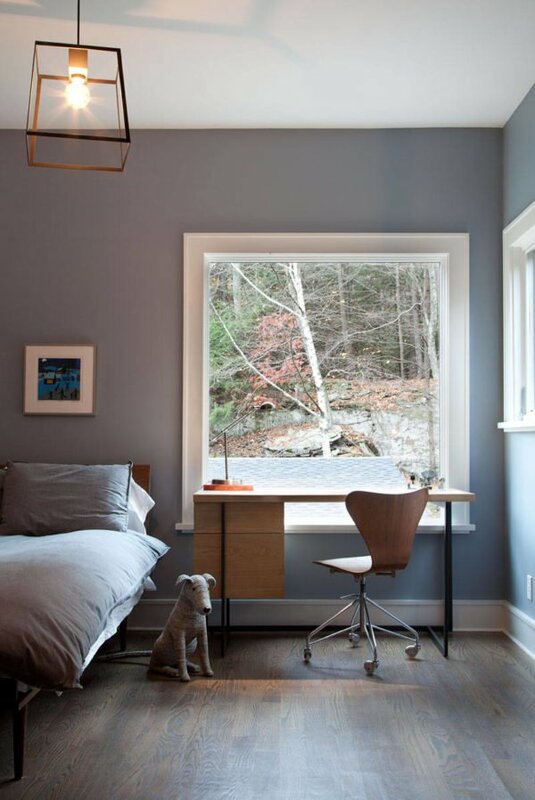 This contemporary, yet elegant corner emphasizes the window-armchair area perfectly while allowing the grey wood drawer set get the attention of its own. 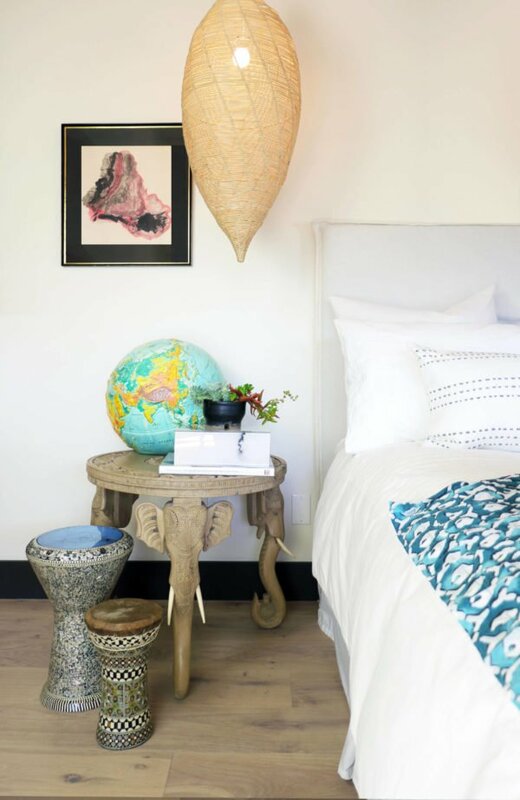 From the signature world globe piece to the elephant-sculpted nightstand and specks of blue bedding, this room screams modernism and authenticity all at once! 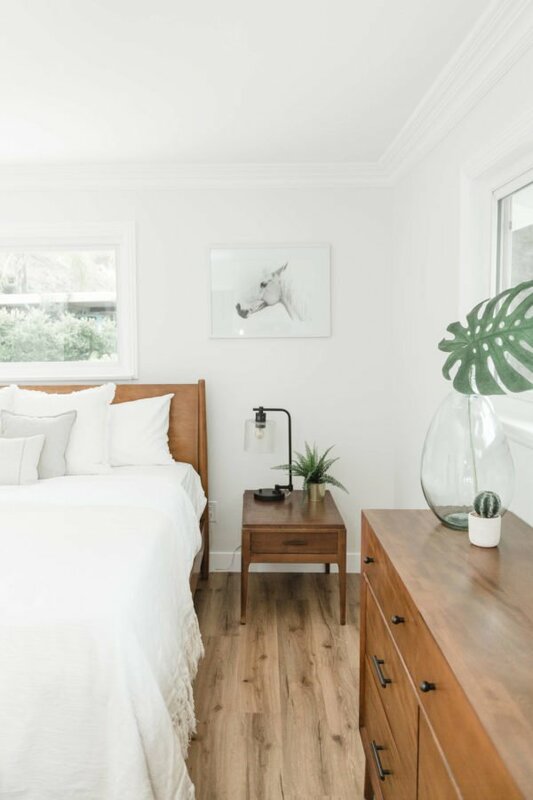 This hotel-inspired bedroom introduces smart and innovative all-white bedding and walls, trying to allow the tiny nightstand and fancy hardwood floors to grab all the attention. Who can resist the intelligent and wrecking ball-inspired chandelier that hangs just next to the blue-shaded ethno bed and royal nightstand? Extraordinary! 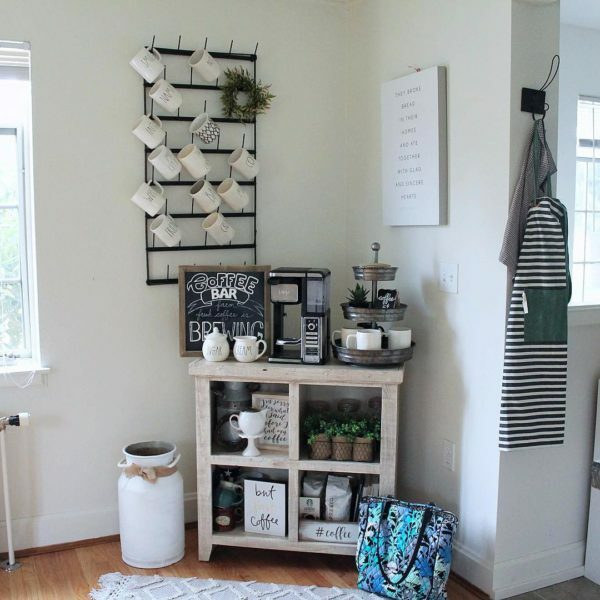 Take a look at this statement and handmade pottery plate wall! Aside from the inspiring colors reviving the room all over again, the retro yet office-like stand keeps the energy flowing! 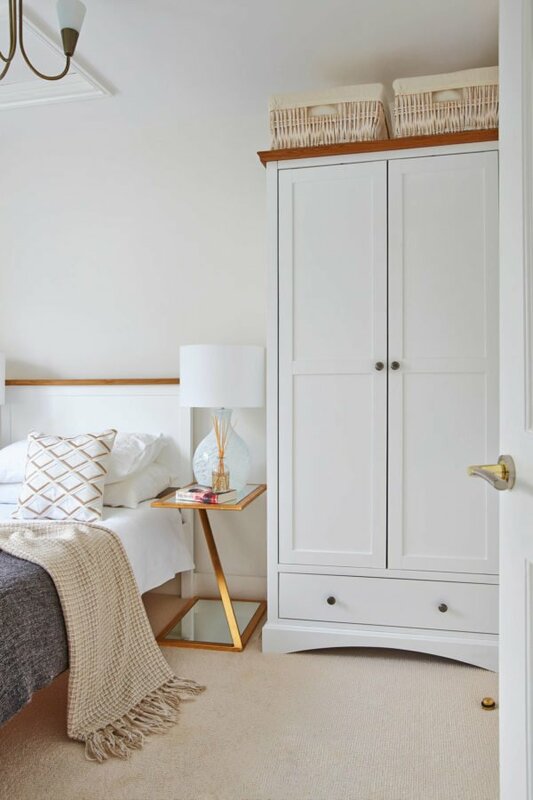 From the simplified white wood closet to the greyish bedding and futuristic wood-glass nightstand, this bedroom speaks only of clever design utopia! This fantastic space introduces light like there’s no tomorrow, letting the beams reach the freestanding coffee table and a window storage bench. The bright pattern of the fireplace itself allows more elements to fit in the ambient, including the turquoise armchair pillow and illuminating framed mirror. 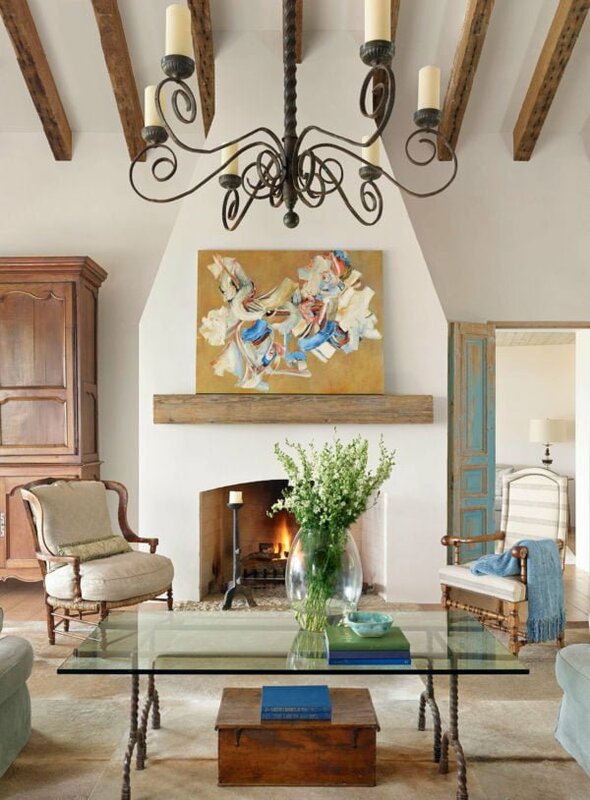 The modern artistic painting hanged above the hacienda-like fireplace matches well with the Victorian set of armchairs and bright aquamarine tones. The dropped attic ceiling is open enough to fit the majestic blush master bed and the delightful wood makeup desk corner. Although the bedroom uses mellow and navy tones to create a gloomy sleeping atmosphere, the iron silhouette ceiling lamps reveal a dynamic play of wood and flawless bedding. The soft pink walls of the bedroom, as well as the retro metal-framed bed, are enhanced by smart contemporary details. such as the metallic ceiling lamp and all-white nightstand and night lamp. As far as modern design concepts are concerned, the simplistic wood-metal bed and basket flower pot truly depict a contemporary and elegant feel. 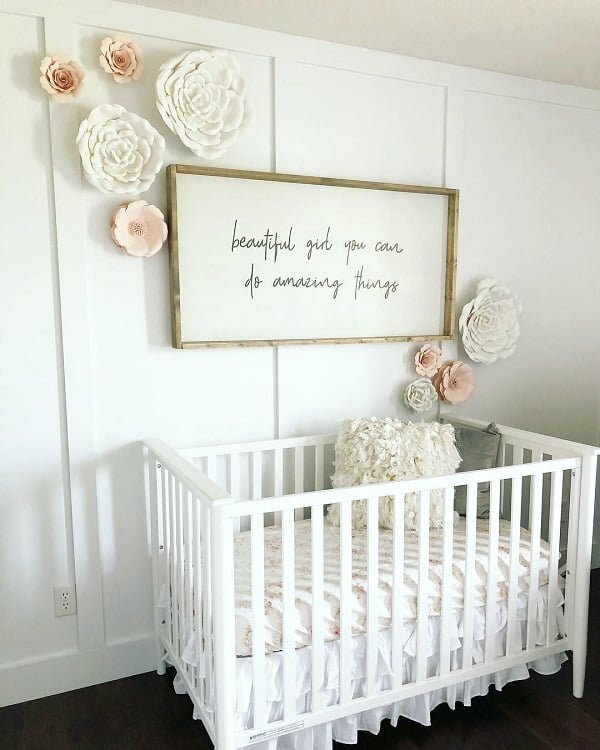 A modern baby room design, based on all-white walls, a simple white wooden baby crib and creative custom-made pastel floral wall bits. A simple wood stool accompanied by central artistic wall map give this setting a light and easy feel, strengthened by the dynamic patterned flower pot and vivid handmade rug. 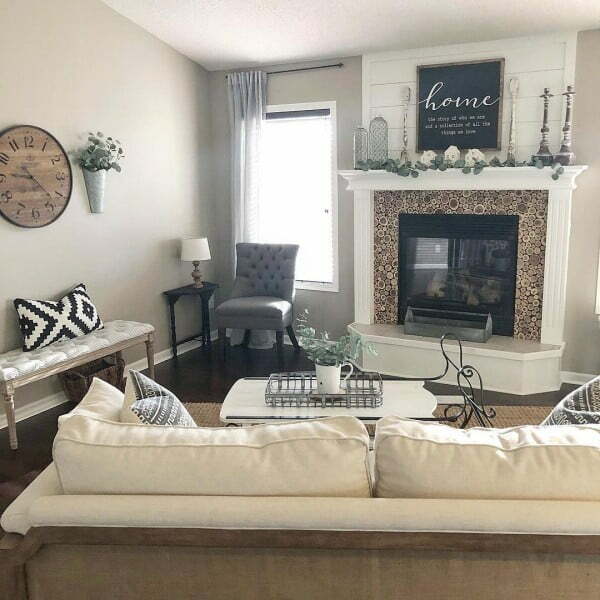 Everything from the massive wall clock and grey brick fireplace, to the modern white couch and wide window wall, give this room inevitable energy and soft presence! The authentic handmade drawer and the librarian collage wall create a meek and witty room vibe, emphasized with bamboo storage baskets and white walls. The low camel couch opens up space for the dark wood wall shelf to fit in just right, while the all-white walls and Avangard tall nightlamp introduces a serious sense of design. 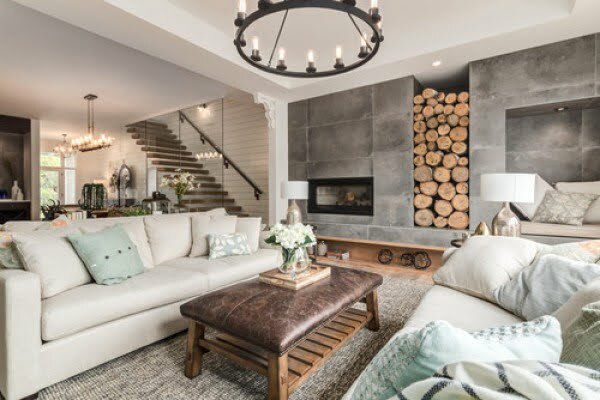 The pale blue armchair set is an ideal match for the custom-made stone fireplace and the freestanding innovative coffee table which elevates the room’s atmosphere. The white retro sitting bench is magntificently paired with the white wood hanger and shelf as well as the modernized set of pillows. 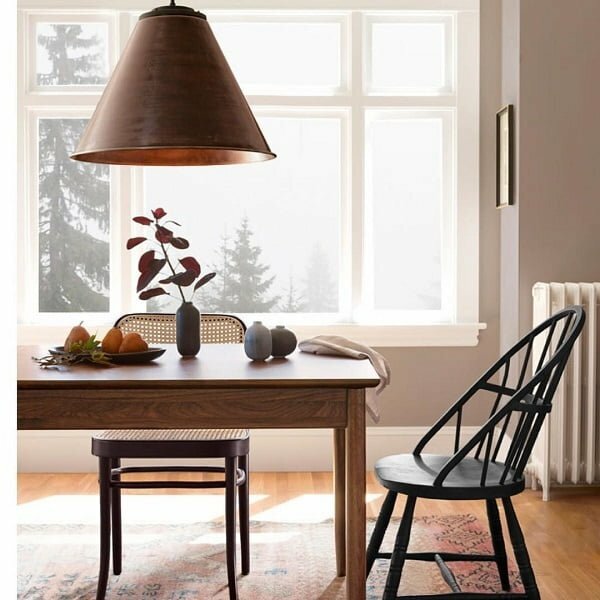 The low-hanging brass ceiling lamp works amazingly with the simple wood dining table, dynamic dark chair set and vast illuminating windows. 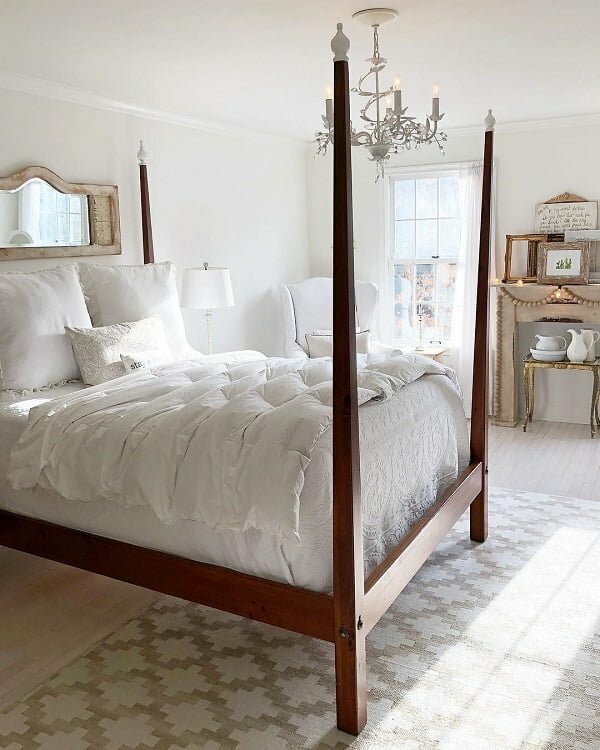 The incredible framed wood bed is a contrast to the otherwise white set of design elements, such as the enlighting above-bed mirror and gentle crystal chandelier. The magnificent set of couch pillows introduces dynamics into the room, while the statement wall clock opens up the space wonderfully. 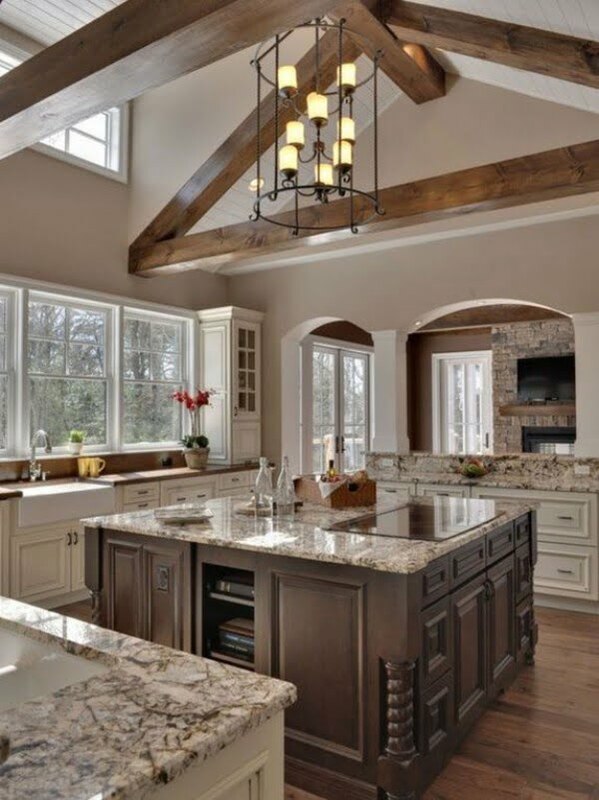 A divine kitchen design, using a tall white countertop, boosted by fancy brass hanging lamps and bar-inspired stools. The house relies on white open walls, a classic wall clock with a twist and sensational cup hanger which defines simplicity and elegance all at once. This room has a massive cream couch right at the center, emphasizing the open, no-door walls, vibrantly patterned carpet, and minimalist wood coffee table. 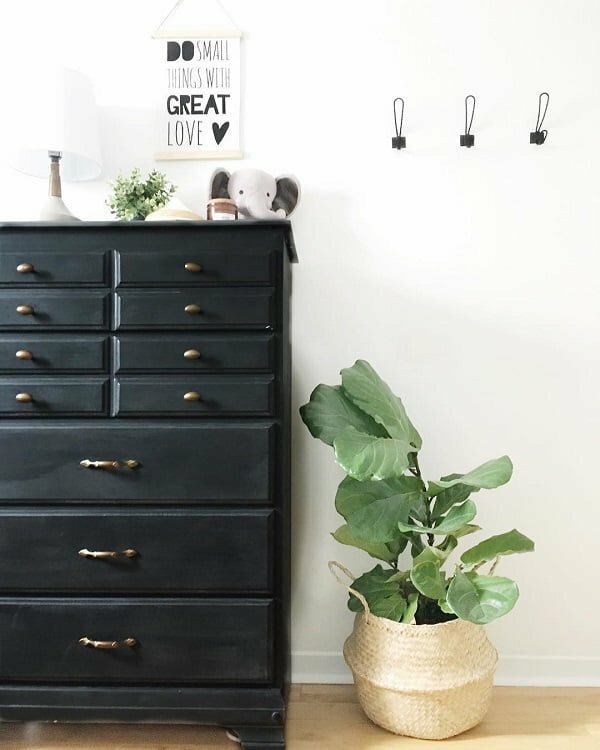 The black wood drawer is a mind-blowing aspect of the room and plays well with the all-white walls and simple metal wall hangers. Black and white done right! The low-placed round mirror reflects light and good vibes of the setting itself, allowing practicality through the handmade medium wood table. 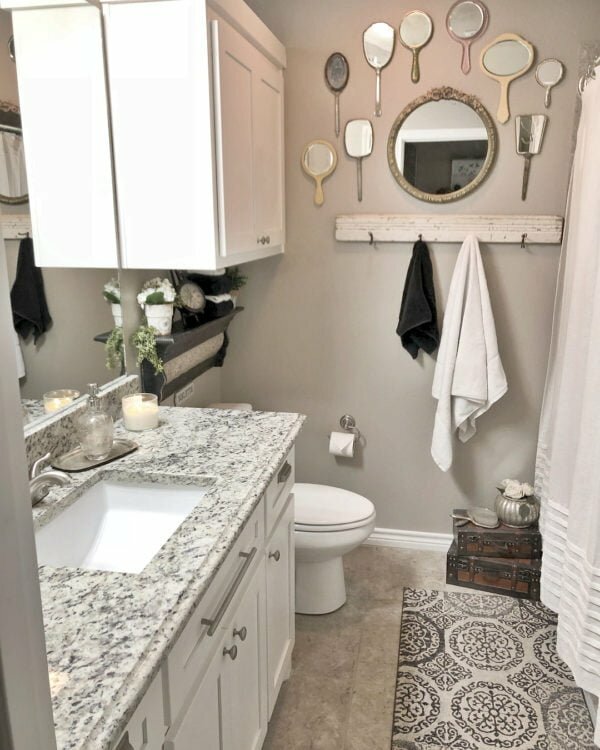 The exposed wall is covered in all-white wood planks and enables the dark hardwood countertop to get all attention along with the tasteful shower curtains placement. The vintage makeup stand with plenty of storage space, as well as the voguish metallic wall clock creates a playful and cheerful vibe of the room. Combining knitted, leather and neutral couch pillows create a spirited atmosphere in the room, further focusing on the strategically placed tall and black-frame mirror. 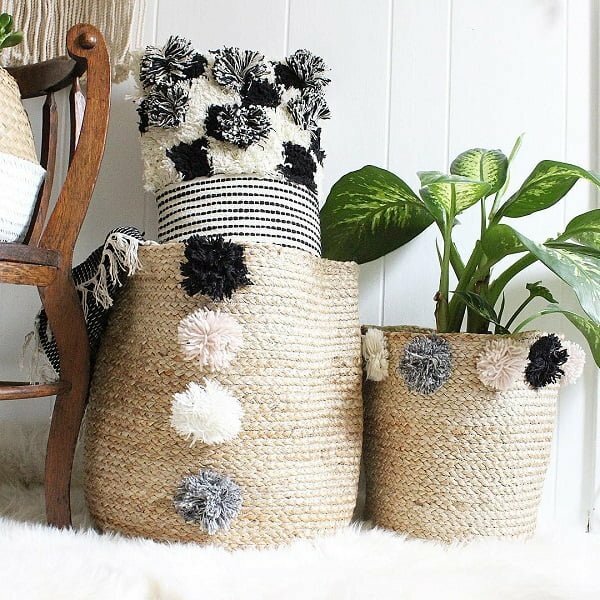 It doesn’t take much to introduce cheekiness into an all-white setting, and you can do so by matching fuzzy and knitted pillows, storage baskets and mats. Go for it! The single, spacious sleeping bed combines navy pillow patterns also seen on the cleverly placed udner-the-window reading bench. Tastefulness perfected! The floating set of wall shelves speak of practicality and a clever use of space, while the traditional dining table and office desk make the room multi-purposeful! 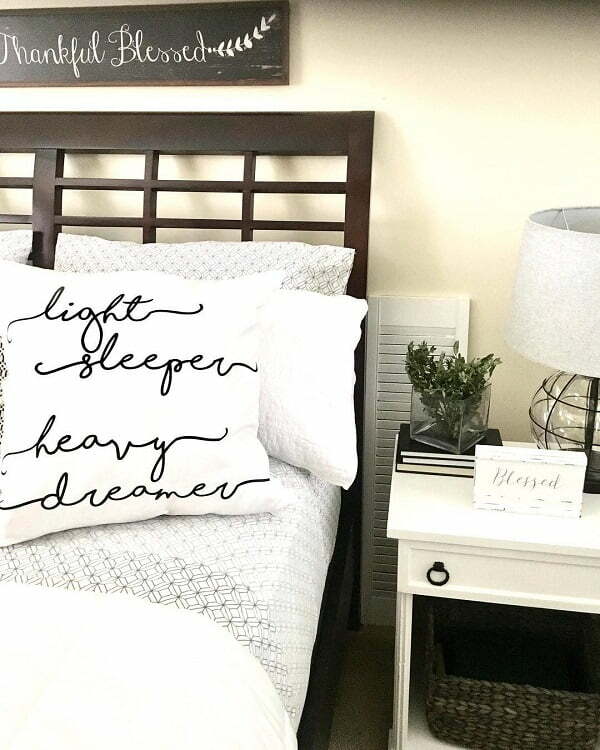 The handwriting pillow pattern gives out a romantic note of the setting itself, which works well if you take a look at the dark hardwood sleeping bed and patterned bed covers. With a play of all white walls, warm brown bed pillows, and black wood baby crib, this room introduces a modernism improved by a million. The navy bedding is an intelligent choice and matches for the ethno-patterned black and white carpet and single glass door display cabinet. The contemporary approach of this design manages to mix the Victorian hallway window with the chandelier-printed wall frame and chic beige couch extremely well. The en-suite kitchen connects to the sitting area, while the room is enhanced with grey walls, all-white kitchen, and comfortable armchair. A statement well done the proper ways! The pink curtains make the perfect pair to the floral four times the framed artwork and the bright white wall. What a better idea than using an emptied brick fireplace as the best shelf stand ever? 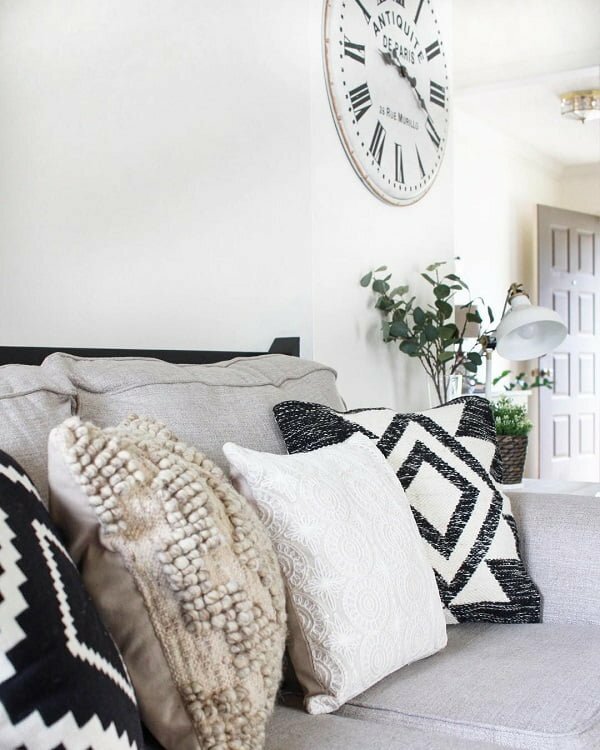 Add a cozy armchair to the equation and you have yourself a winner! Create an unusual room design by combining elements such as a retro chest-turned-coffee-table and modern LED flashlight lamps.It works! This little decorative corner uses half green-half beige walls which resemble a classroom-like feel, with the perfect collage of wall signs being a great addition to the atmosphere. 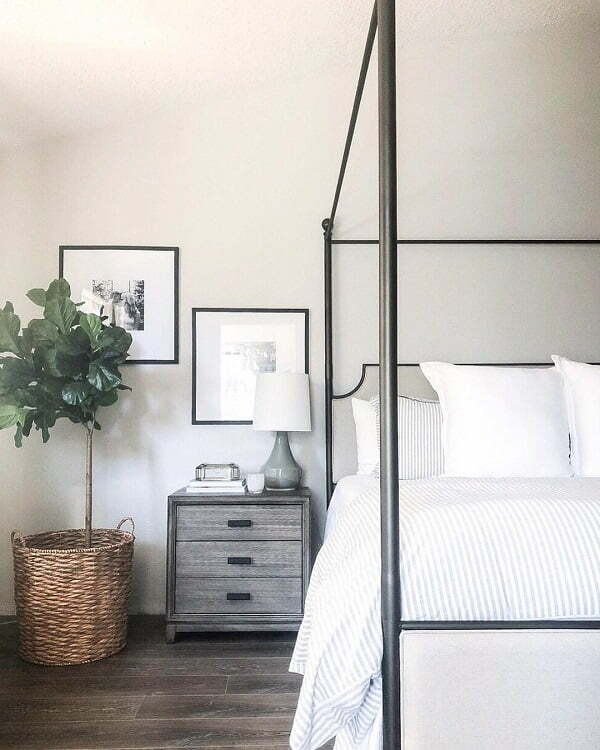 The contemporary empty photo frame wall collage is crеating not just light and space in the room, but also leaves plenty of space for the tall custom-made bed to shine in all its glory! The side glass-door cabinets allow the wood wall and in-built shelf to create room and dynamics of the setting, accentuated with a signature ivory marble countertop. 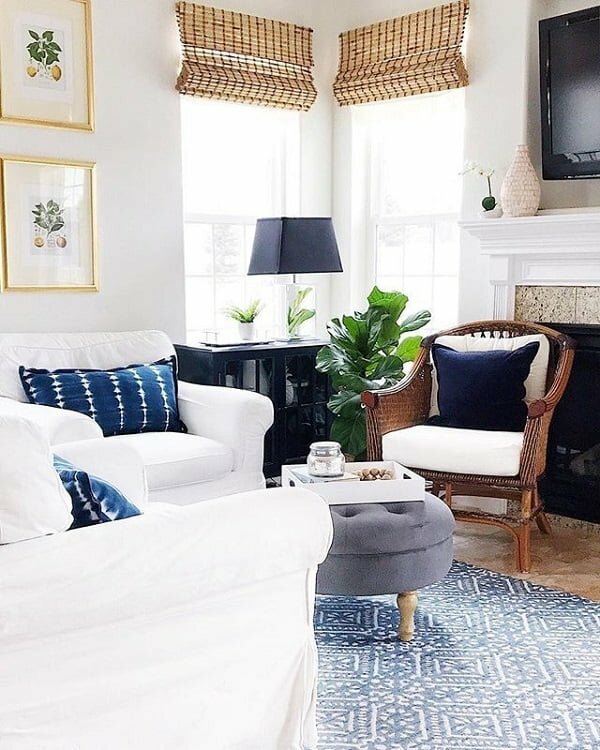 If you care to introduce plenty of light to your living room, try using various printed blue pillows, a dramatic set of bamboo-made curtains and neutral furnishing elements. 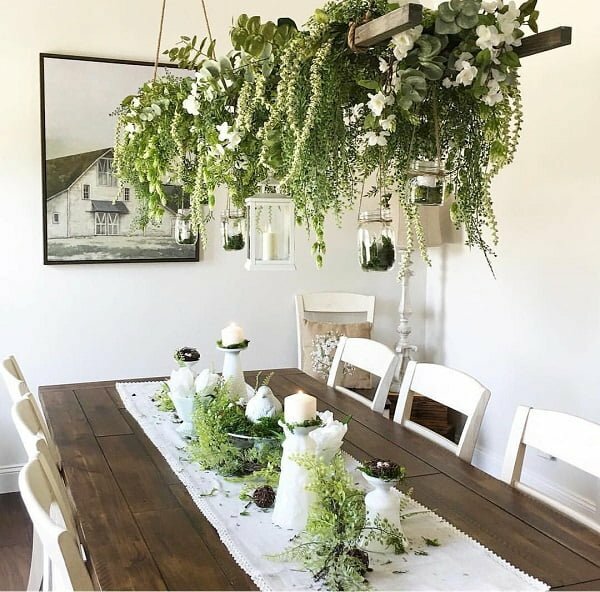 When life gives you plenty of whites, such as the hardwood walls and romantic dining set, use an unconventional cream chandelier and a handmade fruit bowl to deliver a speck of color. Creating a jungle-inspired feel of the room is achieved by introducing a vine intertwined ceiling lamp, which matches the rural wall painting tremendously well. From the half-wood-half-iron sitting bench to the boho white couch with printed pillows, this setting relies on class and chicness. 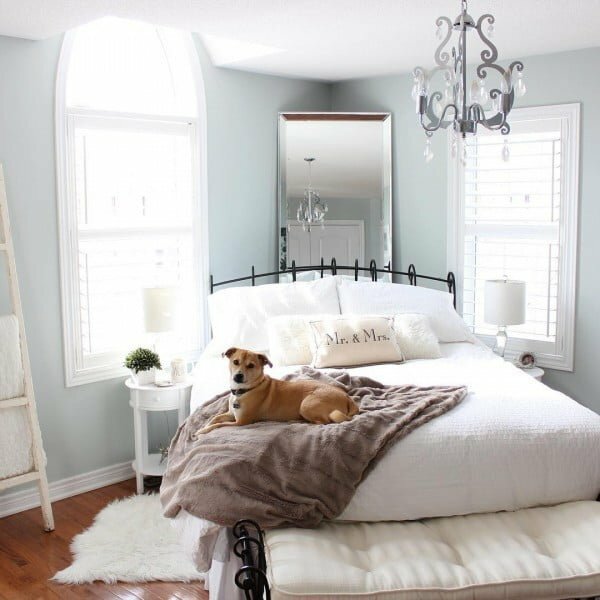 The simplistic yet astonishing white room, uses a few hints of color, such as the floral bedding and pillows as well as the fuzzy brown carpet. The soft brown tones of the downstairs door and staircase carpeting match the physics-inspired metal chandelier and amazing photo wall collage. 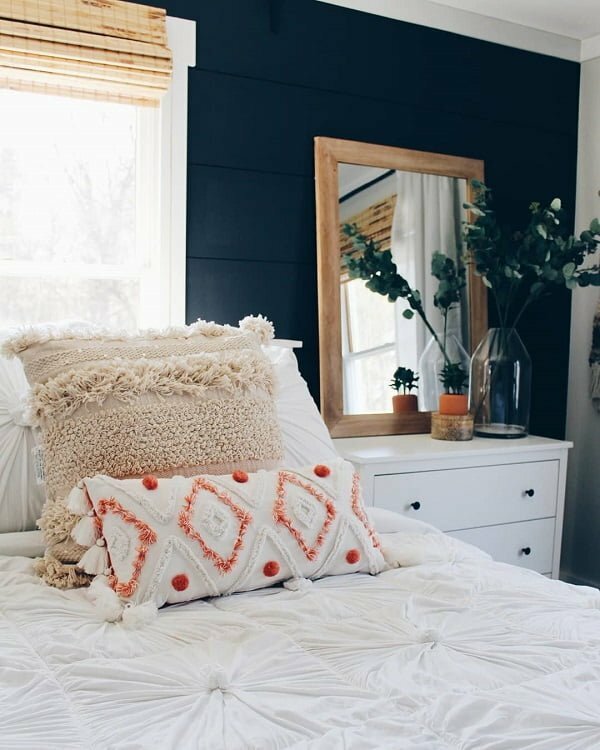 This bedroom introduces rarely used orange decor details, found in the adorable bed pillows and the precious flower pot. 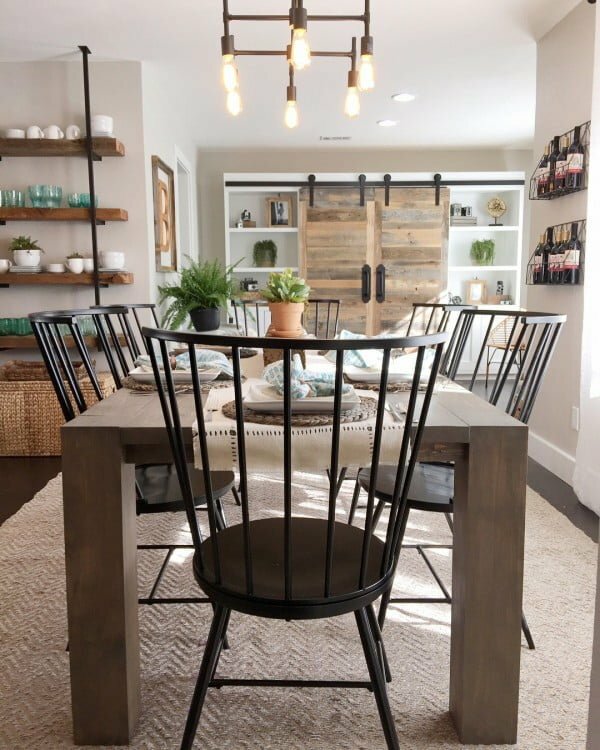 The enticing labyrinth-like white closet adds energy to the room, while the four rustic green chairs and practical dining table add a hint of romanticism. 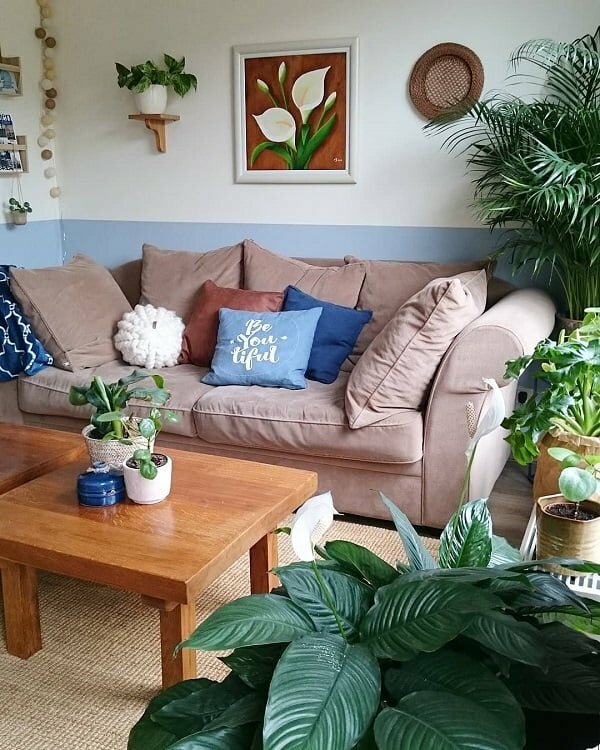 This magnetizing setting is all packed in a semi-small space but works amazingly, thanks to the camel couch, blue pillows and the two coffee tables set. This perfect living room is not only spacious enough to hold a massive wood-iron table and a comfortable eggshell couch, but to use black-and-white shades to give the space an Oomph! The romantic, yet modern black and white dining room set is a great addition to the metallic and hanging ceiling lamp as well as the secluded green stool/stand. Another all-white living room design demonstrates that simple greenery crystal vases, small wall paintings and unconventional night lamps actually do wonders! Combine light tall grey stool planks and contemporary light bulb lanterns, and you will create an inviting and pleasantly moody room atmosphere like this one! The freestanding ottoman and tiny candle shelf are a great example that modern bits go exceptionally well with the retro vibe. The decorative and sitting white wood bench gets perfect light from the spacious double set windows, while the lively green flowers introduce an energetic sense for design. The below-staircase corner is perfectly brought into the spotlight by using white plank walls, tiny wood hanger, and divine retro drawer.